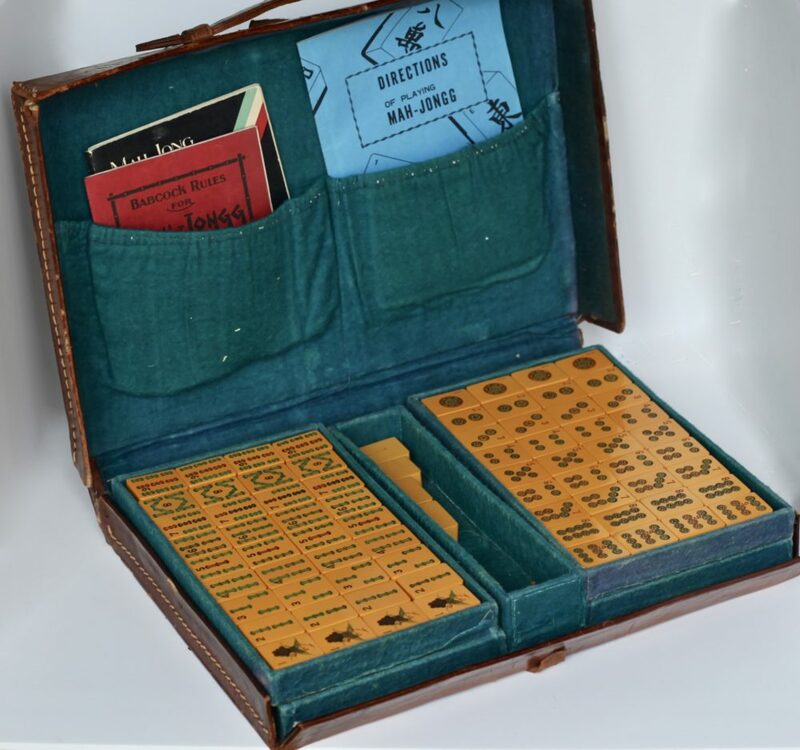 My Collecting focus is on vintage sets. 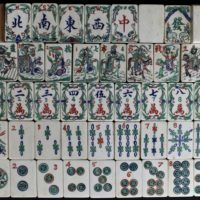 Rather than have many similar sets I have concentrated on finding those which have separate identities, defined by whether the box, the tile set design or the material of the tiles is uncommon. 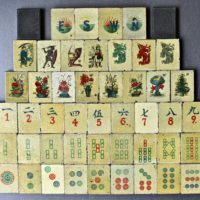 Whilst I do not have a huge Collection I like to think that the variety of both tiles and their boxes makes it one of interest. 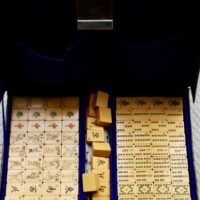 I also have a selection of European sets. 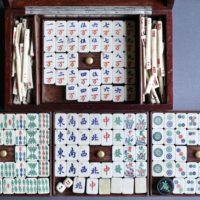 The variety of tile sets contained in slide top boxes known as “Ladies/Traveller’s” or sometimes “Children’s” sets, is greatly undervalued. 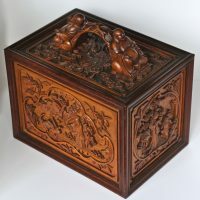 I have selected some examples of these sets from my Collection to illustrate the skill of the Chinese carvers. 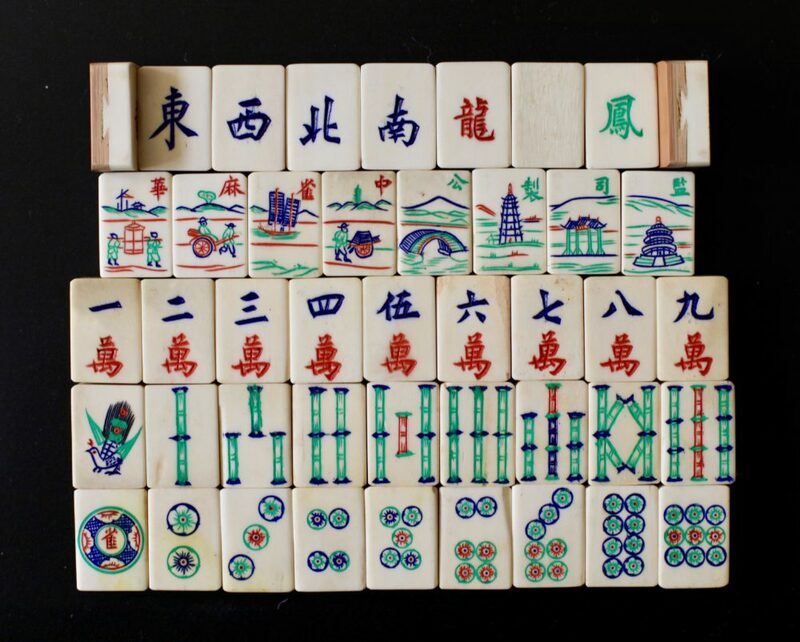 A bone and bamboo tile set. 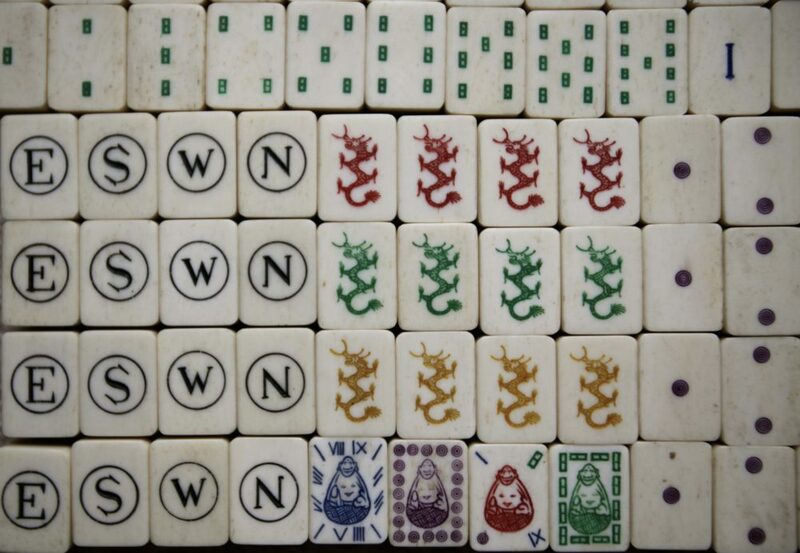 The flower tiles depict architectural features and the four symbolic animals-Leopard,tiger,elephant and qilin. 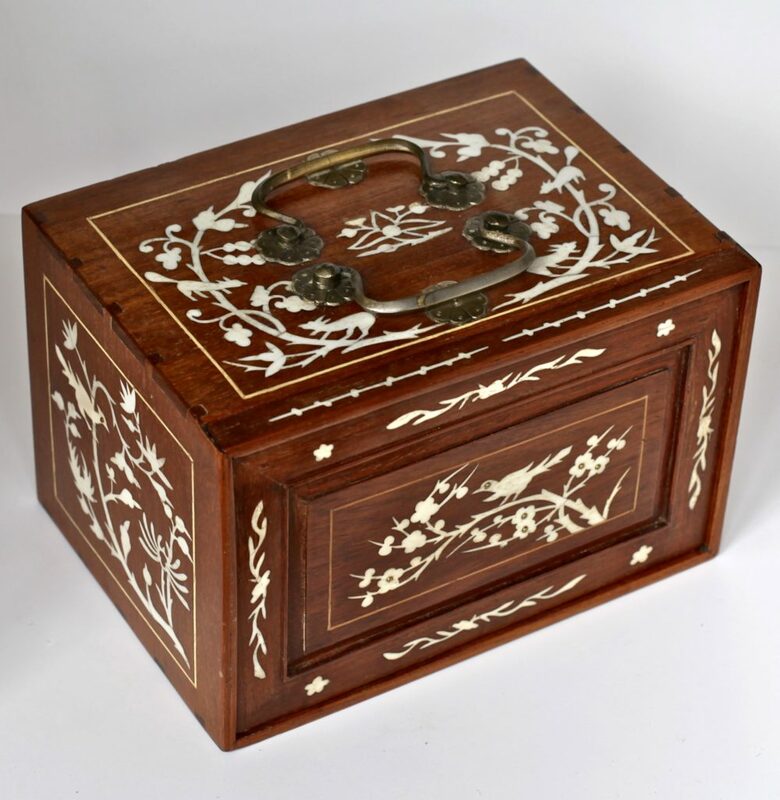 A sandelwood inlaid padouk box with bone inlay to the front cover. 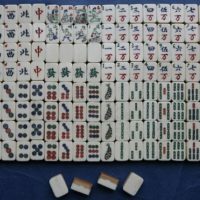 A bone and ebony tile set. 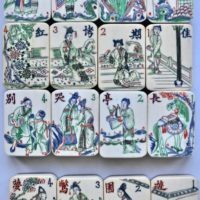 On the 'Flowers' tiles flower scattering nymphs from a Buddhist myth. 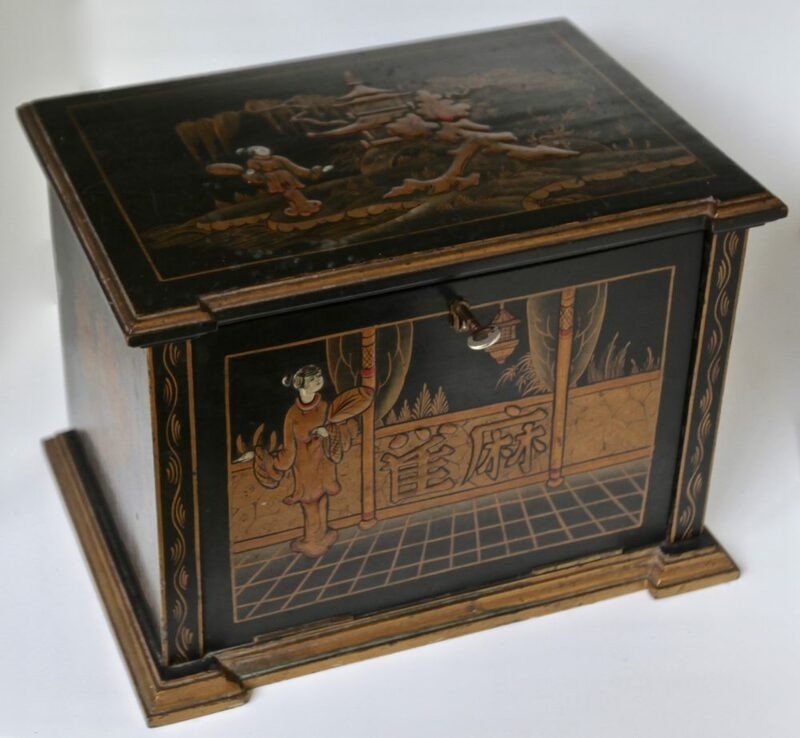 This is a multi-layer lacquered box depicting a variety of scenes on all sides painted in various colours and enhanced with gold highlights. 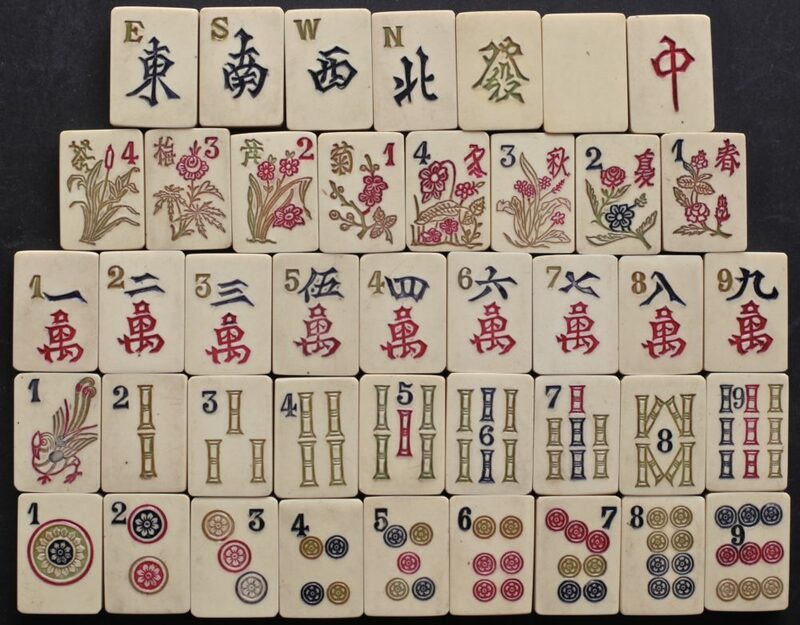 156 thick, bone and bamboo tiles depicting 16 fully carved Flowers tiles. 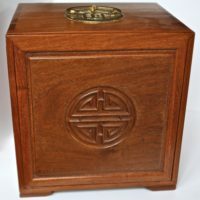 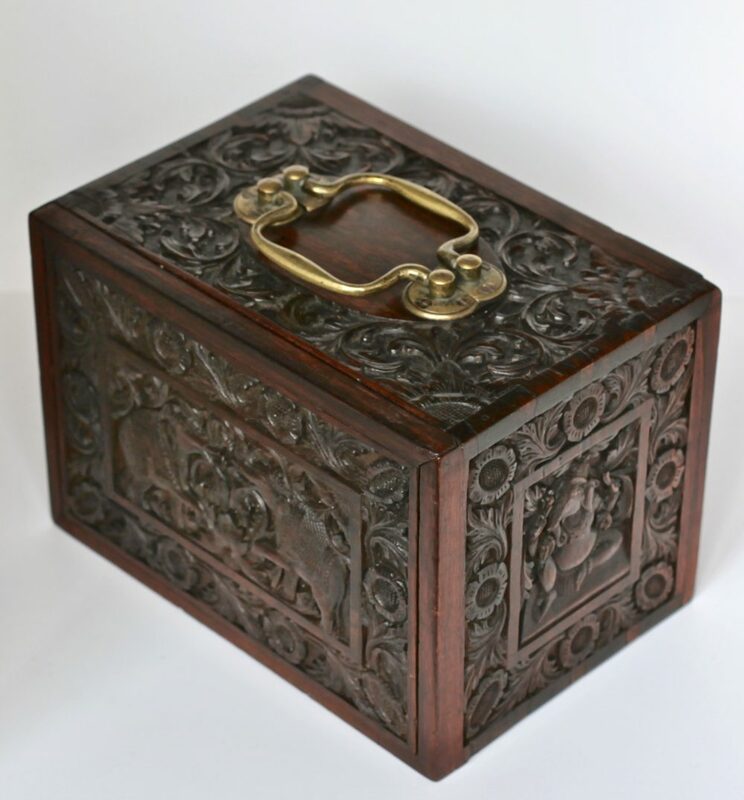 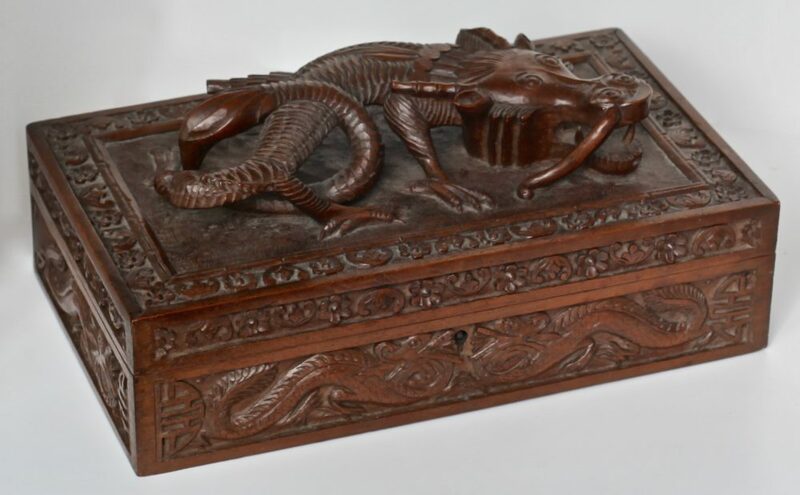 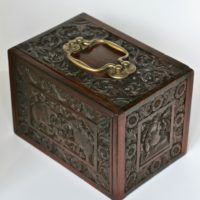 ‘Beautifully carved teak box with Buddahs' guarding each end of the handle. 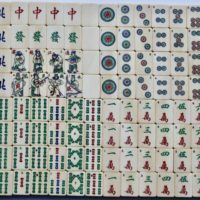 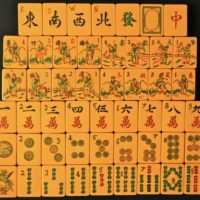 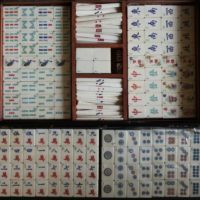 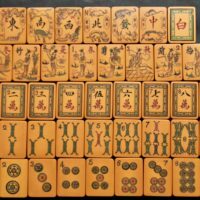 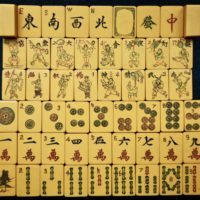 156 thick bone and bamboo tiles depicting scenes from the Wuchang rebellion in China, which led to the Xinhai Revolution and the end of the Qing Dynasty. 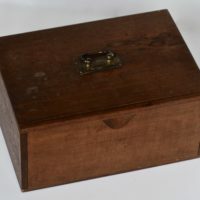 A modest and well used leather box. 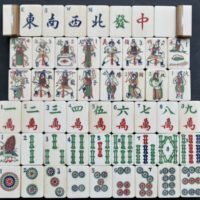 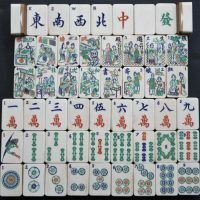 A beautiful and unique and almost fully carved bone and bamboo tile set. 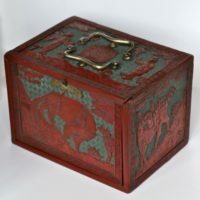 The 'bams' are intriguing, depicting a leopard or some other animal. 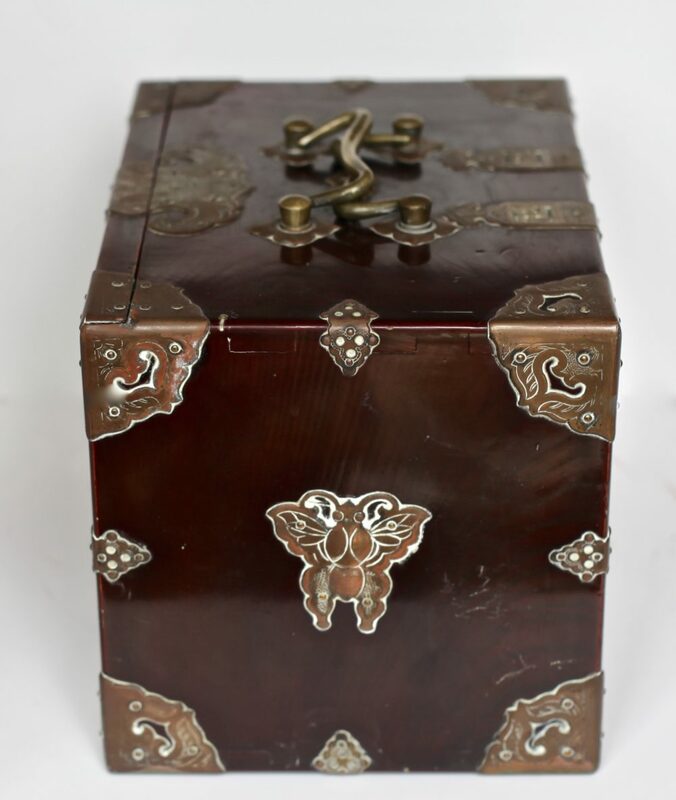 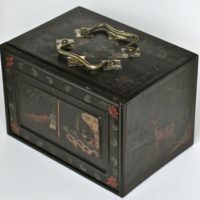 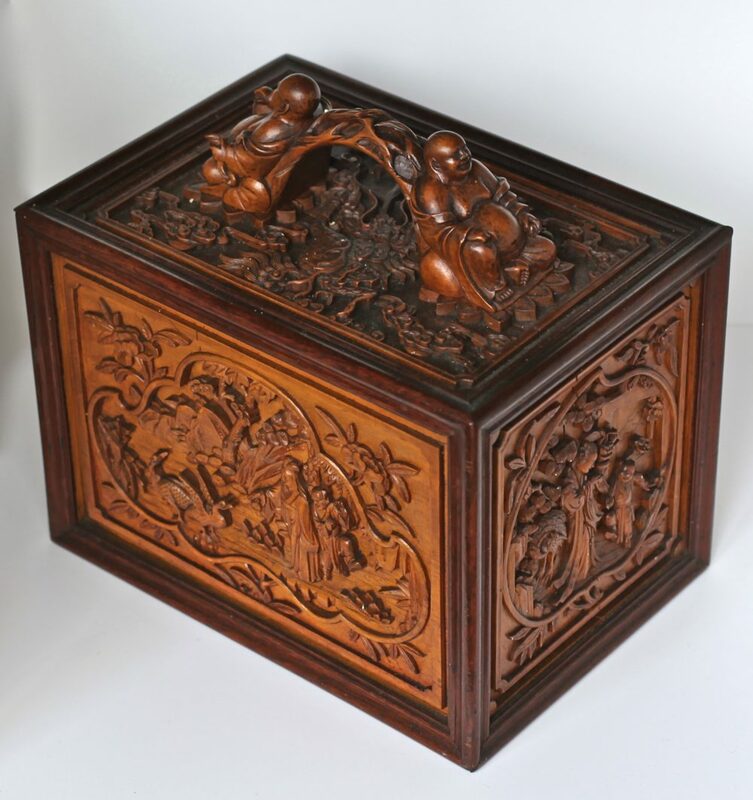 This box is intimately carved with elephants and Indian deities. 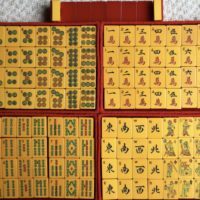 ‘A fully carved 'Chinese Bakelite' set depicting, amongst a variety of images, the Chinese Years using the signs of the Zodiac. 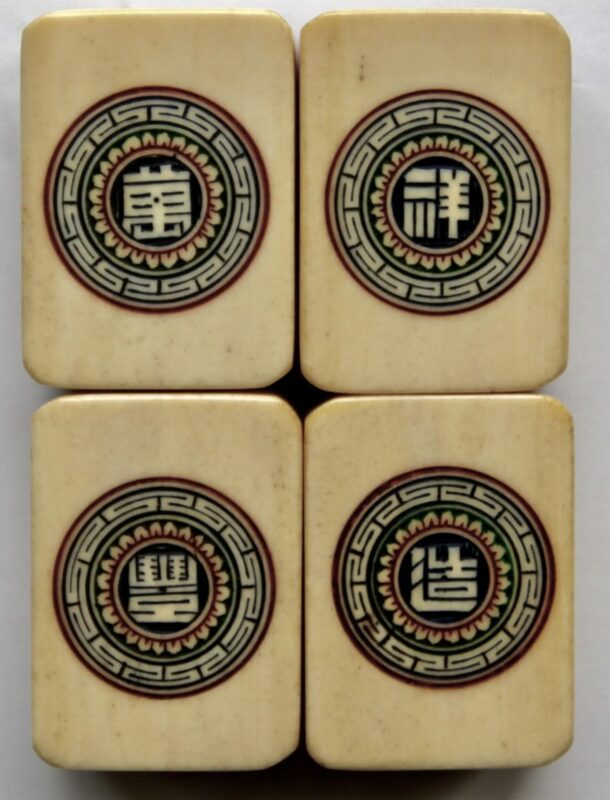 Ivory on Bamboo tile set. 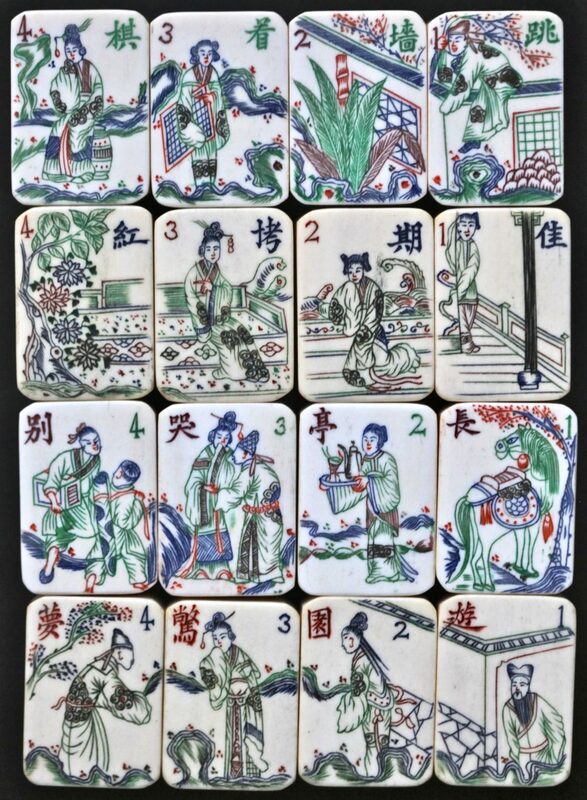 The flower tiles are expertly engraved to show sequences of scenes from China. 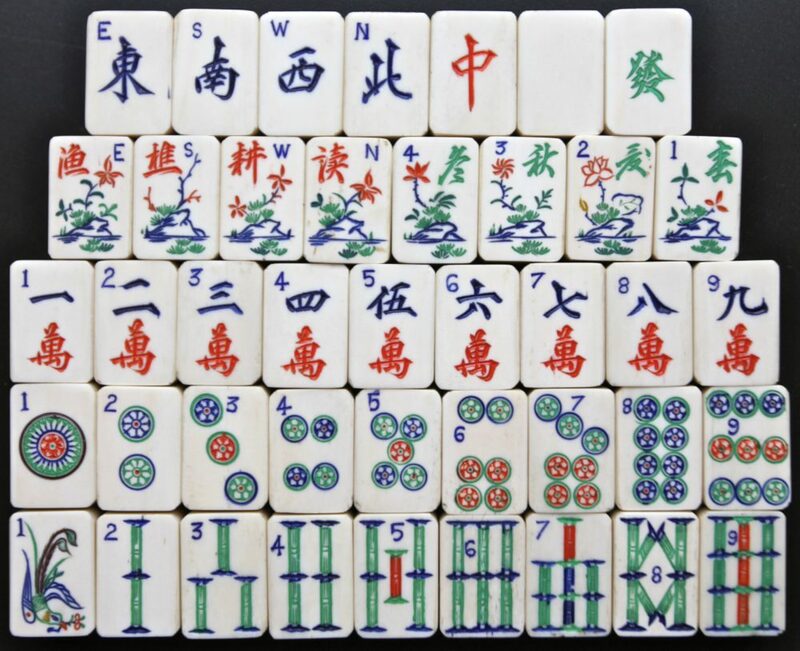 Reading the eight Flowers tiles sequence from R-L we have; 青山不老, 绿水长存 "The blue mountains never grow old, the green river flows on for ever. 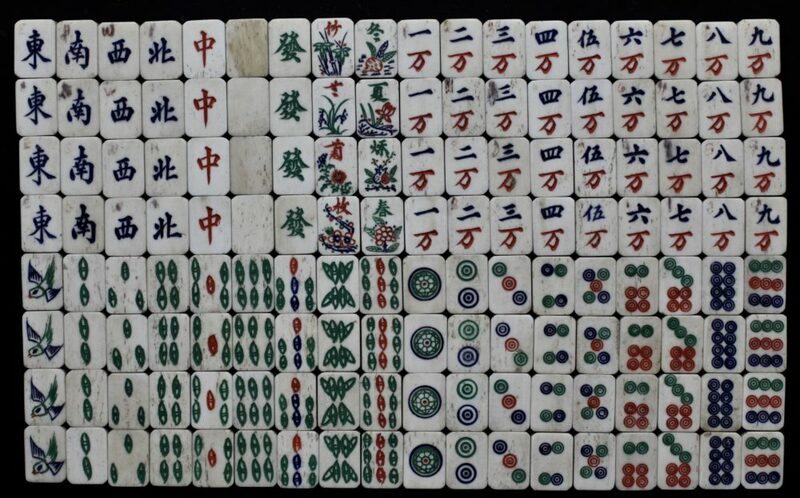 These signify infinity or, in this case, perhaps everlasting life or more pertinently IMO, “forever” as opposed to longevity, longevity still having a mortal component in it. A Mother of Pearl inlaid box. Bone and bamboo tile set depicting a container ship and a first world war bi-plane in flight, with exploding anti-aircraft fire. 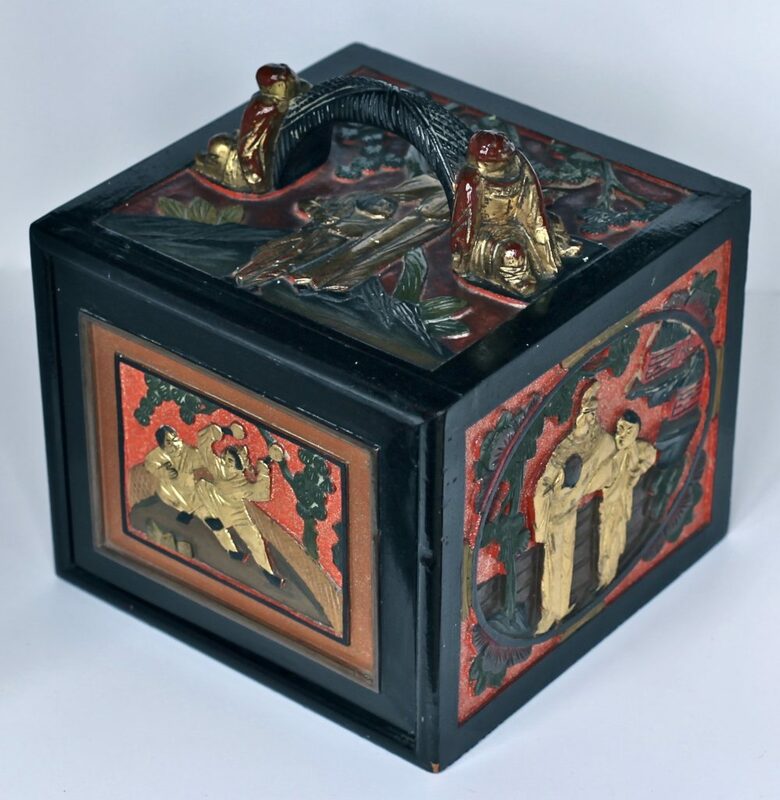 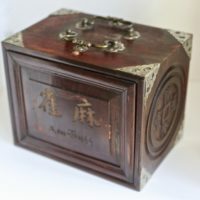 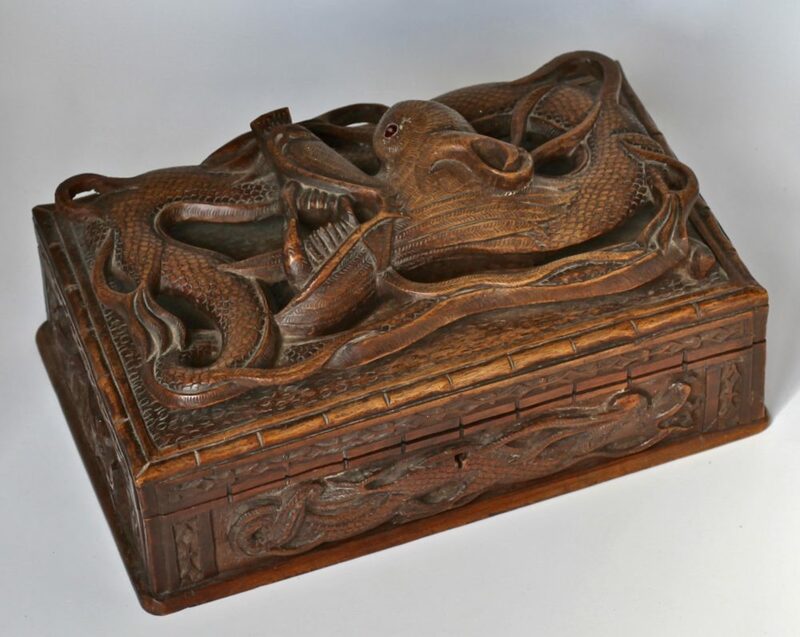 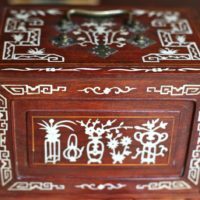 Carved Cinnabar box with Qilin and other symbolic images. 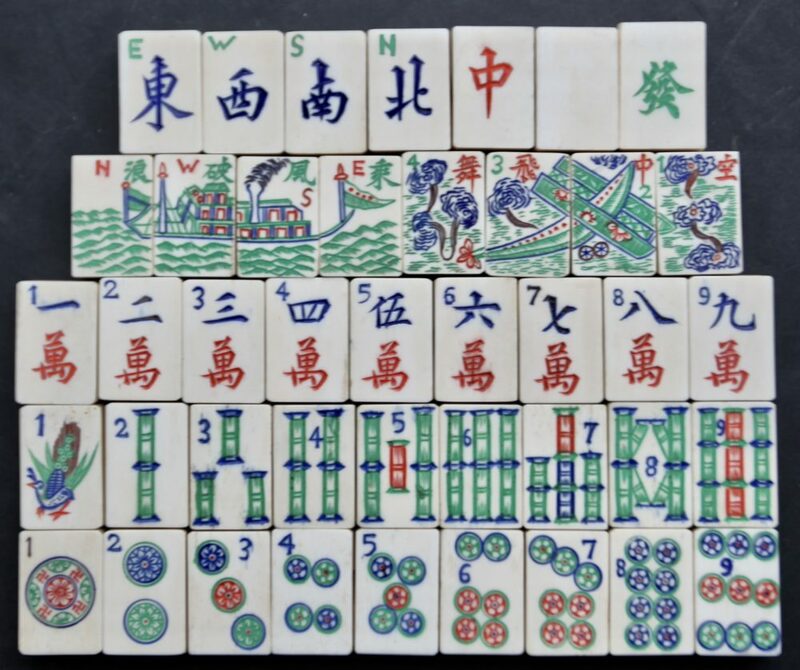 Thick bone and bamboo tiles with one of the flowers showing what seems to be a "flying Saucer" but most likely a Pagoda. 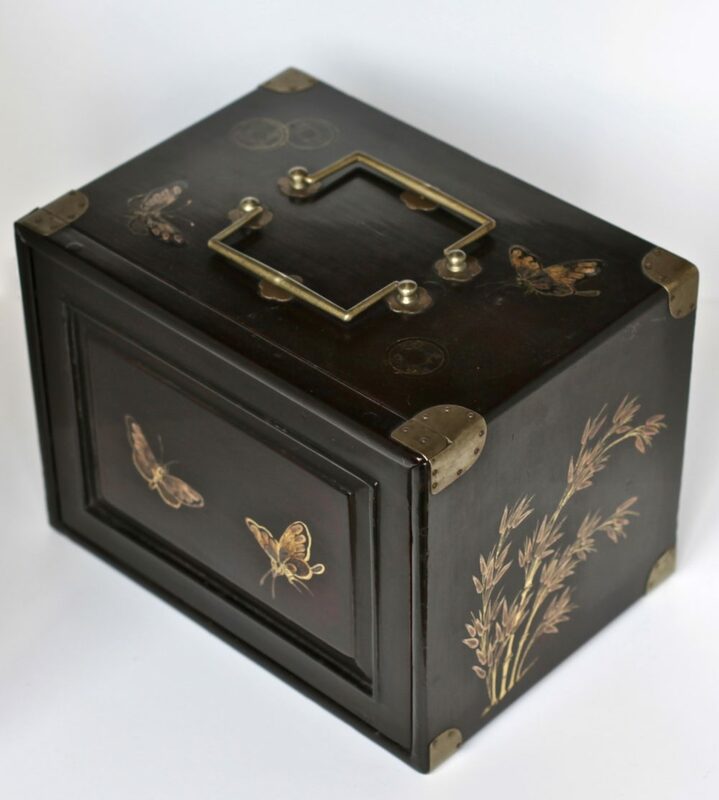 A lacquered box illustrated with Butterflies. 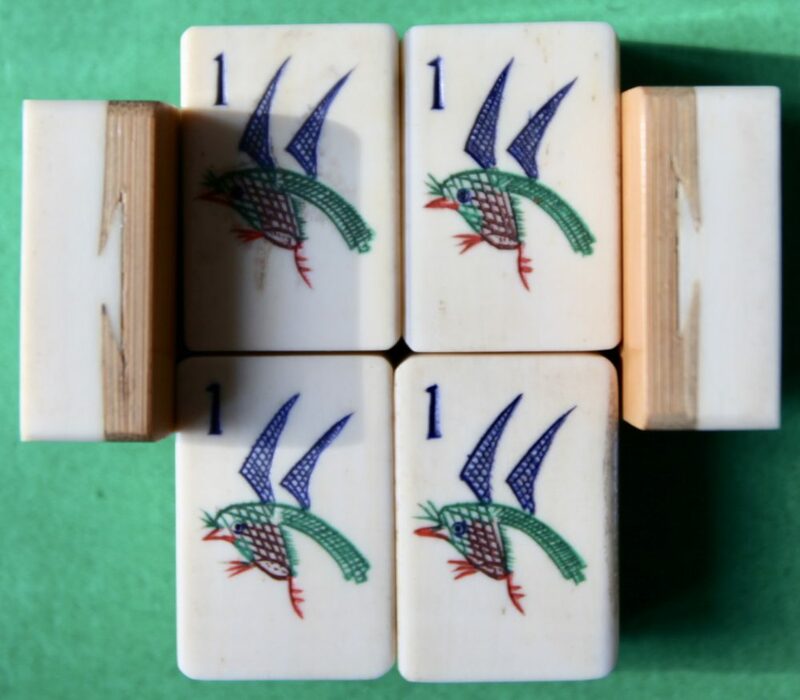 Smaller set of tiles with a most unusual Heron one 'Bam'. 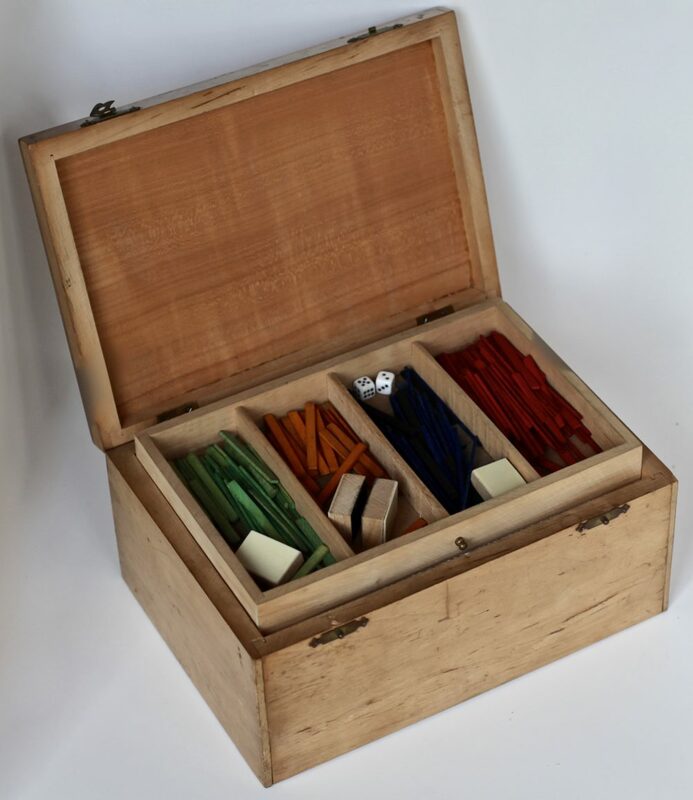 Multi coloured box. 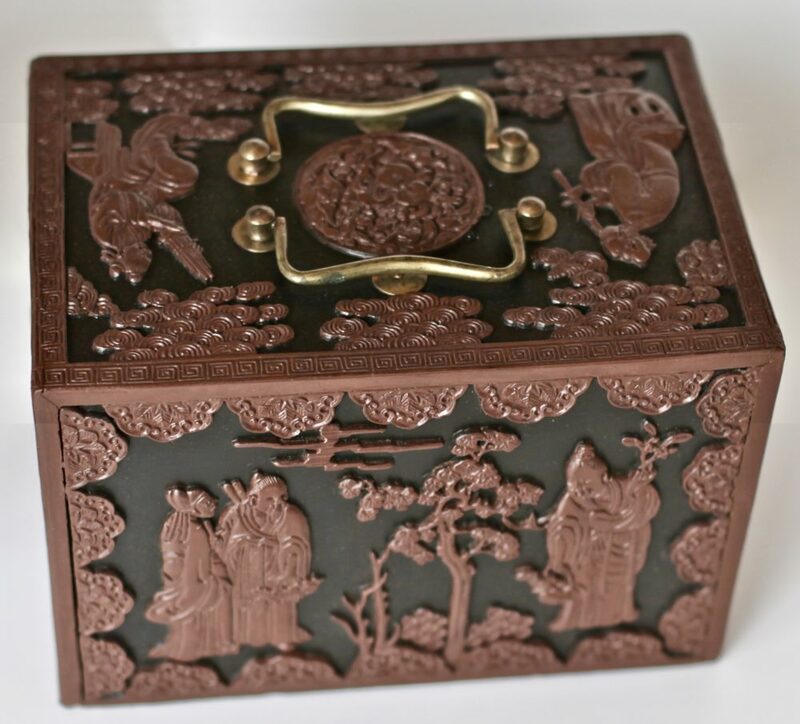 Ornate, exquisite decoration with a noble blessing in the top. 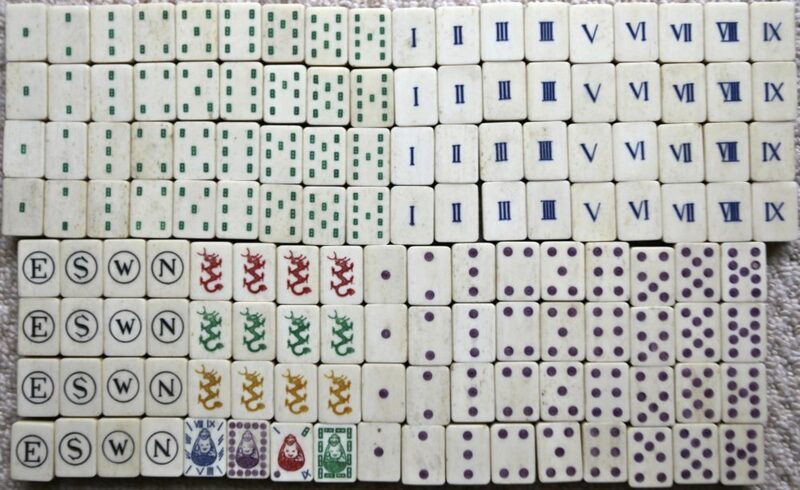 From R - L 福 fú and 壽 shòu, happiness and long life. 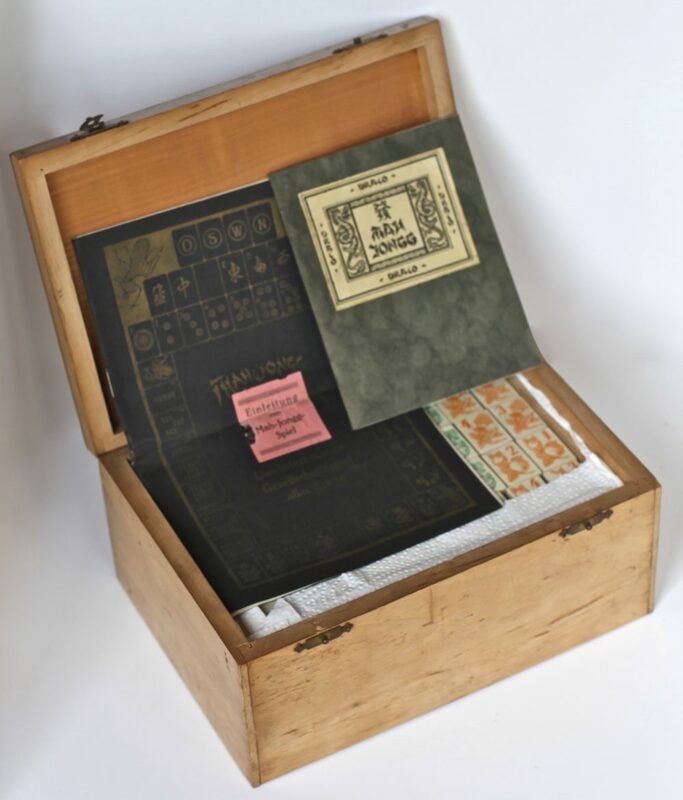 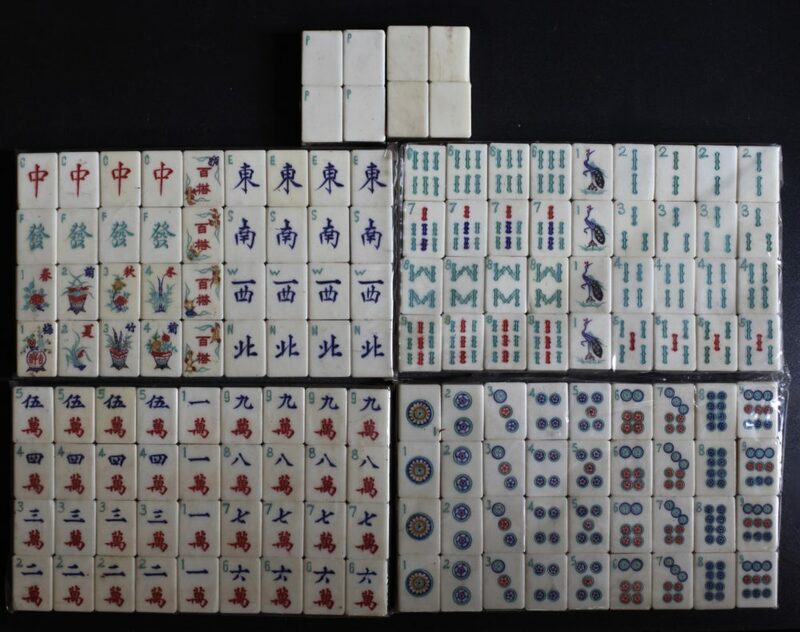 In both catalogues these tiles are described as the Company's "special De Luxe flower pattern"
This is a Mah-Jongg Sales Company of America cabinet. 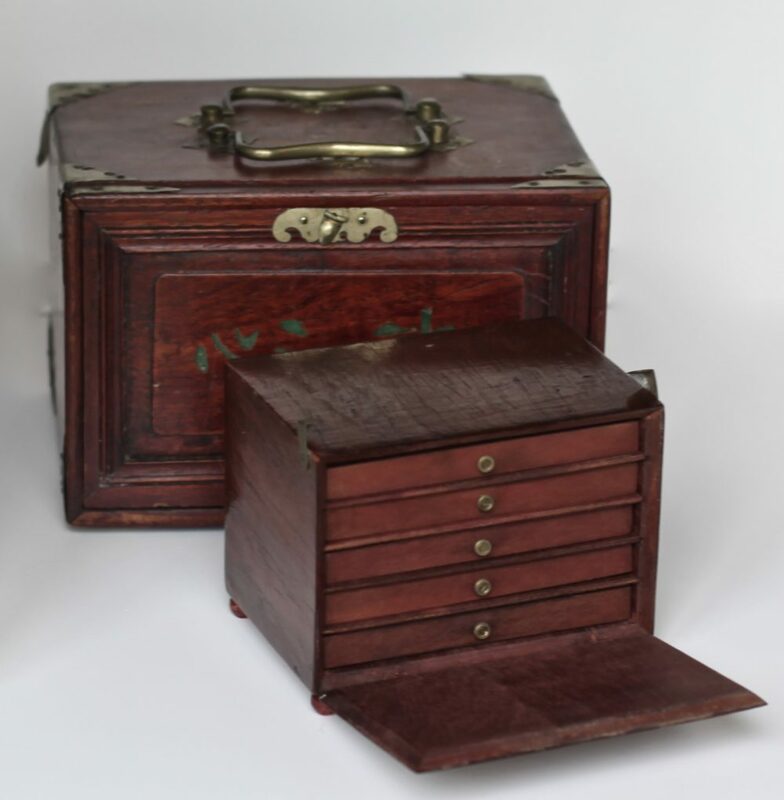 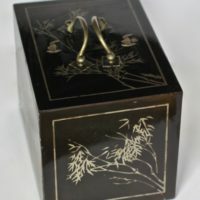 It features in both their 1922 and 1923 catalogues as a cabinet of Korean design, with two hinged doors opening upon the regulation five drawers, and secured by brass fastenings. 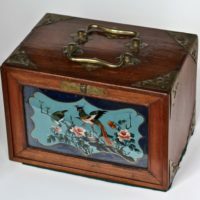 Phoenix probably carrying a peony. 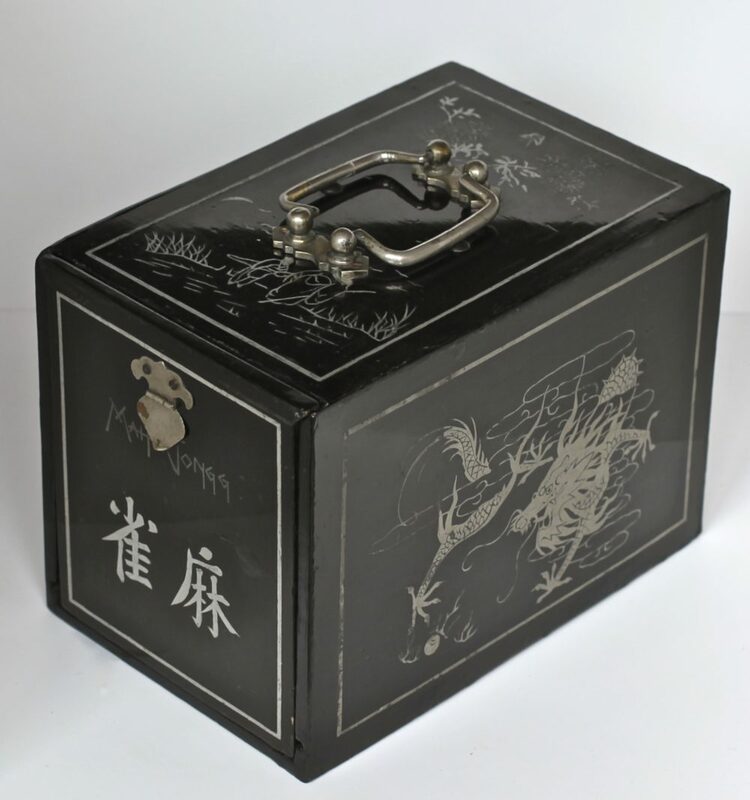 Medallion-shaped sinogram in the one circle. 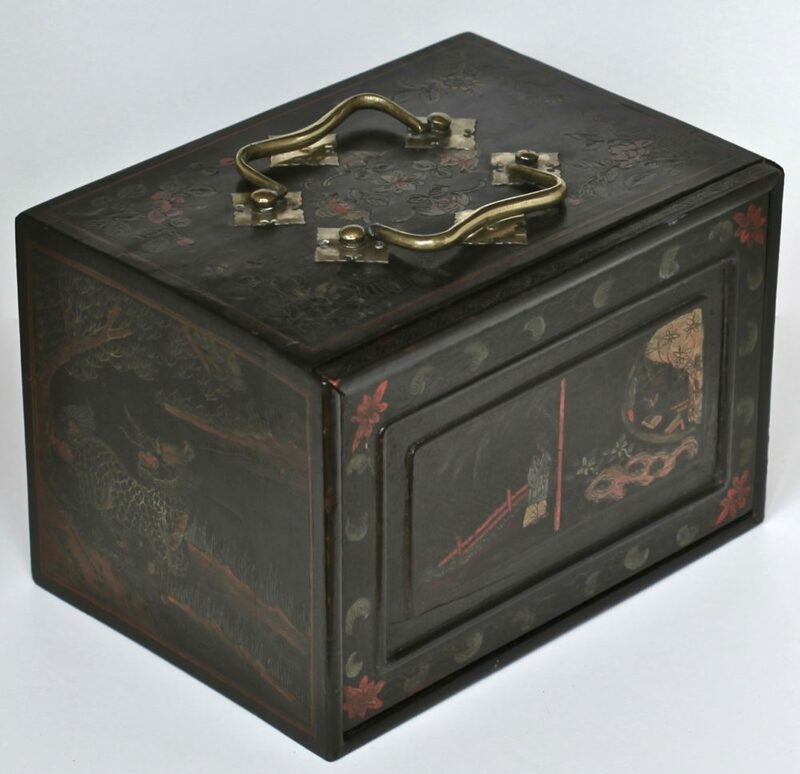 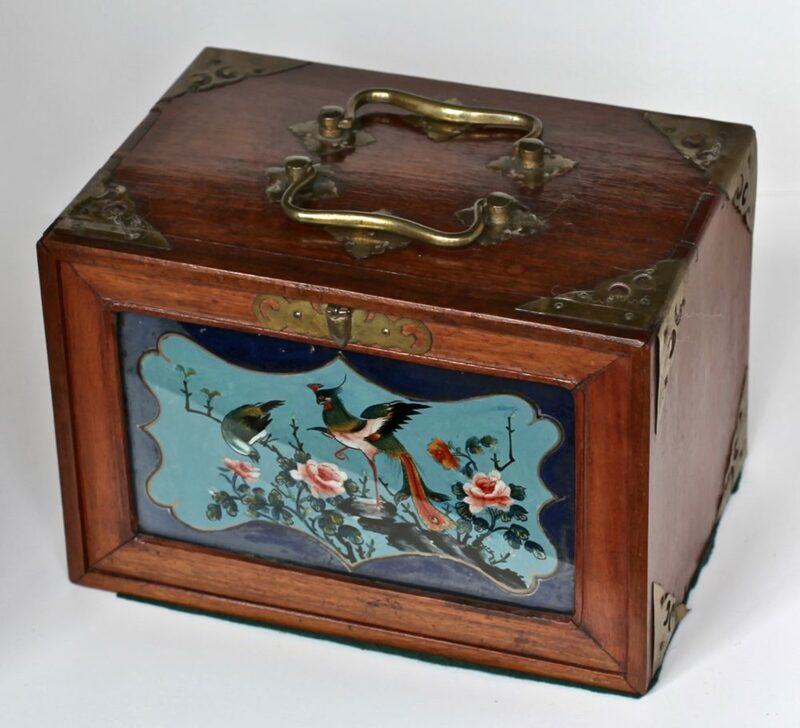 Beautifully decorated lacquer box depicting dragons,birds and flowers. 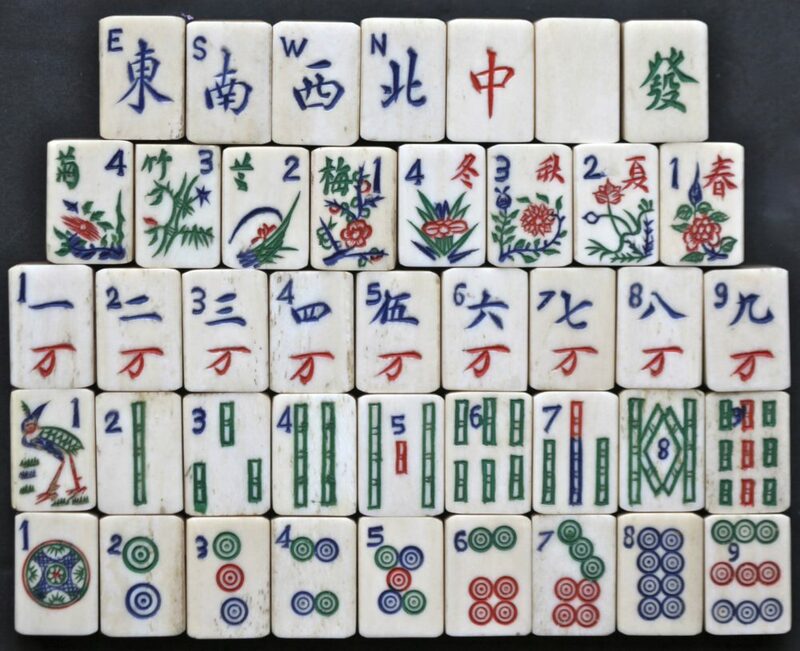 Bone and Bamboo tiles are interesting having the bamboo shoot one bam and the diamond 9 circles.The sequenced ship in the flowers is unusual. 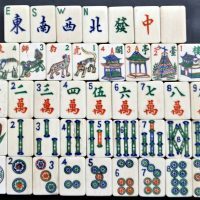 The tiles show a peacock on a stone. 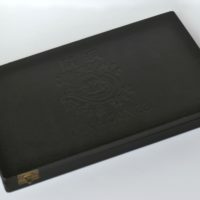 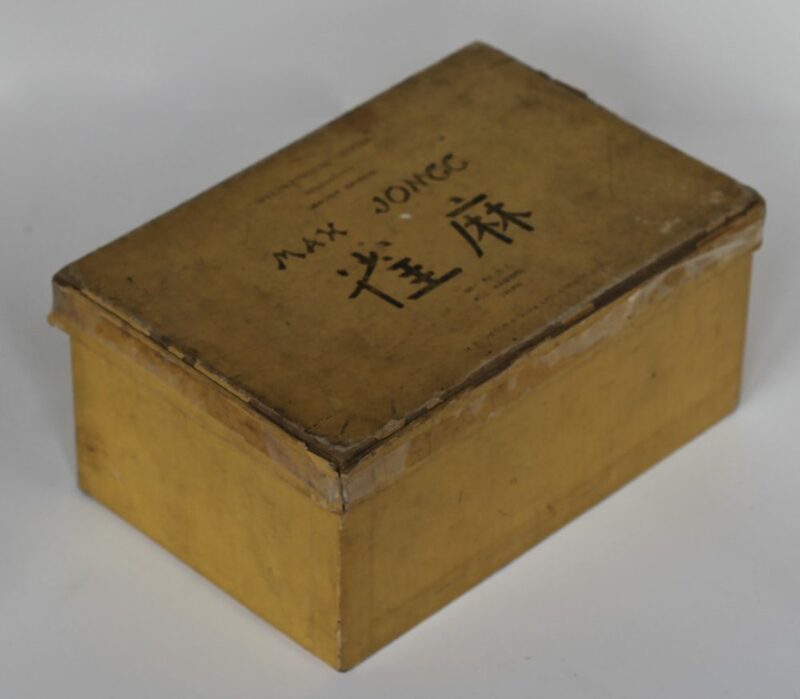 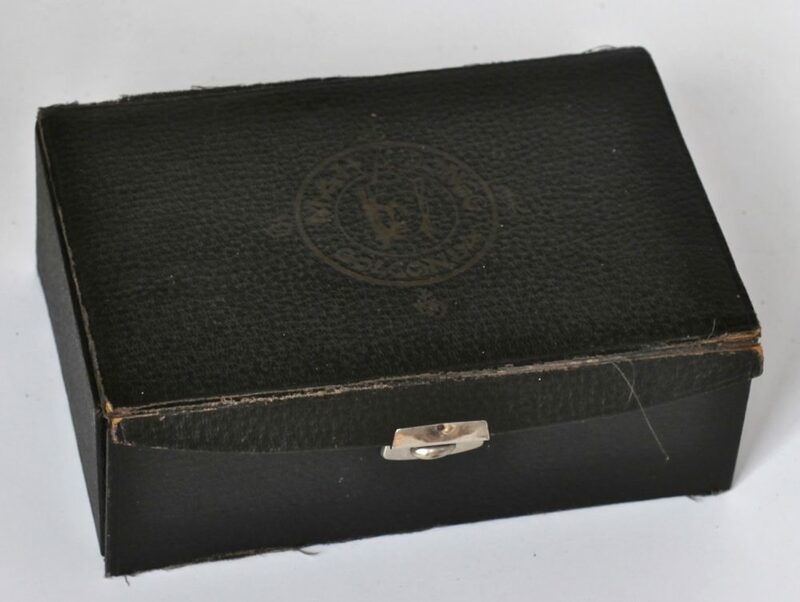 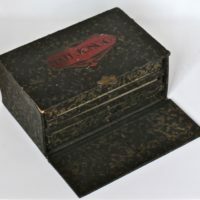 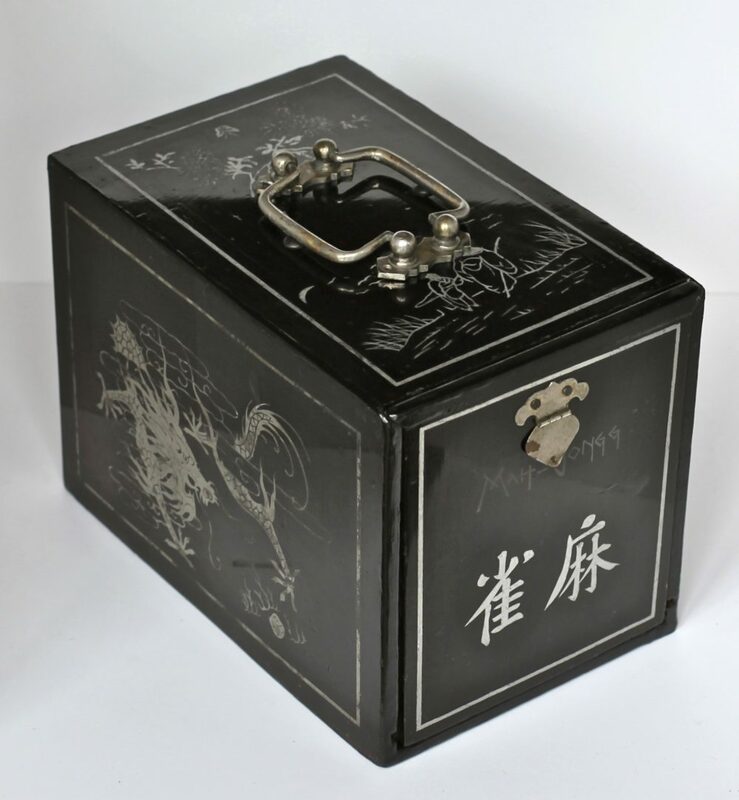 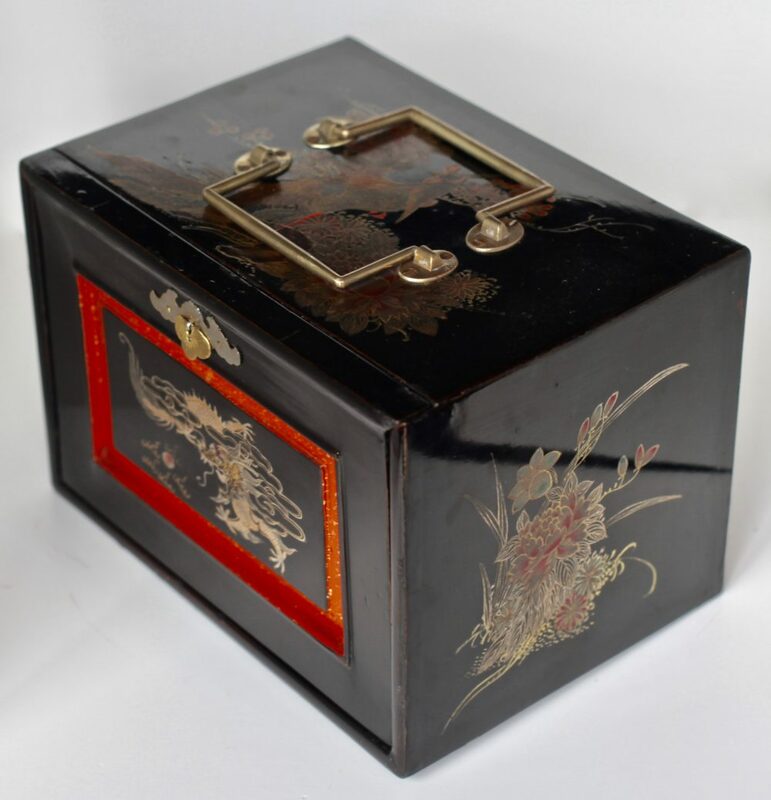 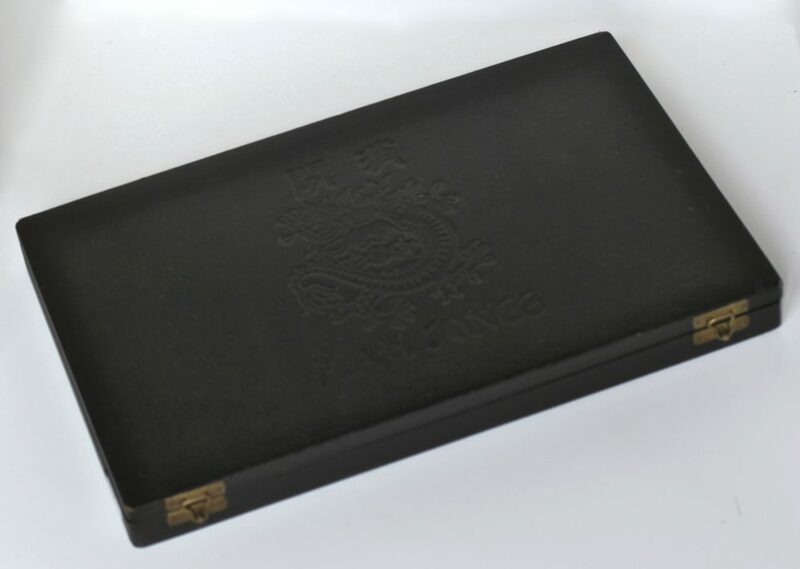 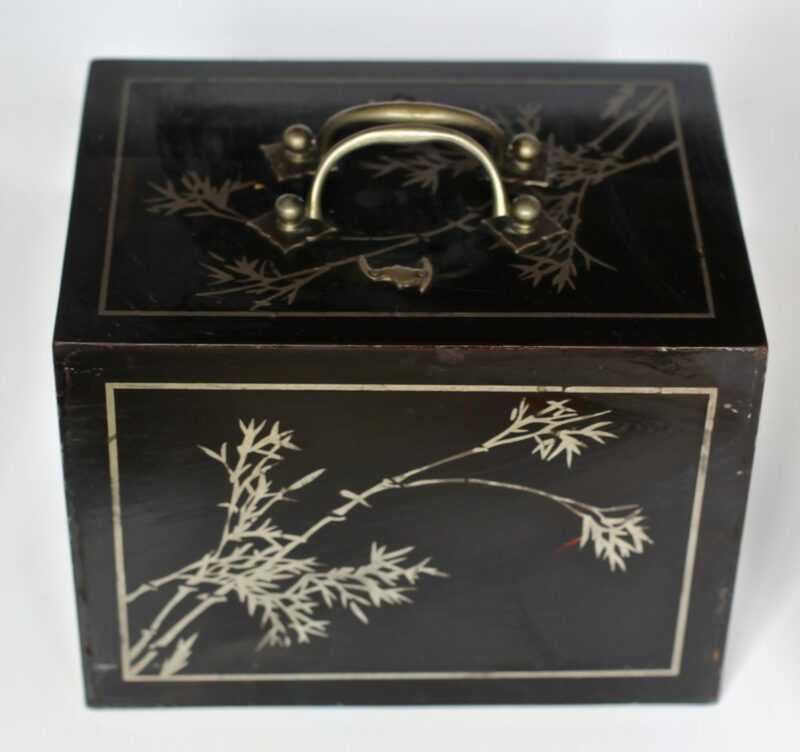 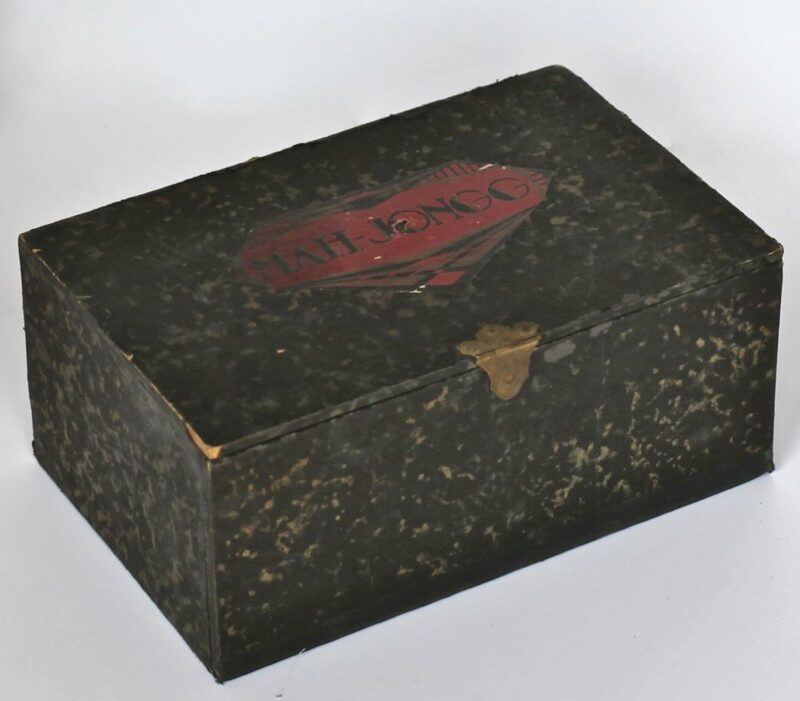 A front opening black lacquer box . 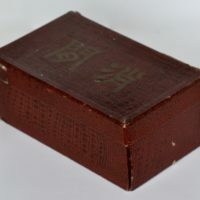 Right side view. A front opening black lacquer box. 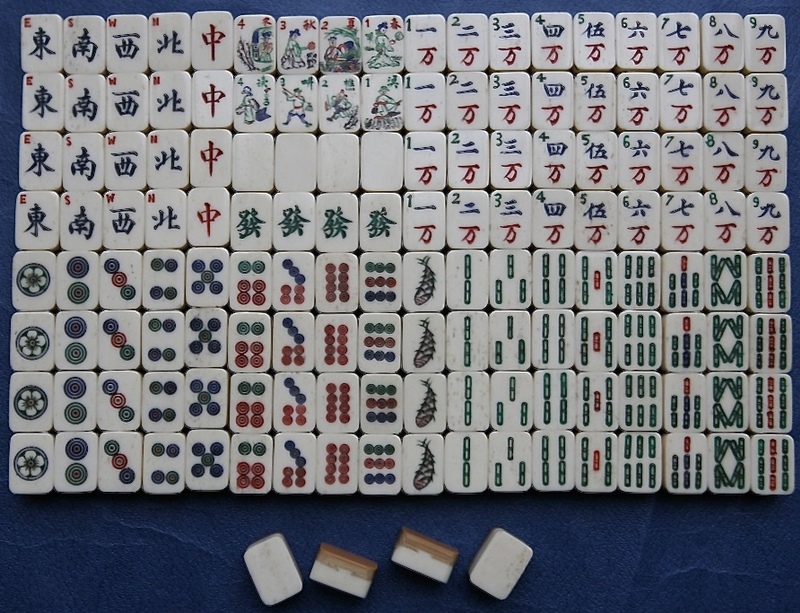 Left side view. 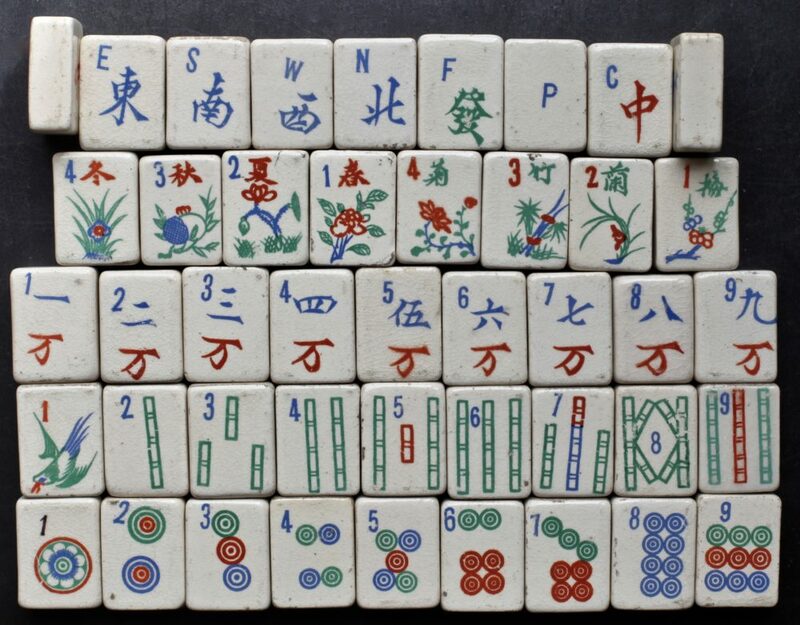 Bone and bamboo tiles with the Flowers each showing water, stone and flowers. 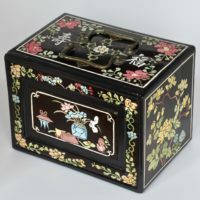 Phoenix with Peony on the one bamboo. 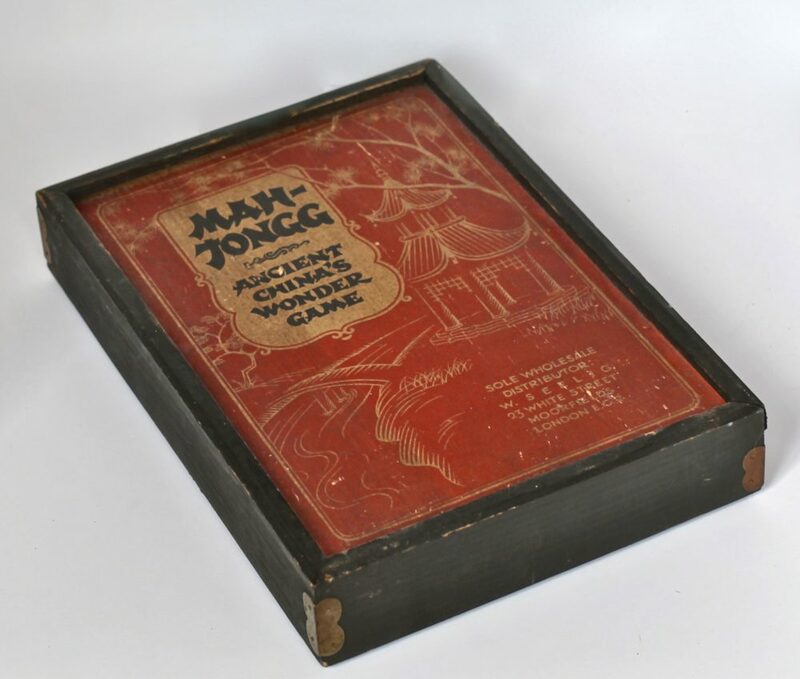 Reverse painted front cover on padouk box. 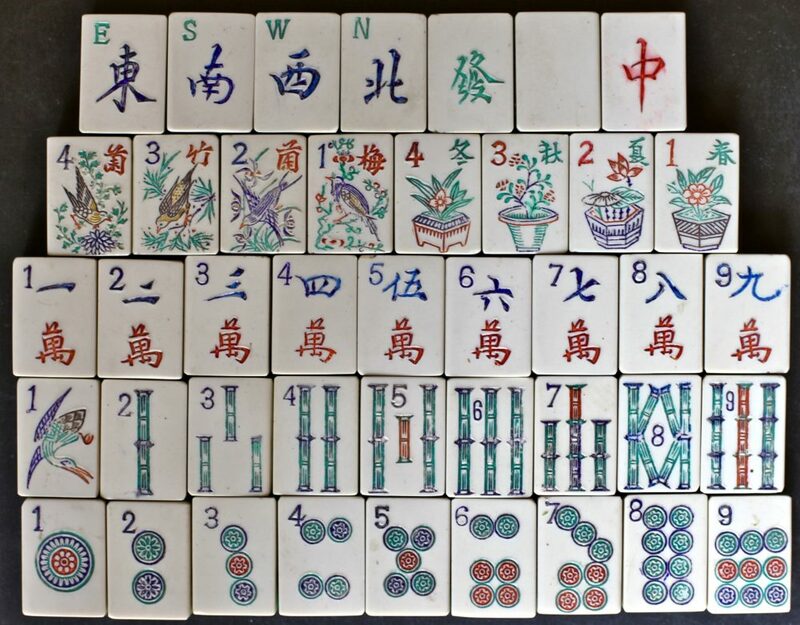 Tile set with flower tiles which are sequenced to form flower pots. 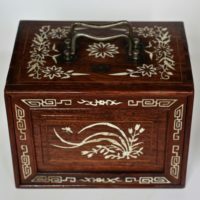 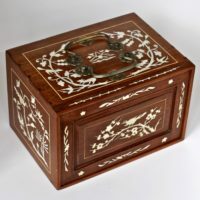 A box inlaid with bone floral designs. 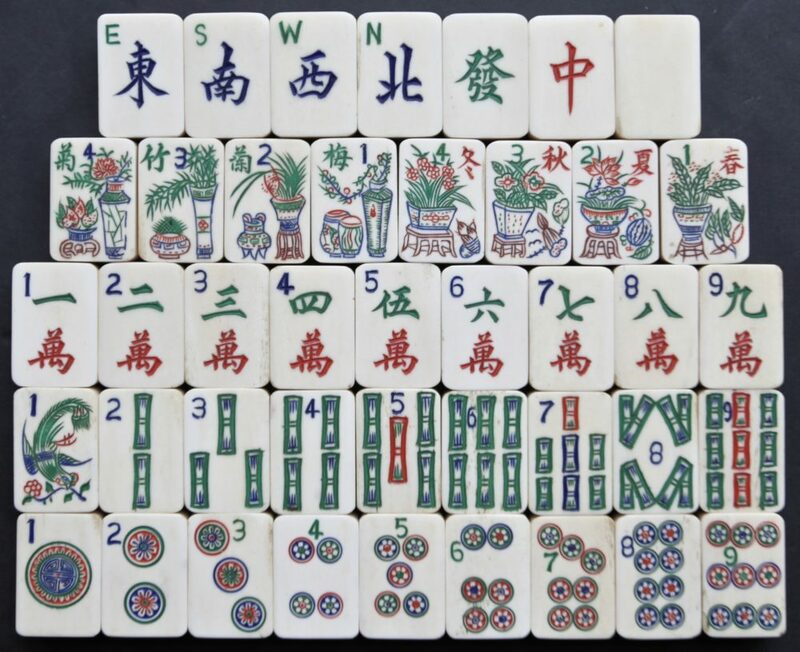 Very well engraved thick bone and bamboo tiles. 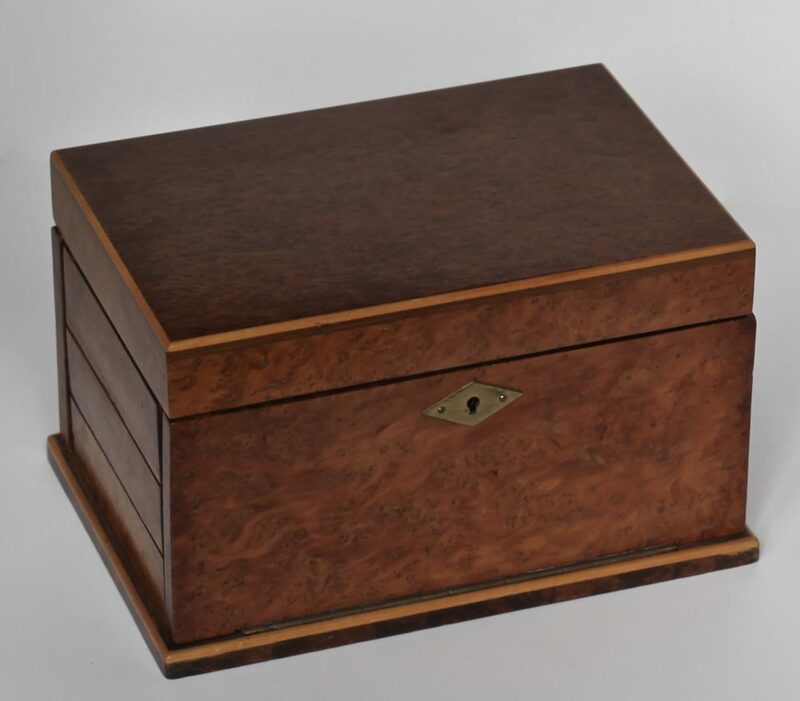 This teak box has an unusual feature in that the silk lined drawers all have their own covers. 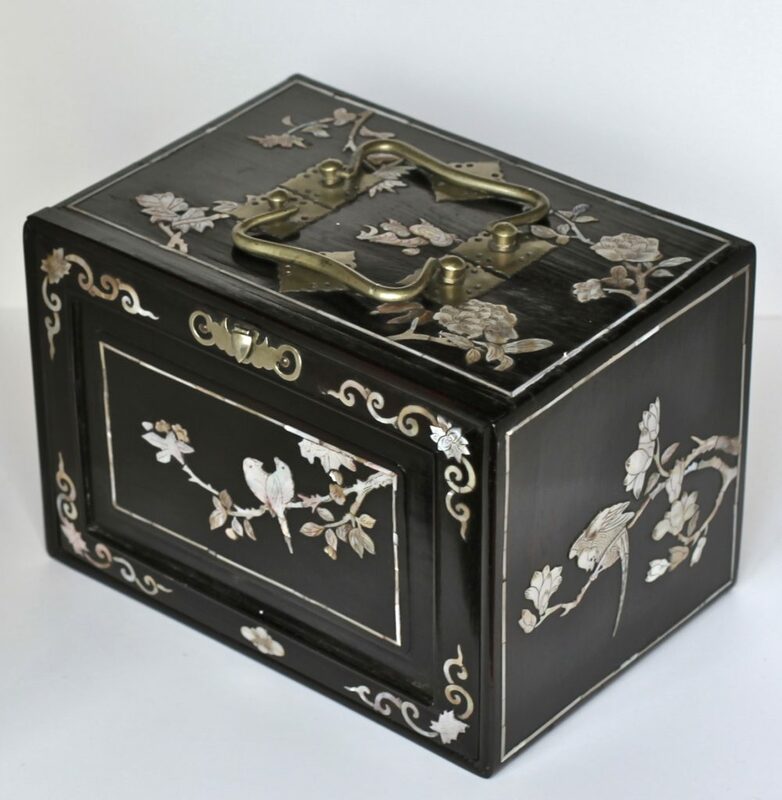 Mother of pearl on black buffalo horn tiles. 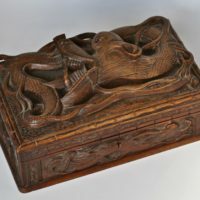 A raised Dragon box that probably started life as a jewellery box. 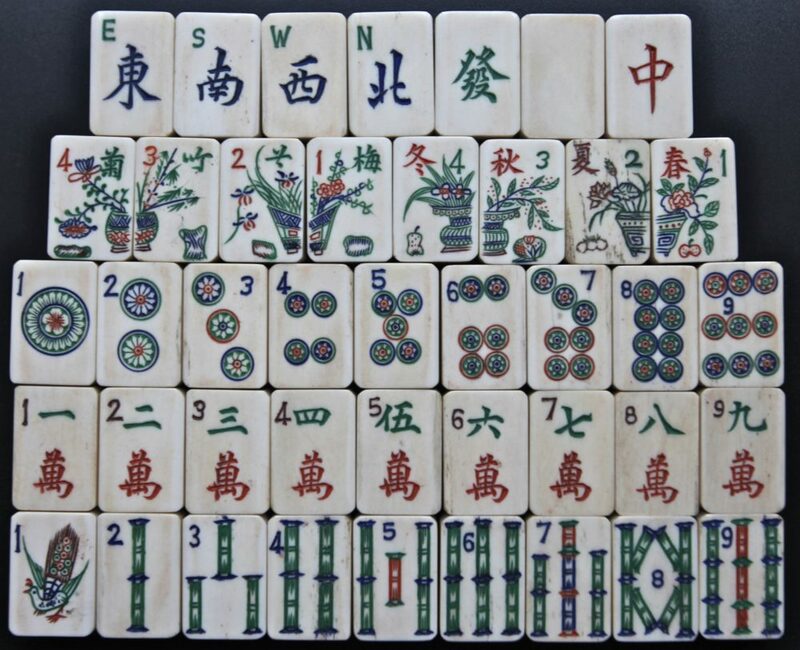 This tile set features bar-bell shaped bamboos and the legend of the hidden city in the flower tiles. 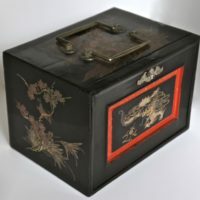 Lacquer box showing Chinese scene to front panel, qilin and stag to side panels and a flower display on back panel. 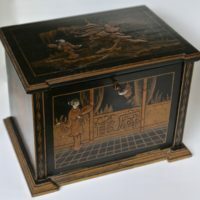 Cabinet showing Stag to side panel. 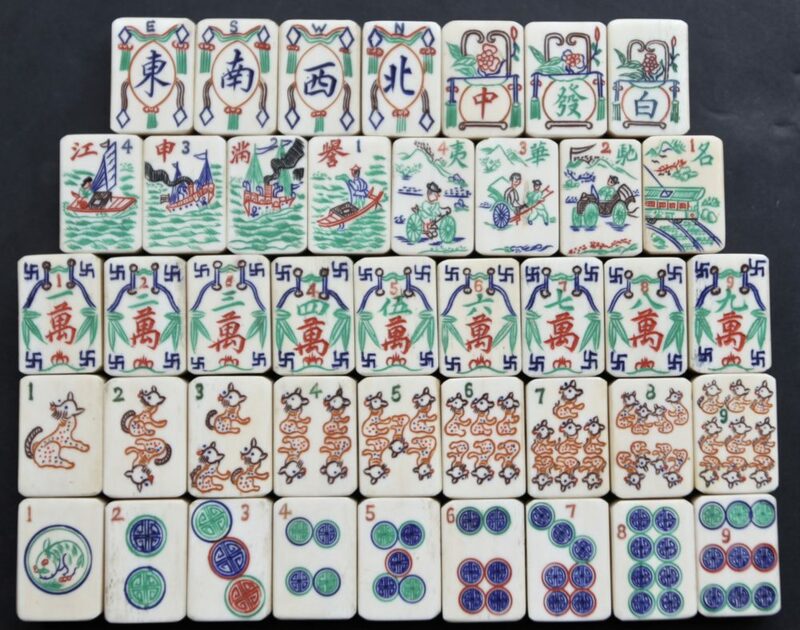 These tiles are fully "carved" and large size. 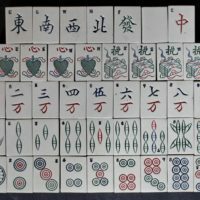 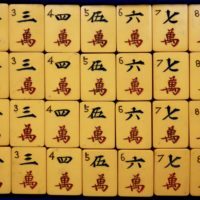 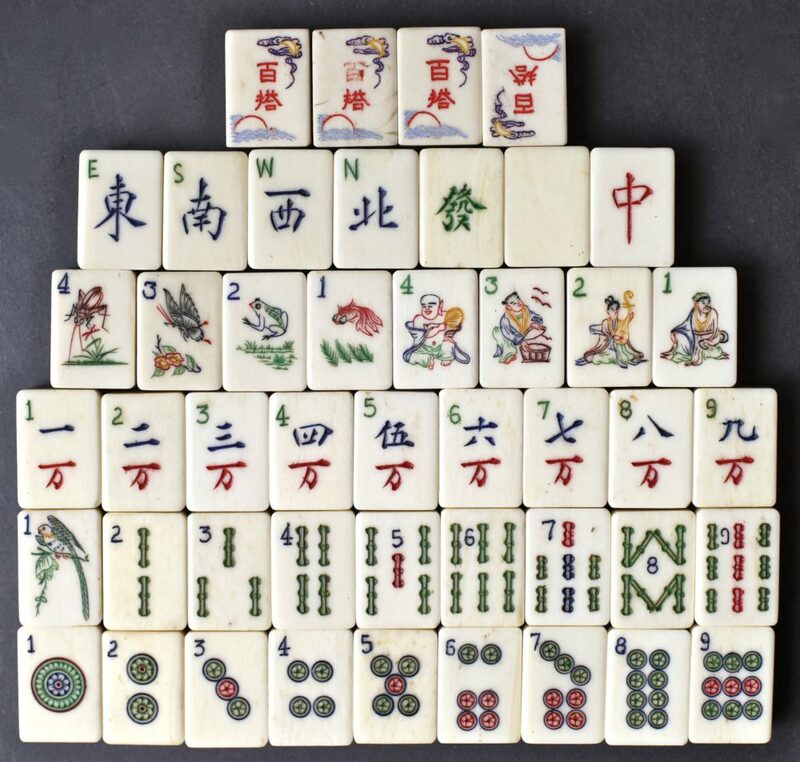 The four tiles representing "100 Uses" and the additional 8 flower /season tiles were not standard but made by the same Chinese company. 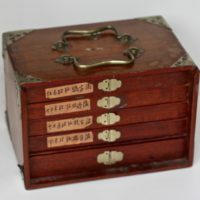 Wooden case for this a new set made in China and retailed by a German firm. 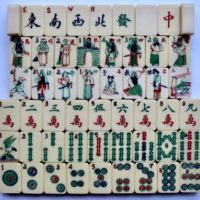 Very nicely carved bone and bamboo set. 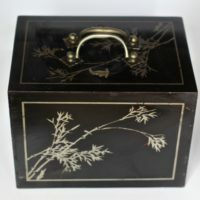 cabinet made in Germany 1930/40. 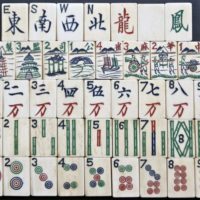 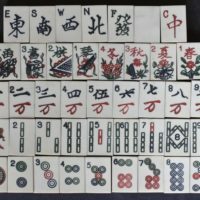 148 bone and bamboo tiles. 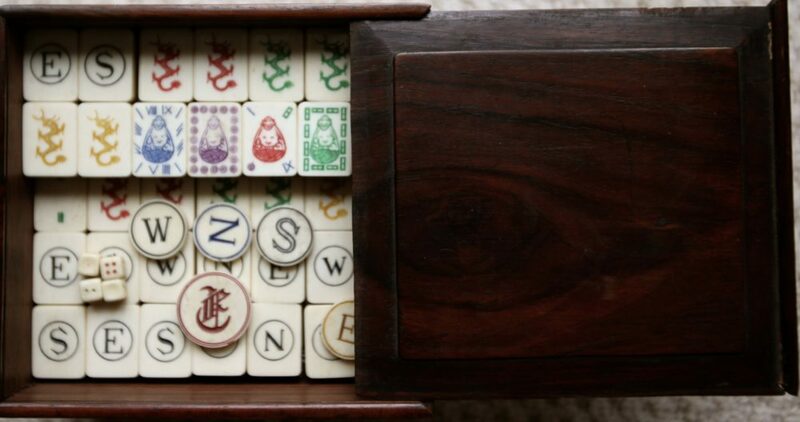 Unusual sparrow one bam and either initials JW on the one circle or it may be a sinogram. Interior of box, lined in red felt. 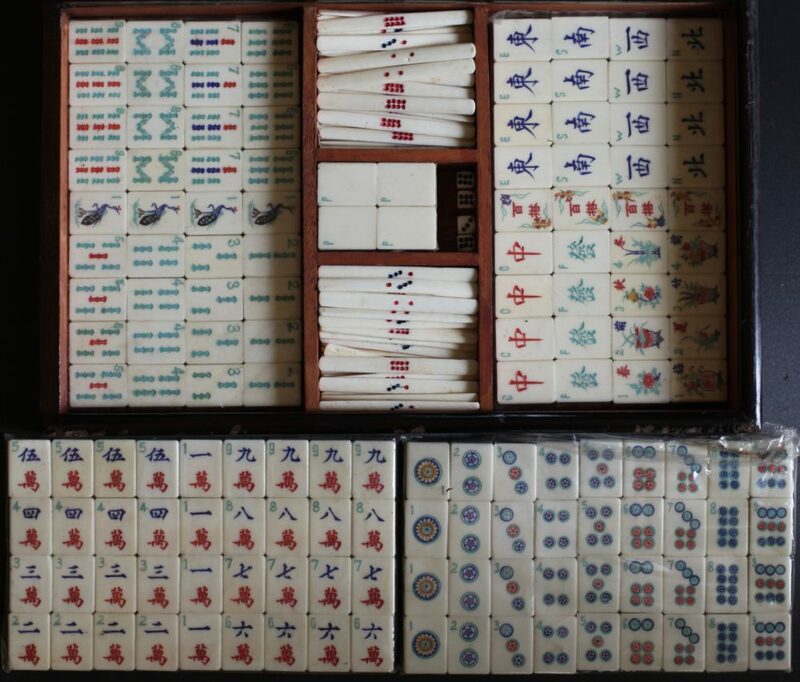 The tray for bone sticks, spare tiles and dice is visible. 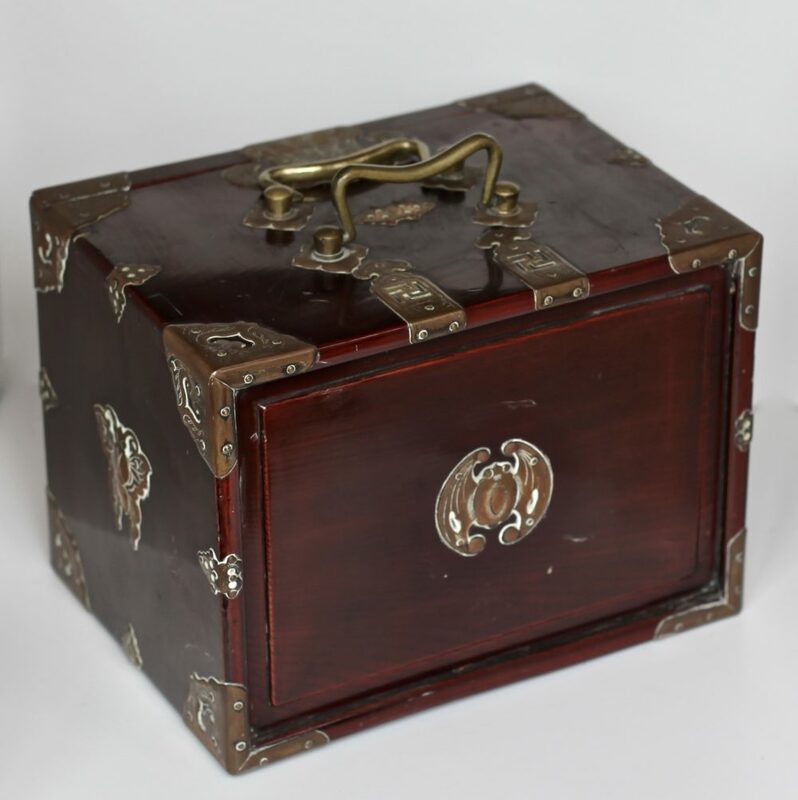 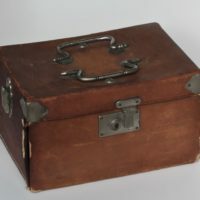 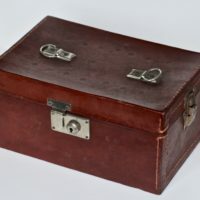 Leather covered box with five trays. 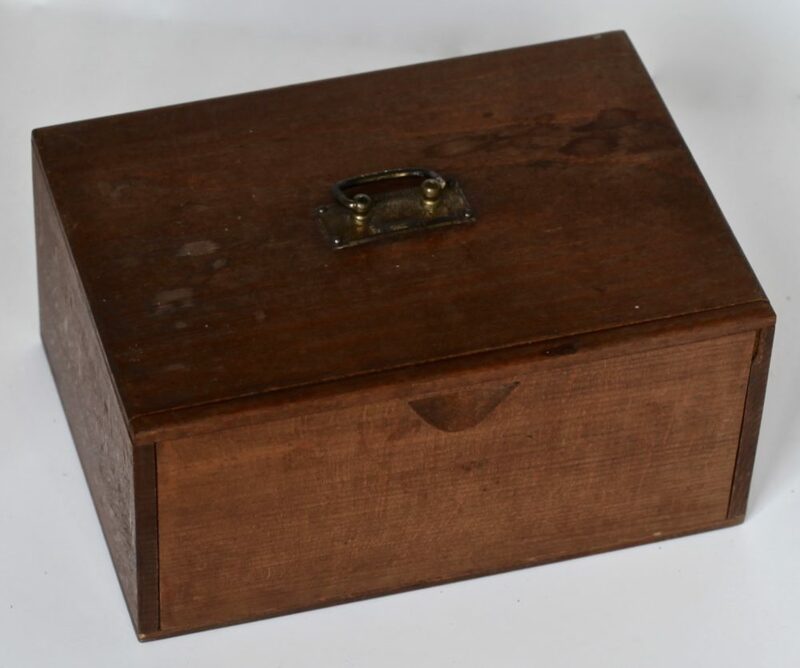 As is common with these types of boxes, the handle is missing. 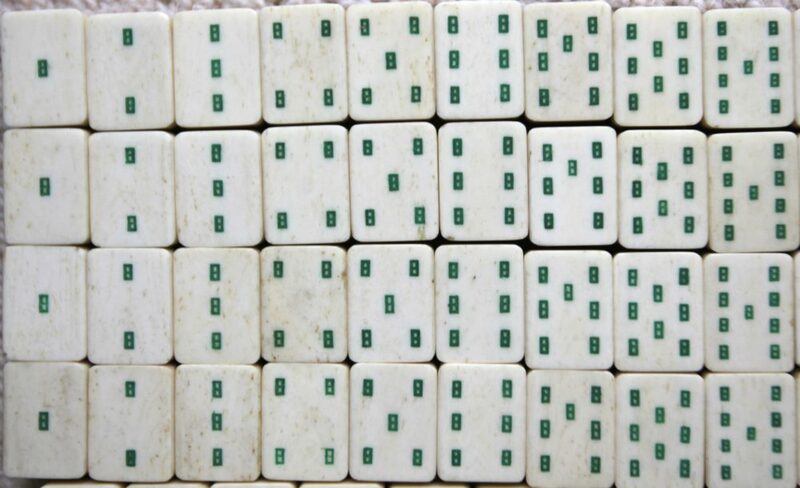 These tiles are a casein sandwich outside a hard wood centre. 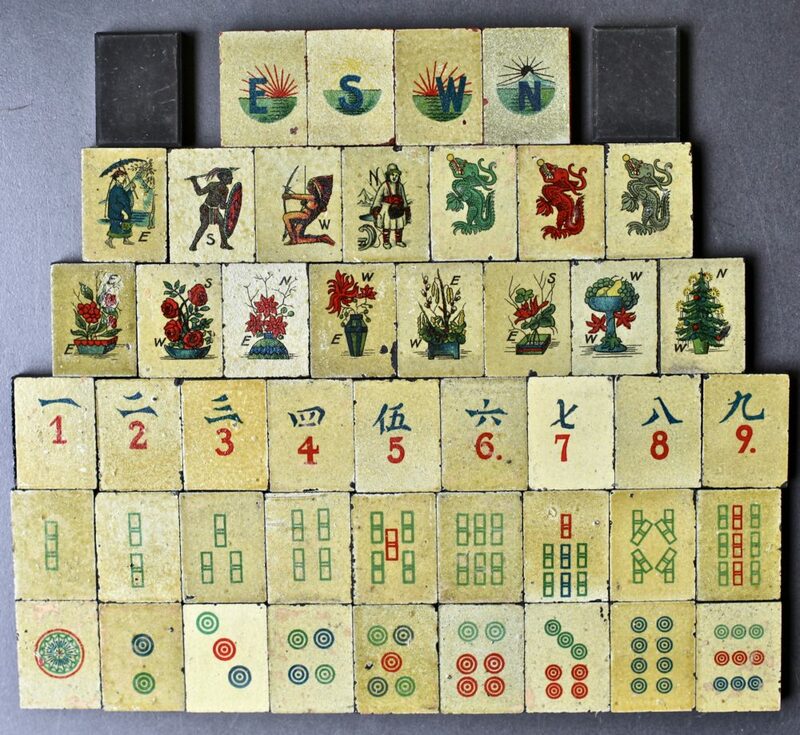 Fully decorated Character tiles and Phoenix on one bam. 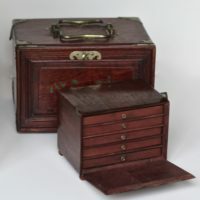 Interior of box showing tray with accessories. 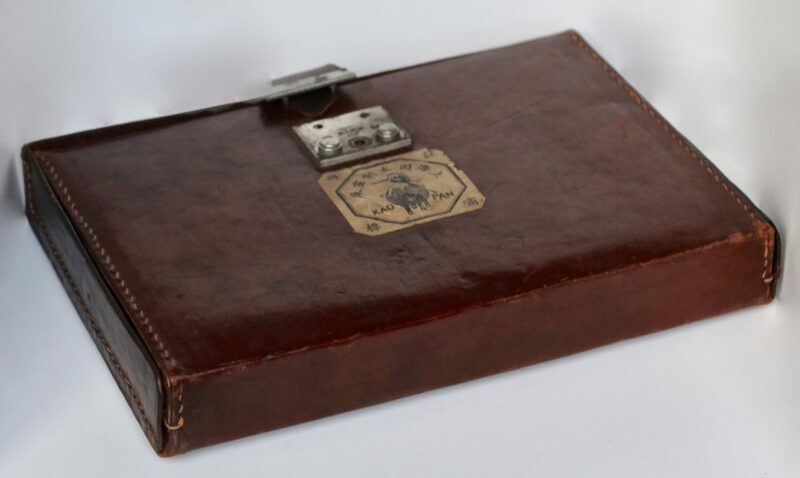 This is a French set by Repsol. 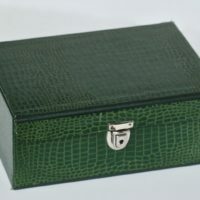 The box is covered in a green faux skin effect. 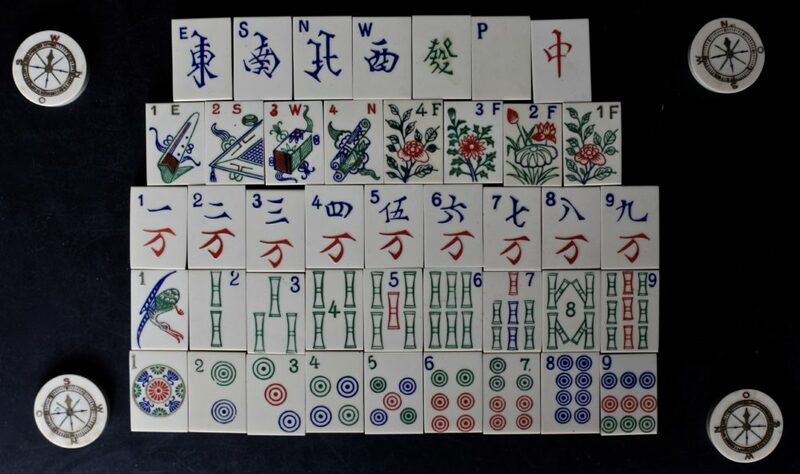 Lung Chan set (see booklet in next picture). 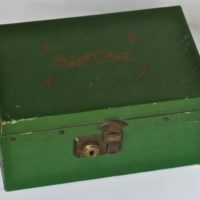 Casein tops on green catalin backs. 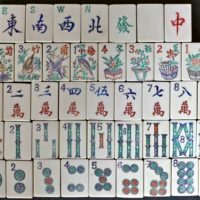 Birds on the 'Flowers' tiles and plants in pots on the 'Seasons' tiles. 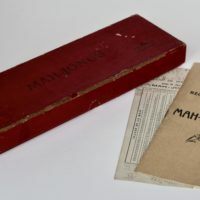 Box opening arrangement with booklet. Lung Chan set from France.Green backs-Birds. 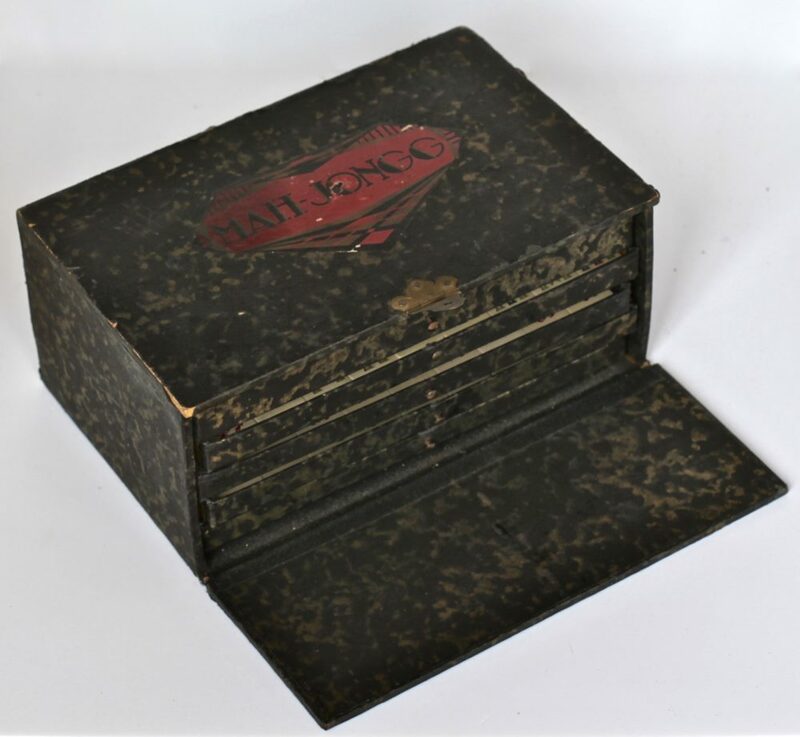 Cardboard box showing interior arrangement. 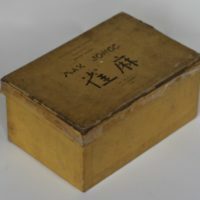 This is a French Lafayette set. 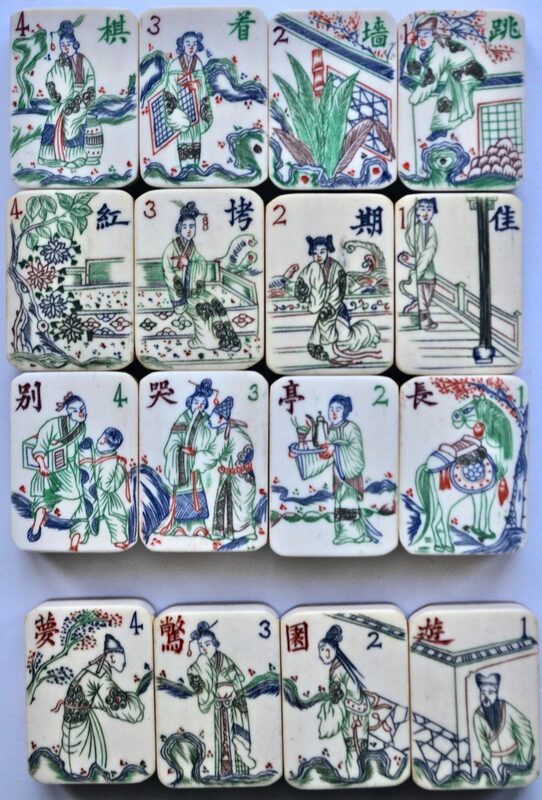 This set of tiles has a hawk on the world one bam and lovely ladies depicted on the flower tiles. 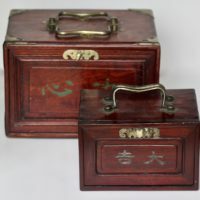 Chinese bakelite set in leather satchel case. 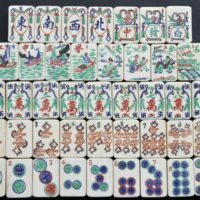 Chinese bakelite tiles. 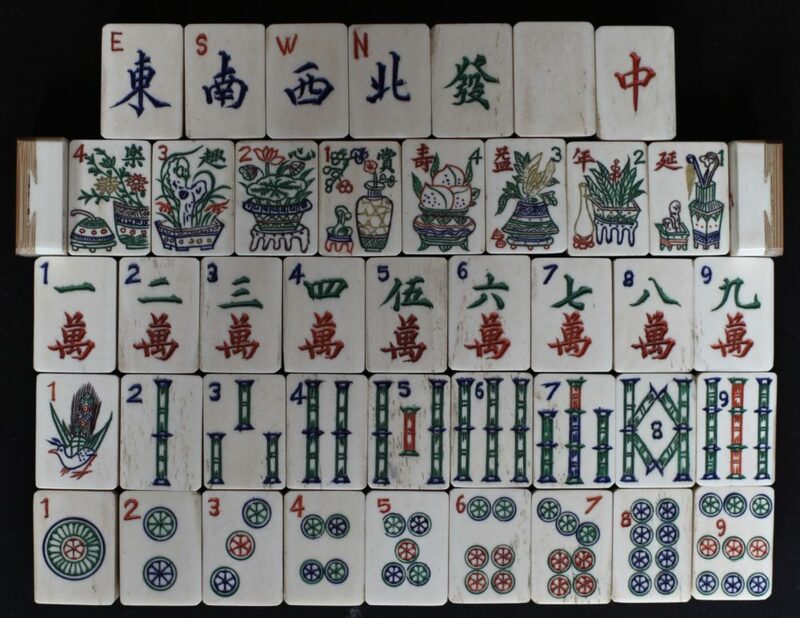 Note the 1st two tiles in the 'Seasons' quartet form a complete a picture. 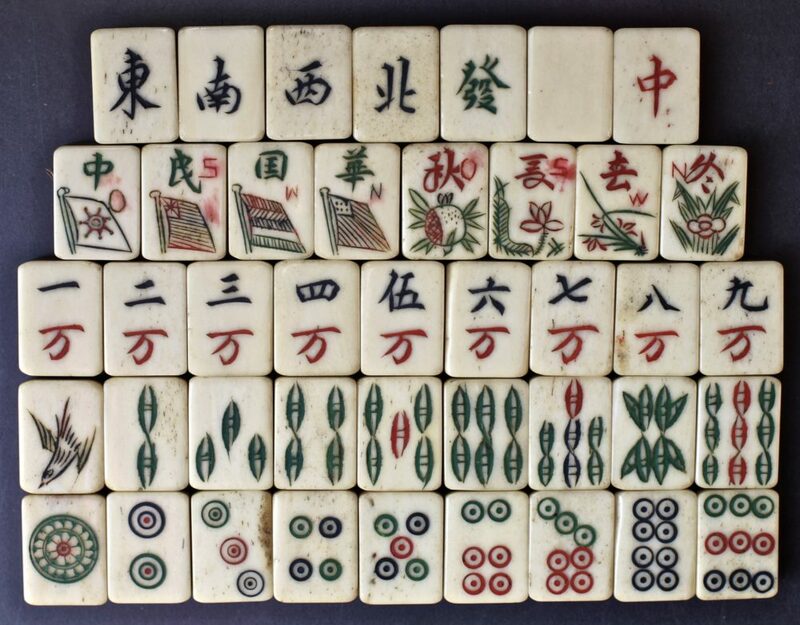 Chinese bakelite tiles. 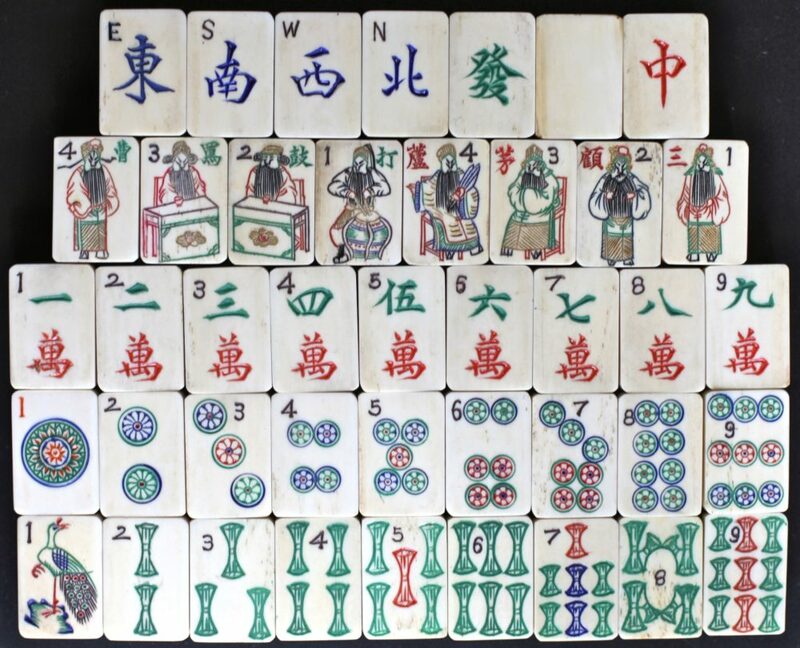 The flower tiles depict the usual occupations and seasonal flowers, but they are carved exceptionally well. 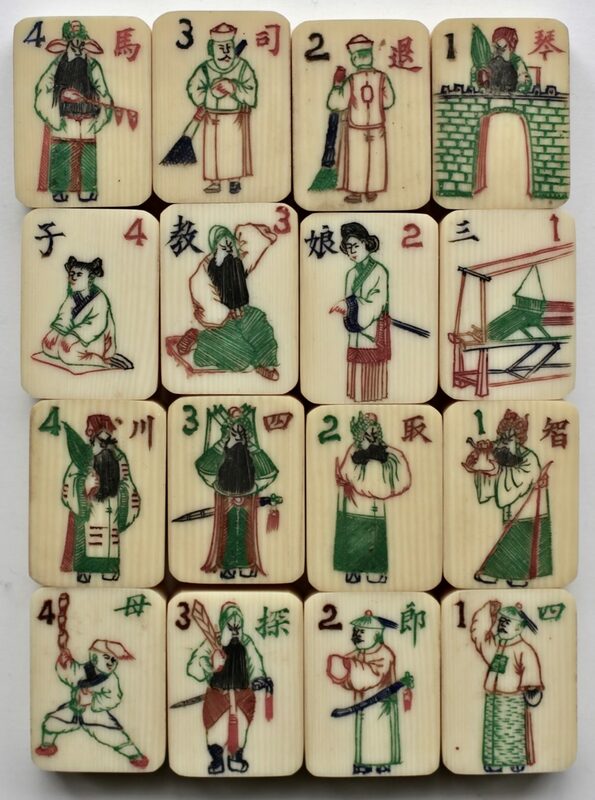 It should be noted that these depictions here of the five noble occupations (Fisherman, Woodcutter, farmer and Scholar), are also found in later bone and bamboo sets from the 1950s. 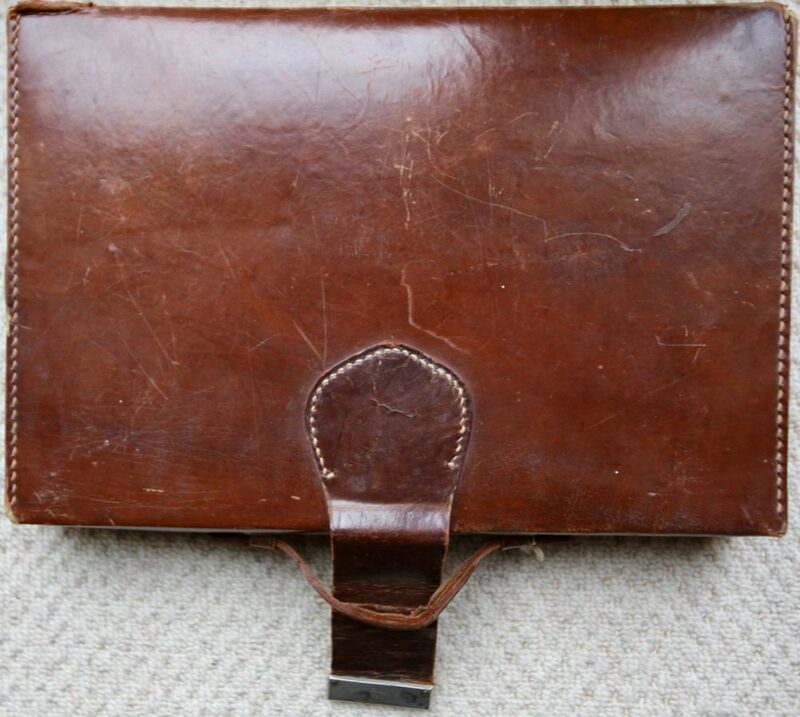 Open leather satchel. 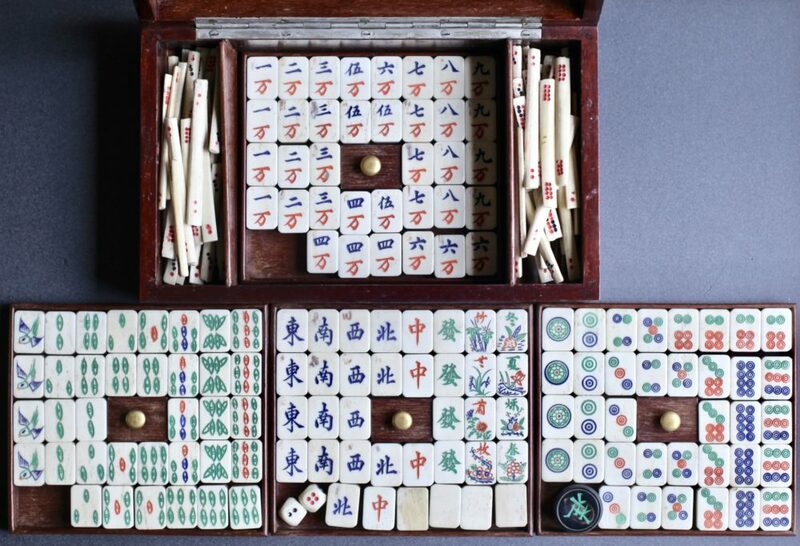 Note the arrangement of the tile trays separated by a thin rectangular tray for the bone scoring sticks, bone dice and position indicator. The insider of the lid has two pockets to house the manuals and other items such as scoring cards etc. 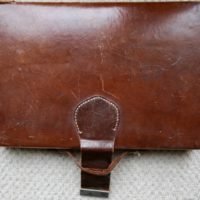 Closed leather satchel style case. 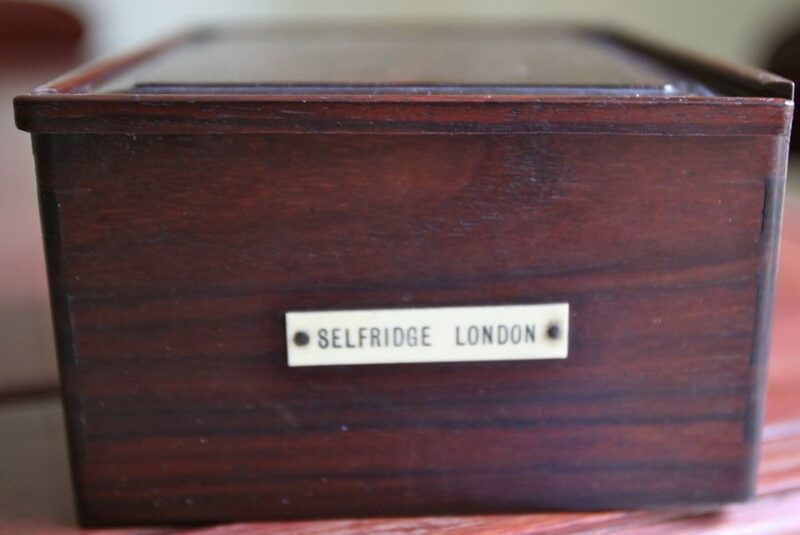 The exterior has the makers label glued to the lid. 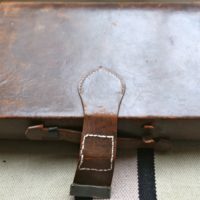 The lock strap is broken. 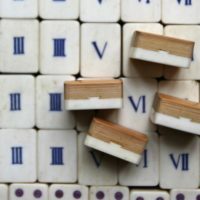 The is very common. 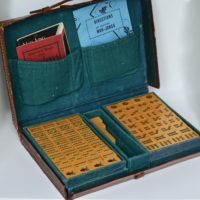 'Travellers' set. 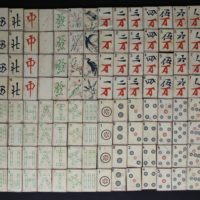 The tiles purport to tell the myth of the "Merchant the Parrot and the Concubine". 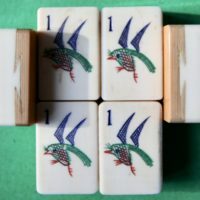 The parrot on one bam is uncommon. 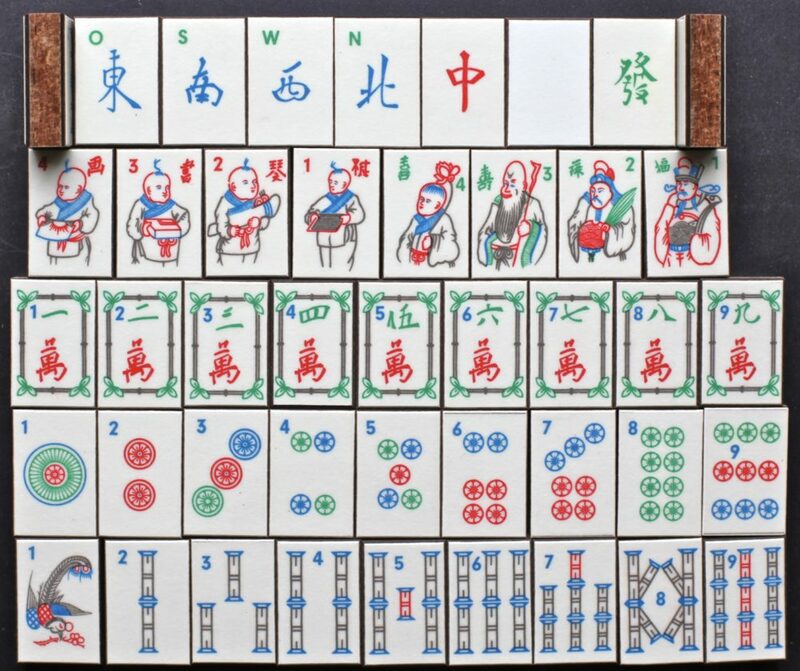 The 100 uses Jokers are depicted on the top line of the tiles. 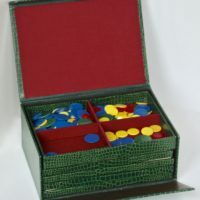 Box for 'travellers' tiles. 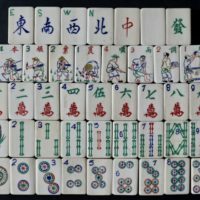 Not original to the tile set. 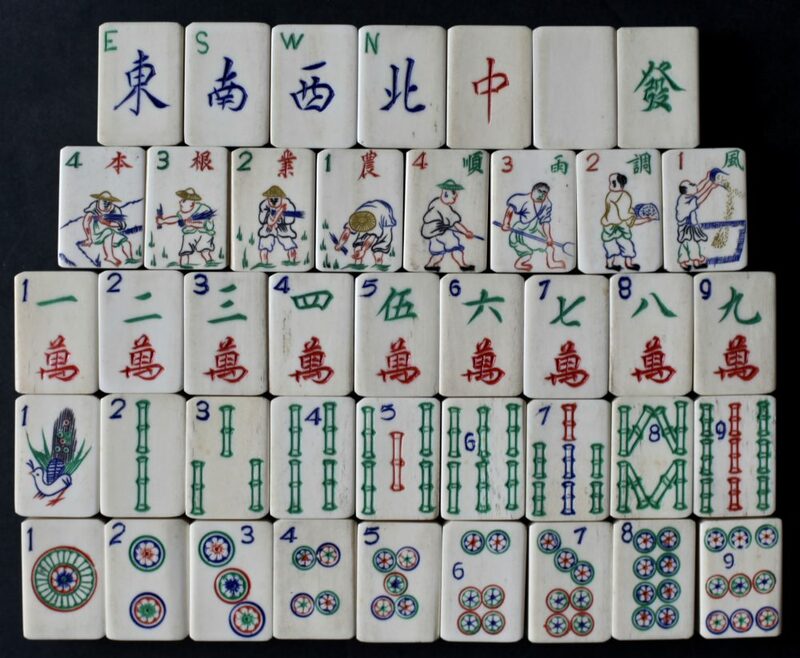 This set is known as the "stone set" or the "Race" set. 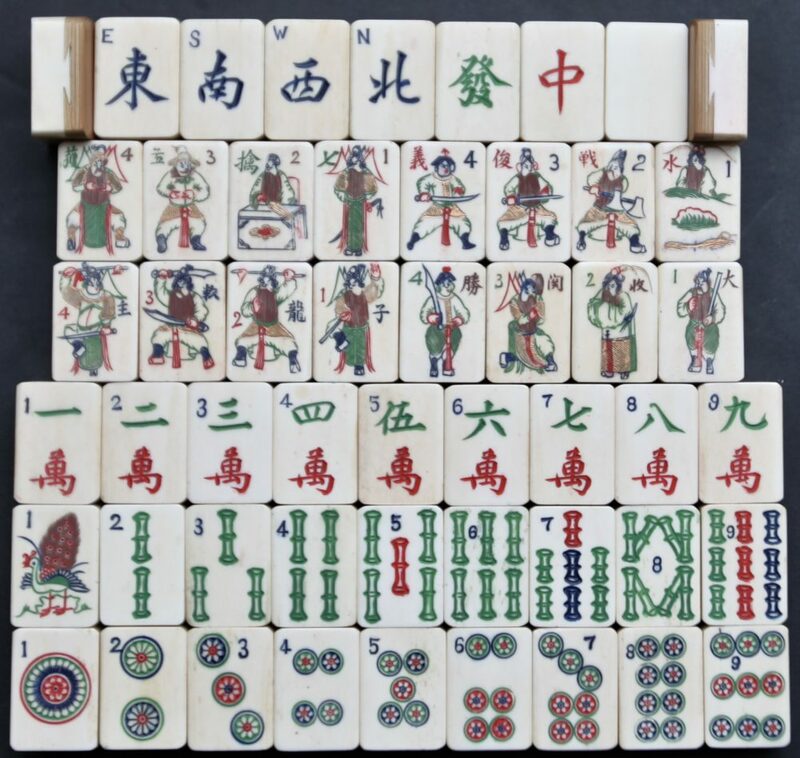 The latter due to the Winds being depicted as Inuit for the North, Chinaman for the East, African for the South and Native American for the West. 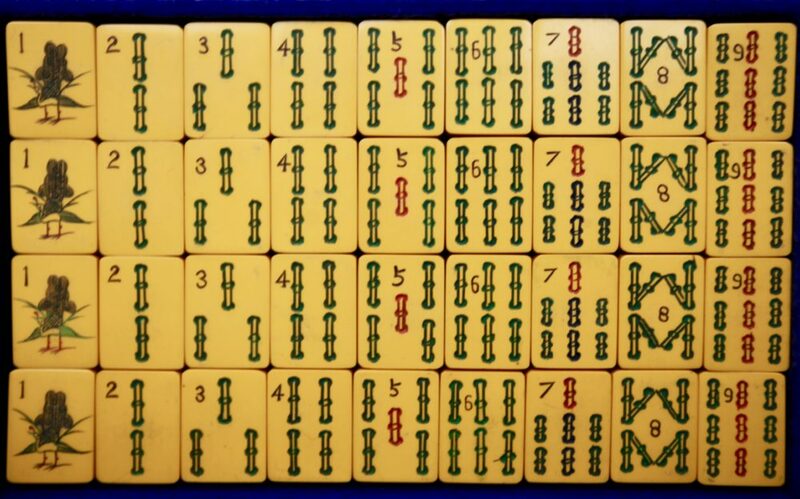 German set made by Richter. 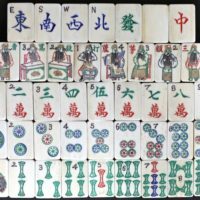 Old style carved bone and 'seed' bamboo tiles. 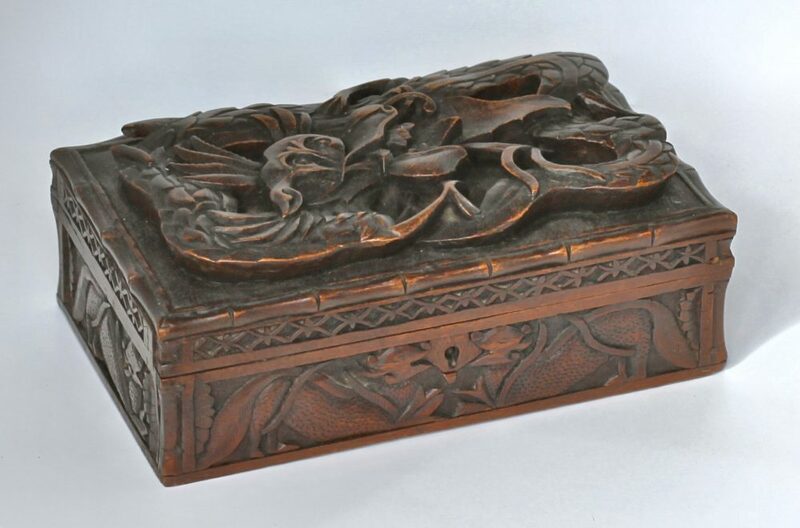 Dragon box not original to the set. 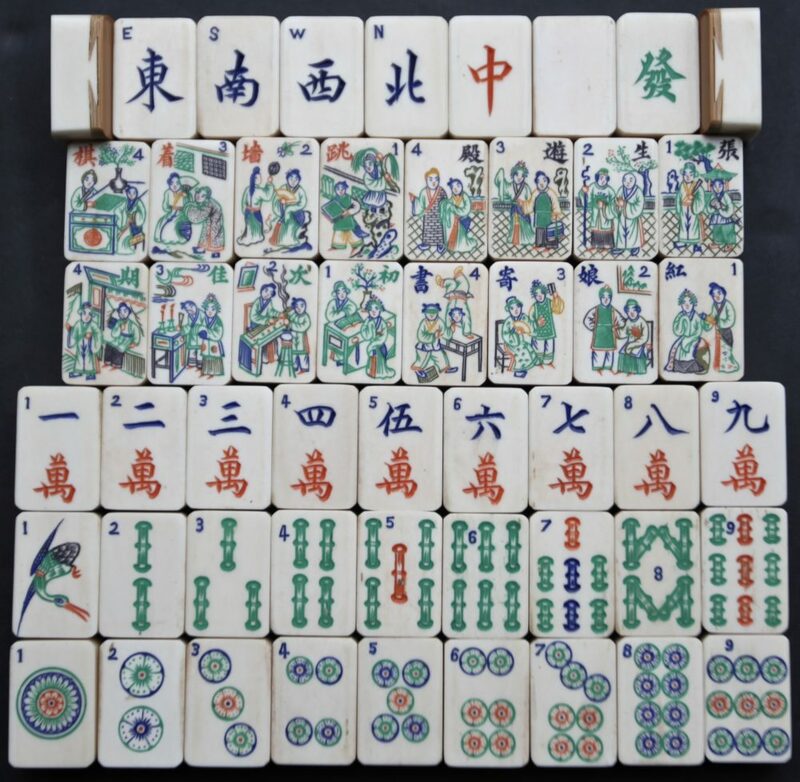 The ceramic tiles are unusual but not uncommon. 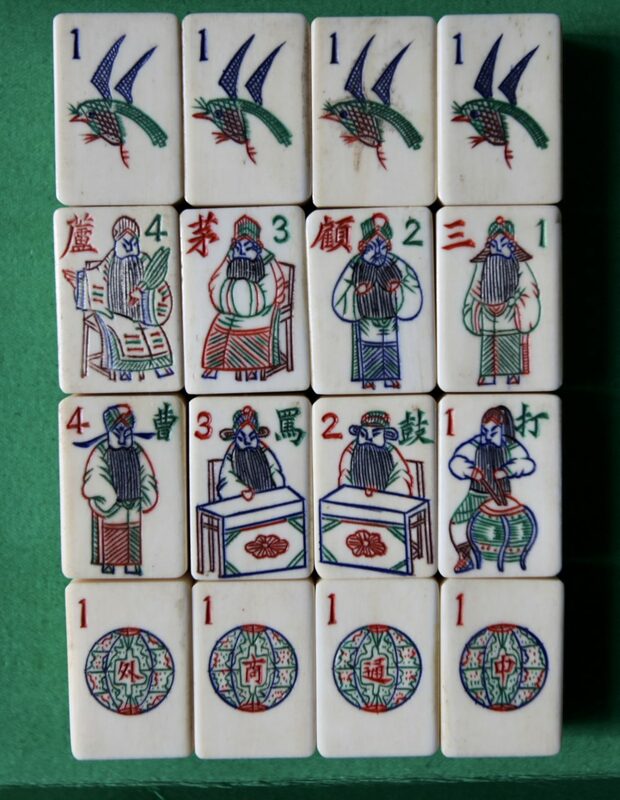 Their down fall was their fragility during the" twittering of the sparrows" or shuffling of the tiles before play. 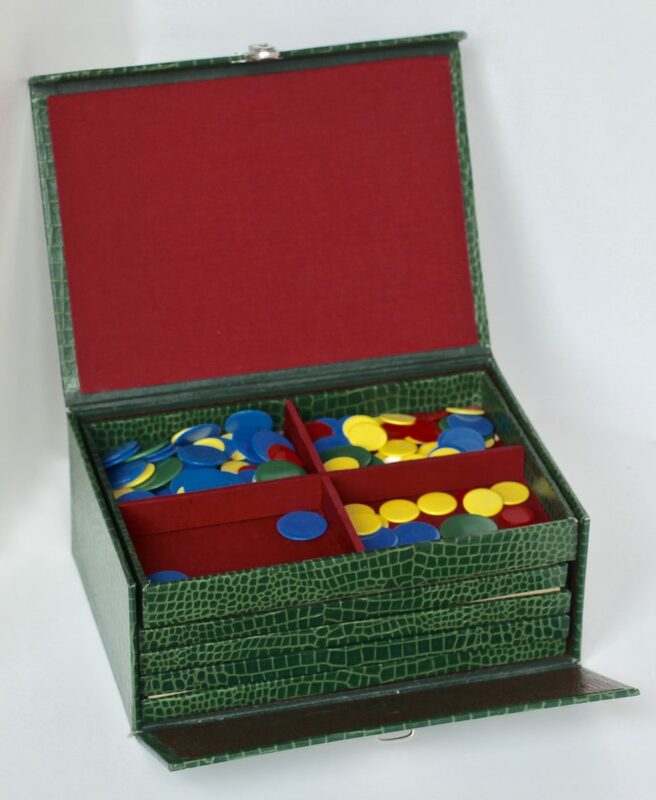 Cardboard box housing a Tile set. Made by Hickson. 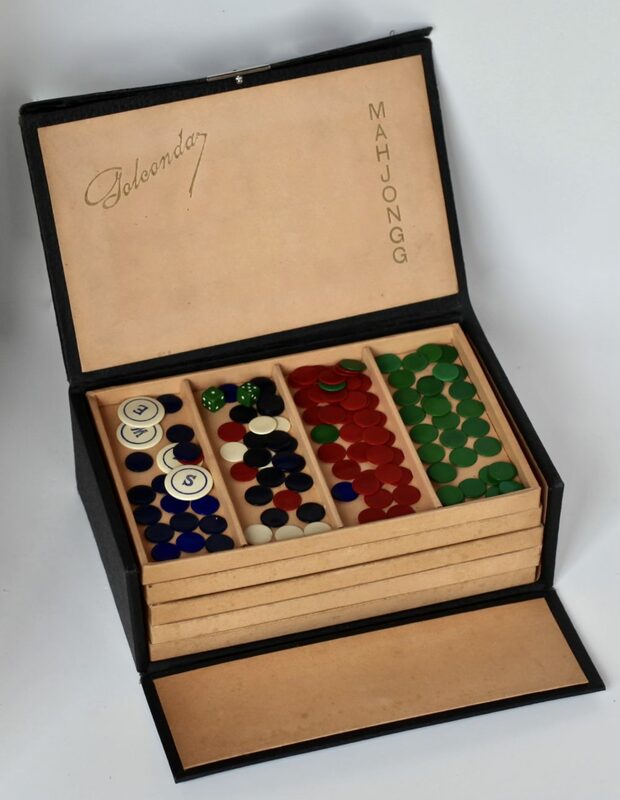 This set is a casein Mark Pehafra set in beautiful condition, made in Germany 1930/40 from. 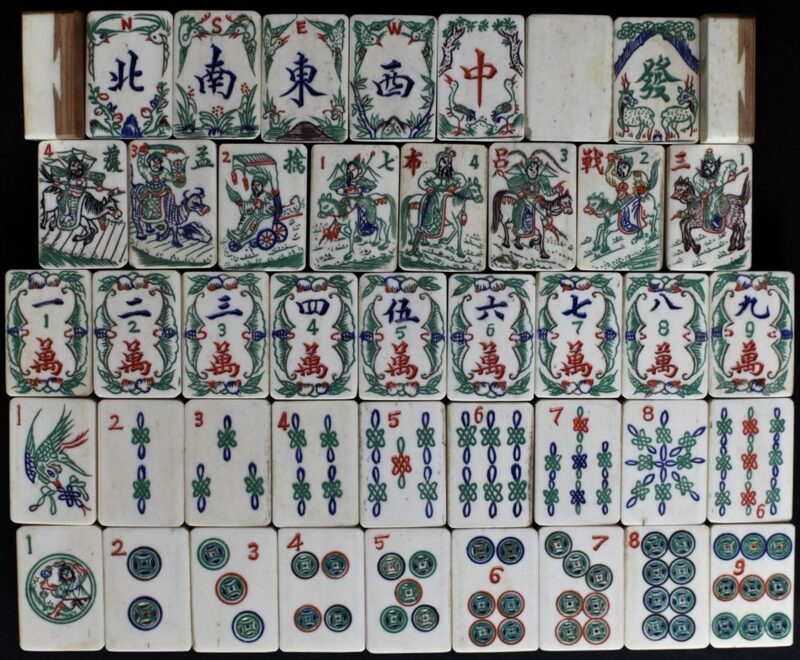 Many of tile sets of this type have serious paint loss - hence my comment on this set's condition. 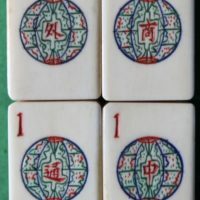 Note the circular Wind Directions. 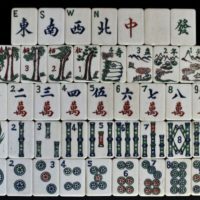 148 casein tiles. 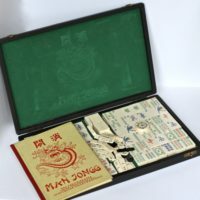 This image shows the booklet and the tile layout in the interior of the box. 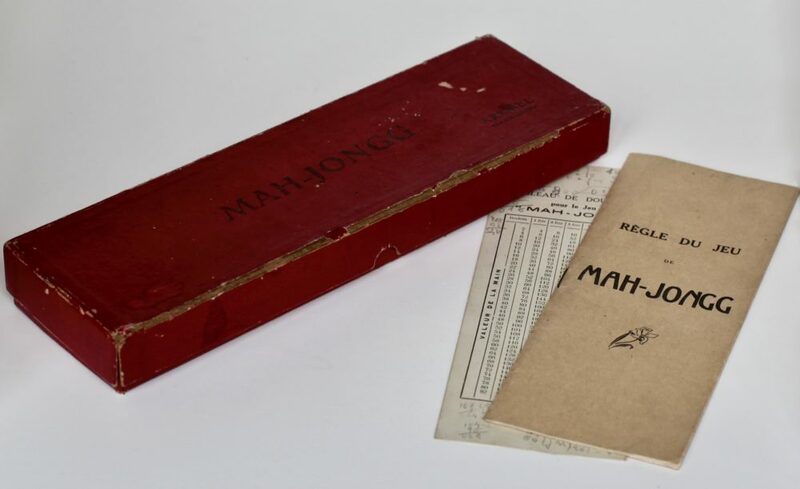 Marke Pehafra set from Germany. 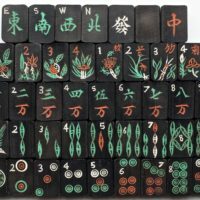 Black-stained bamboo tiles. 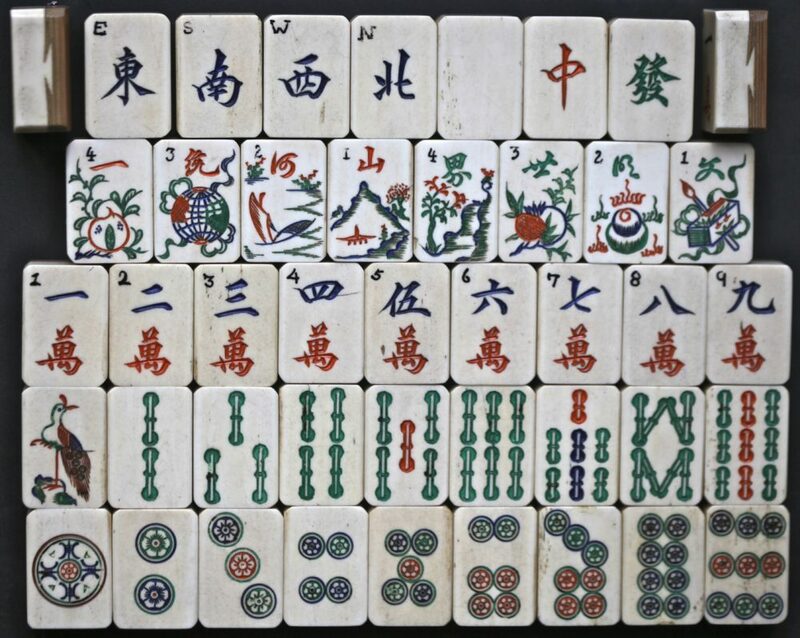 Note the use of the colour white. Black-stained engraved bamboo tile set Imported into the UK housed in a cardboard box covered in a faux reptile pattern. 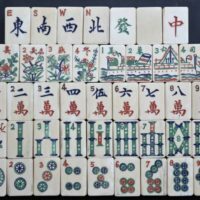 Bamboo is a very difficult material to carve so the excellent engravings on these tiles need to be considered in the light of this. 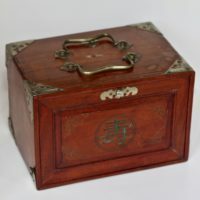 Bamboo set imported into the UK and housed in a box by the H. P. Gibson company. 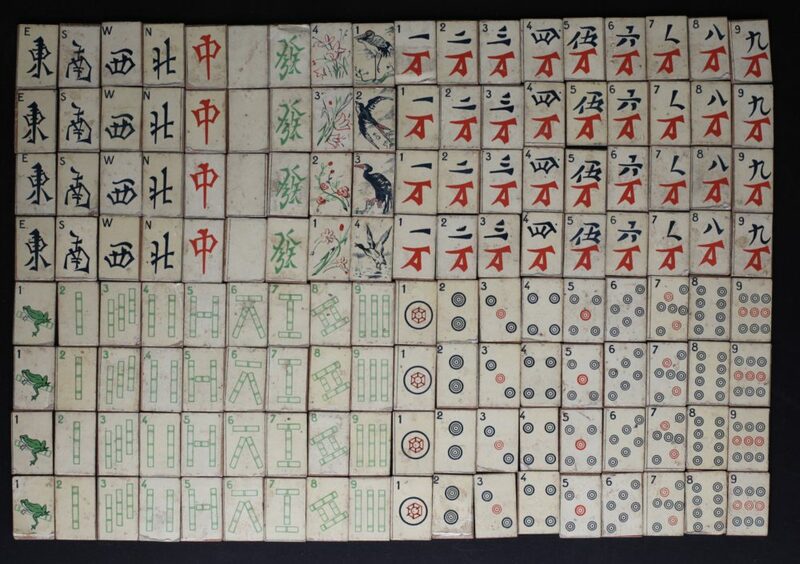 Full set of tiles in their original cellophane wrappers. 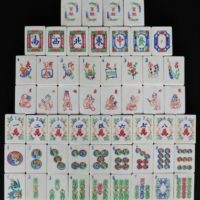 The "100 uses" Jokers are a feature of this set. 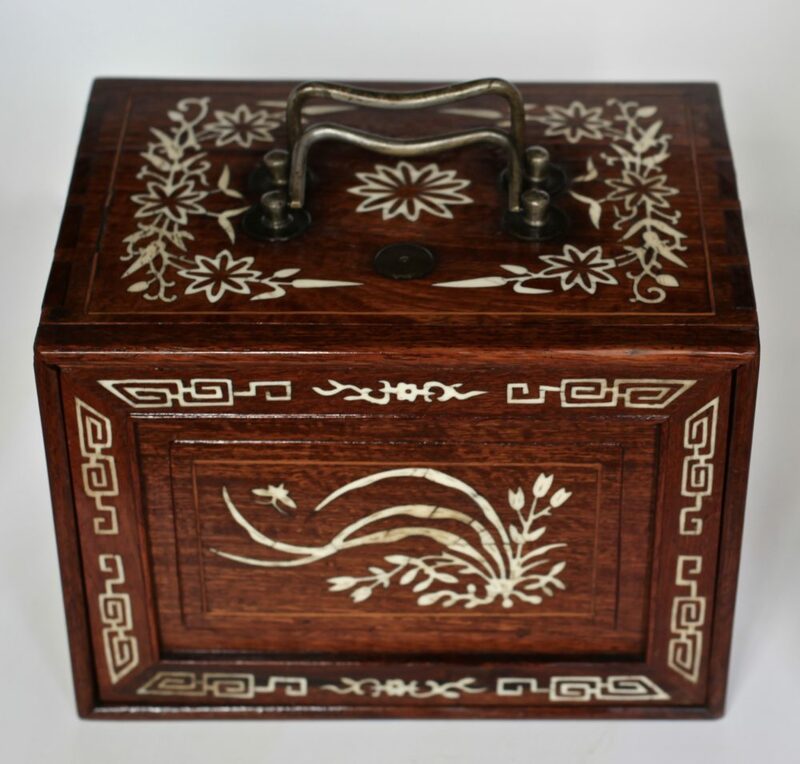 "Travellers/Ladies" set in a wooden slide-top box. 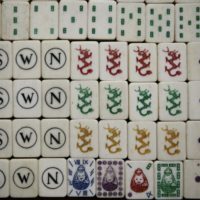 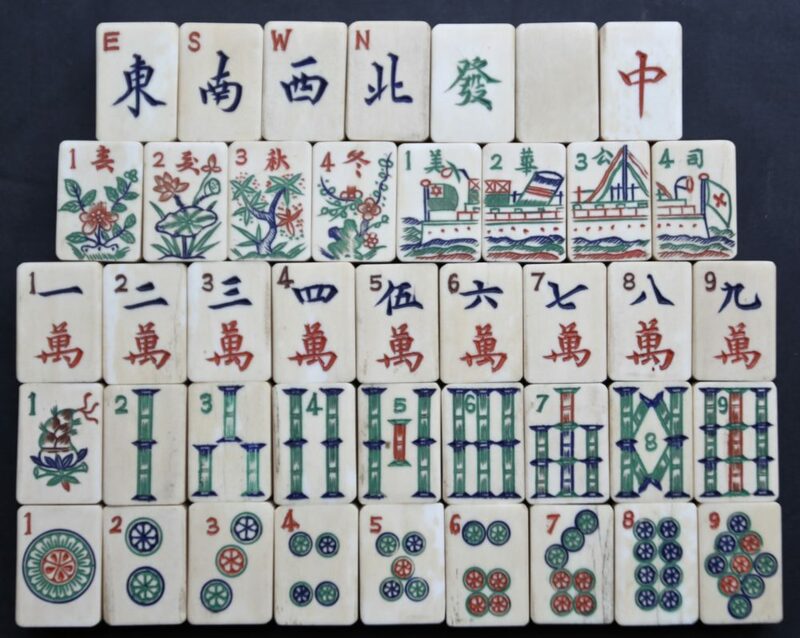 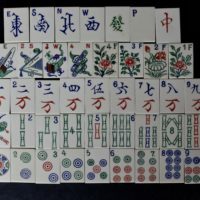 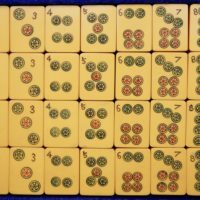 The flower tiles support the Singapore Rules system of play. 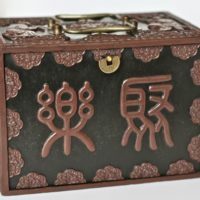 The God of Wealth may seize the Pot of Valuables etc. 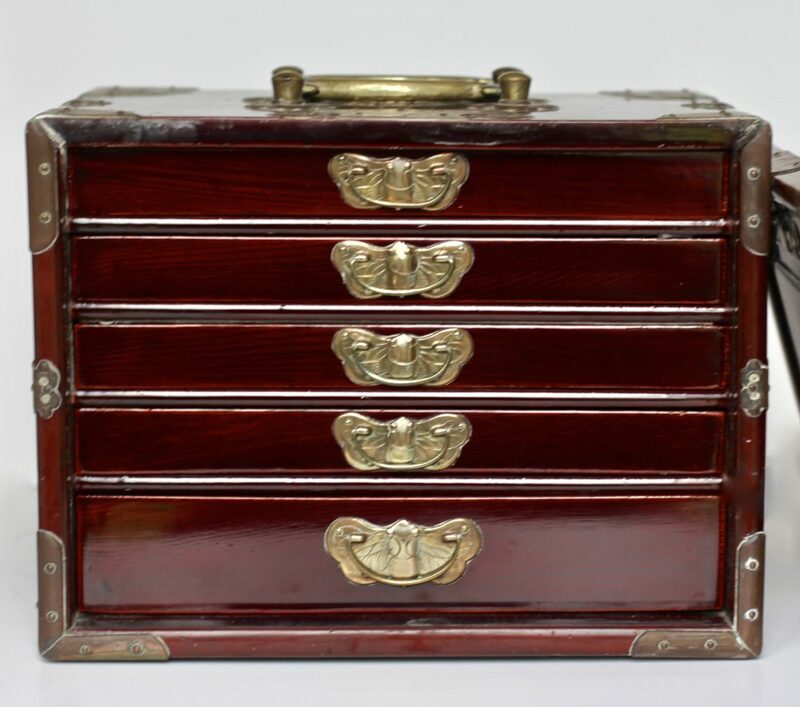 "Travellers/Ladies" set housed in a wooden box with a slide-top lid. 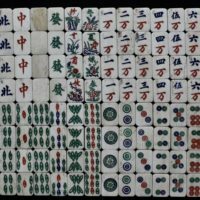 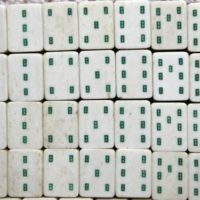 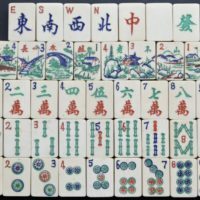 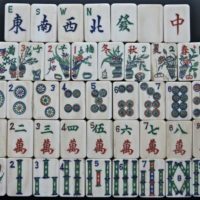 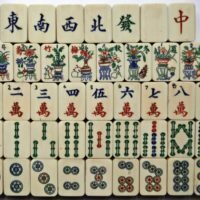 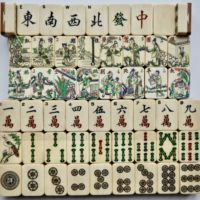 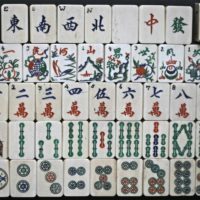 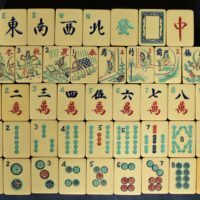 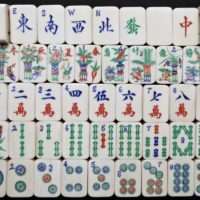 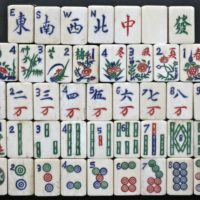 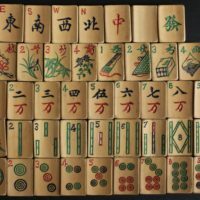 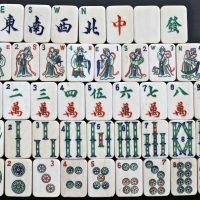 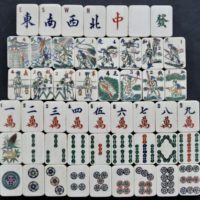 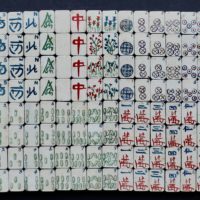 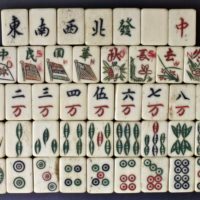 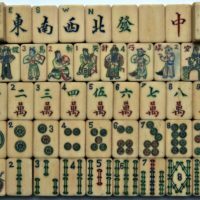 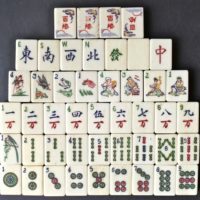 Bone and bamboo miniature tiles. 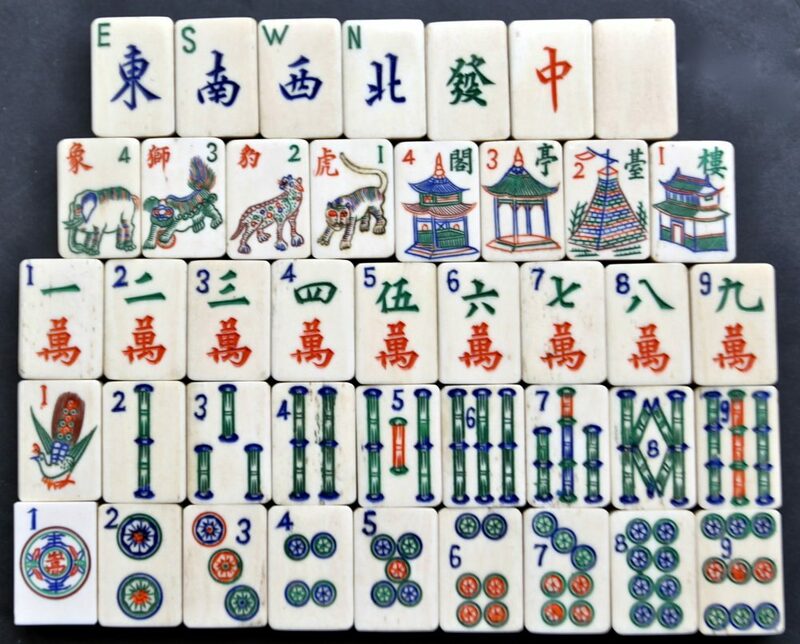 Note the bamboo shoot one bam and the intricate carving of the tiles. 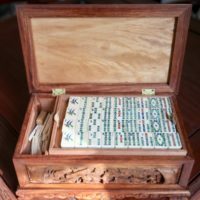 Small cabinet for miniature tiles. Picture shows larger box for comparison. 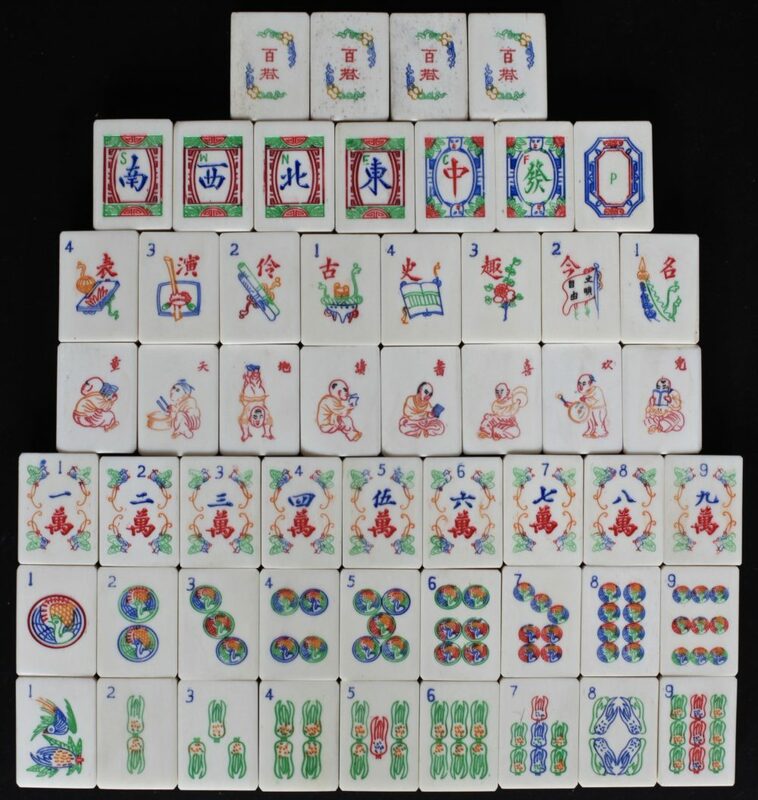 Casein tiles-Austrian or German made. 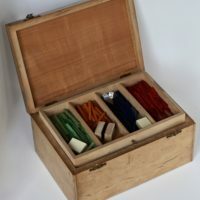 To qualify as miniature the length has to be 20mm or less. 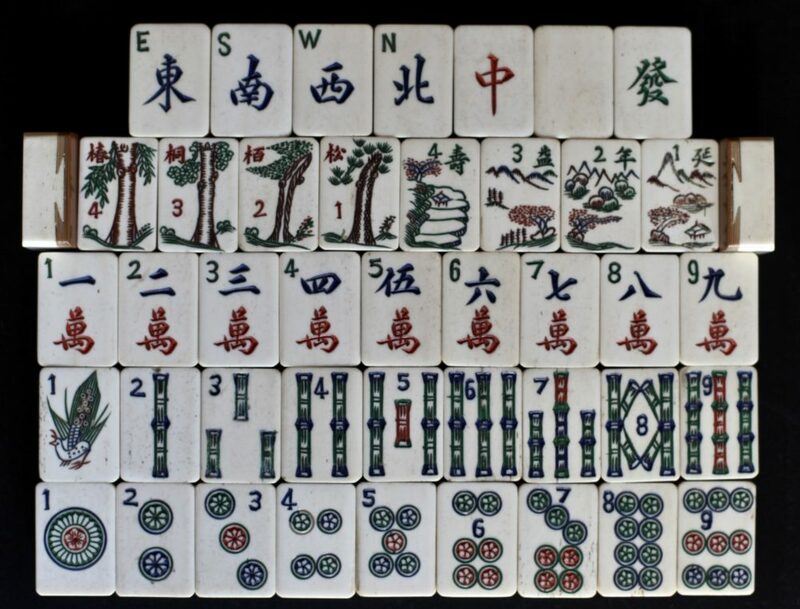 Arrangement of tiles and accessories. 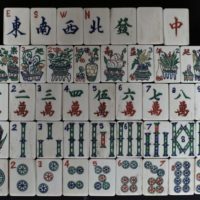 Small case for holding casein tiles. 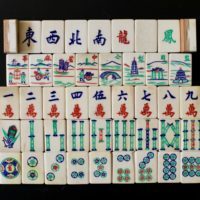 Miniature bone and bamboo tiles. 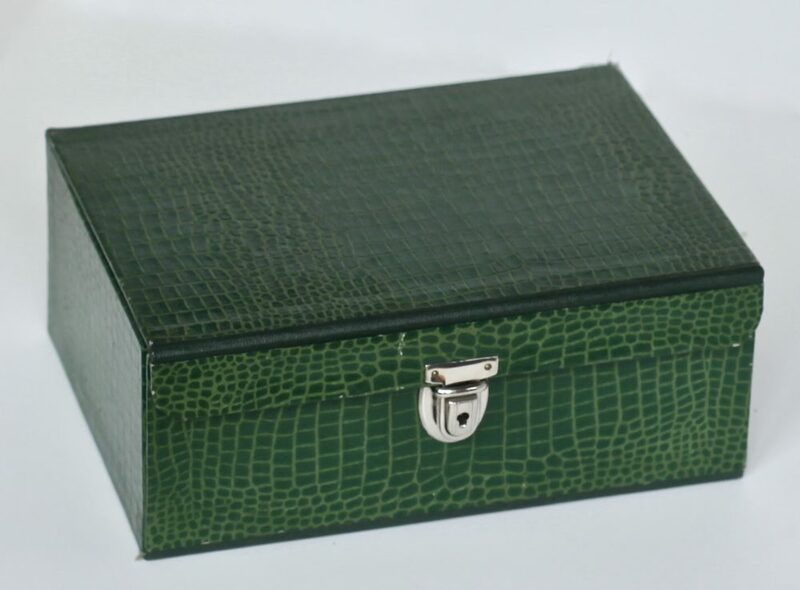 Small box for miniature tiles. 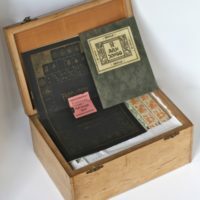 Paper on wooden backs. 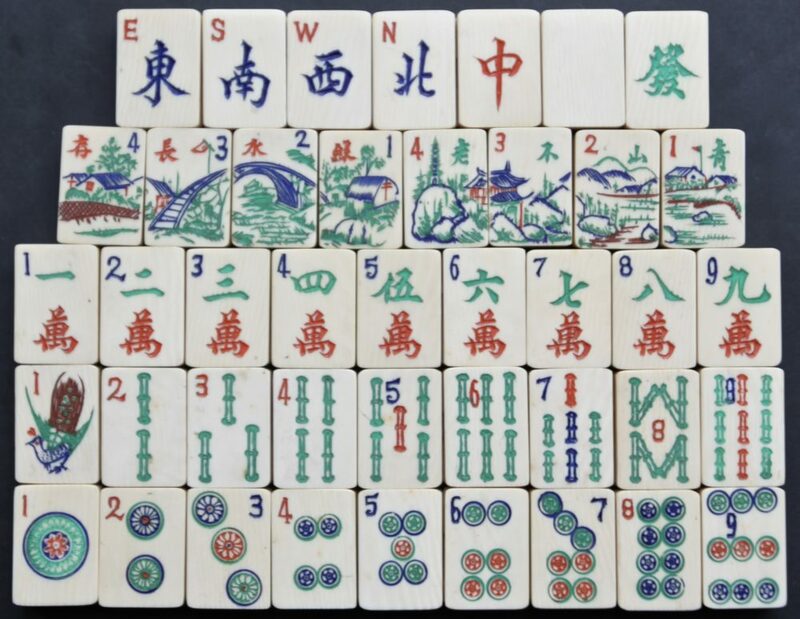 Note the frog on the one bam. 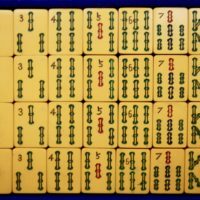 This is a French Arkmel set. Chinese bakelite,black wafer backs. 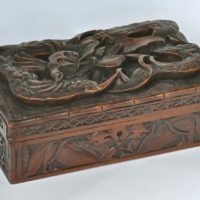 One bam depicts the Phoenix. 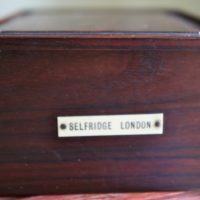 Sequenced flowers. 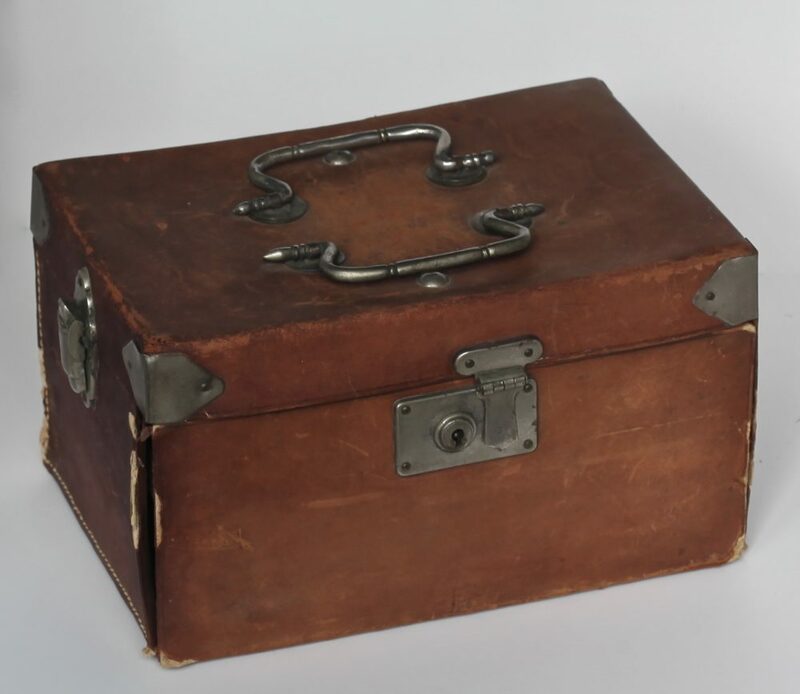 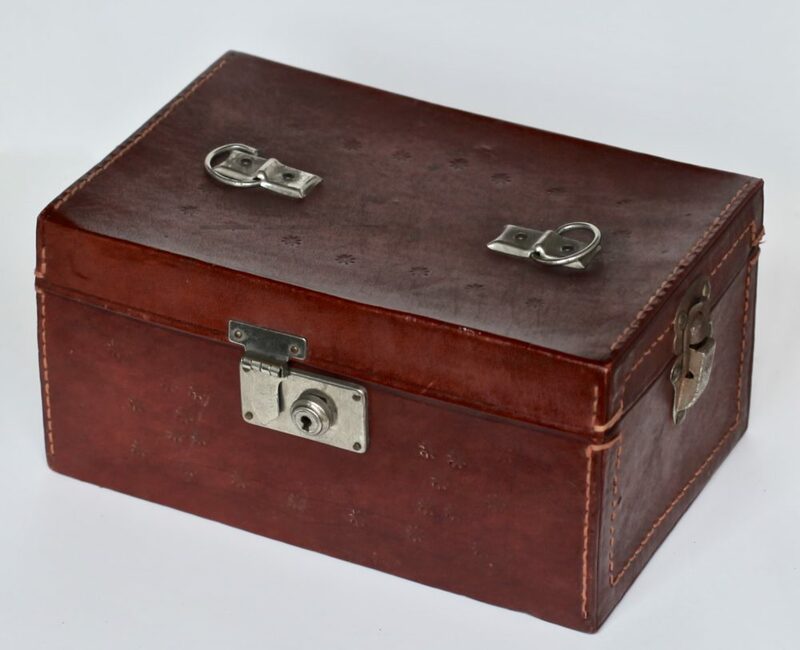 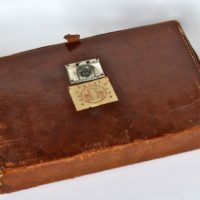 Leather attaché-style case with four felt-lined trays holding tiles and one narrow tray for accessories. 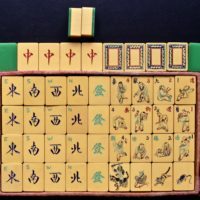 CB green backed set in leather satchel.The 156 tiles include 16 flower tiles showing children at play and a line of Singapore capture tiles. 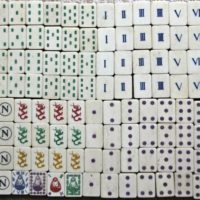 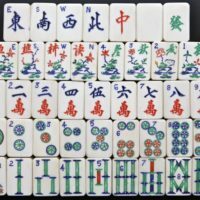 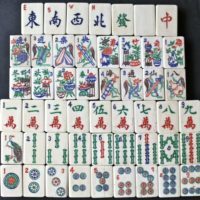 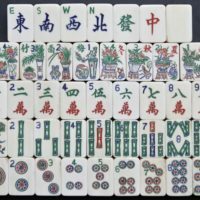 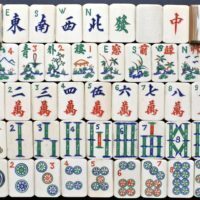 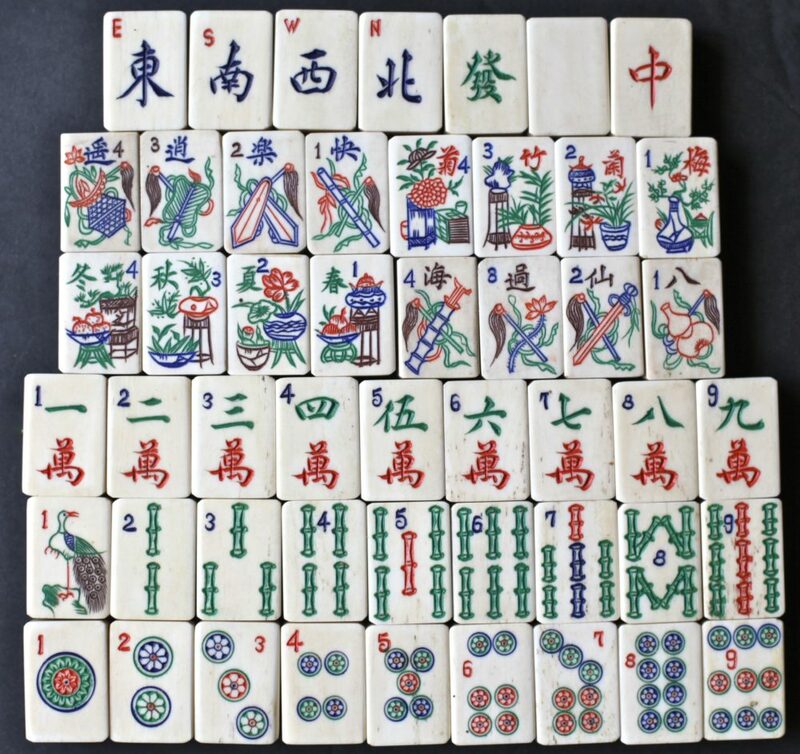 This is a sixteen flower set of bone and bamboo tiles. 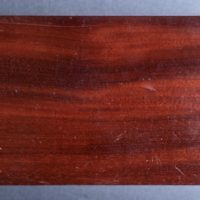 A good thickness of bone is an indicator of it being a high end set. 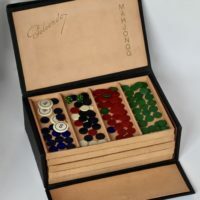 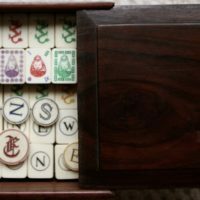 The box is the standard slide front Padouk wooden box with five drawers. 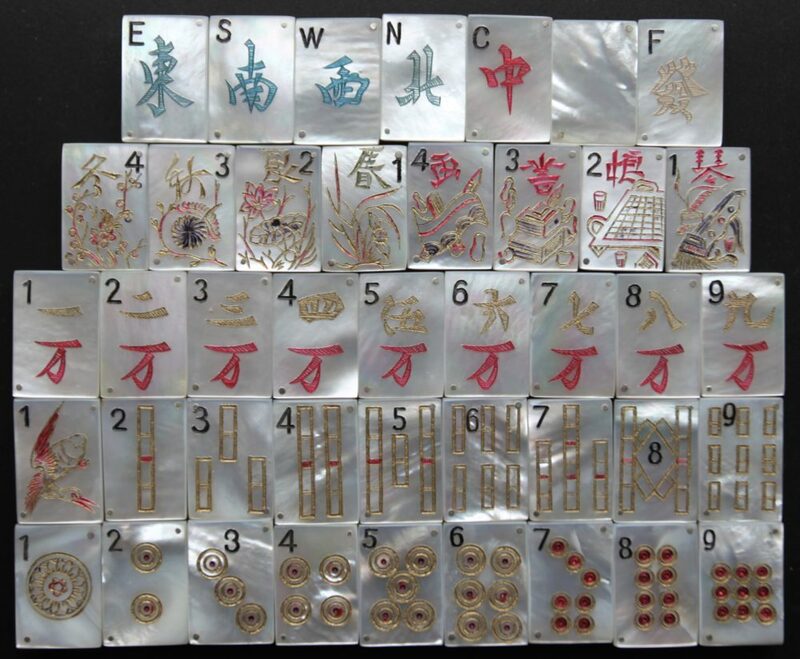 Some of the drawers have had paper strips with sinograms attached to them. 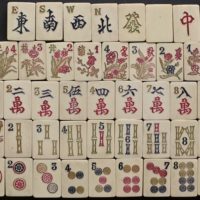 Bone on bamboo tiles 146 only the flowers depict scenes from Chinese farming especially rice farming. 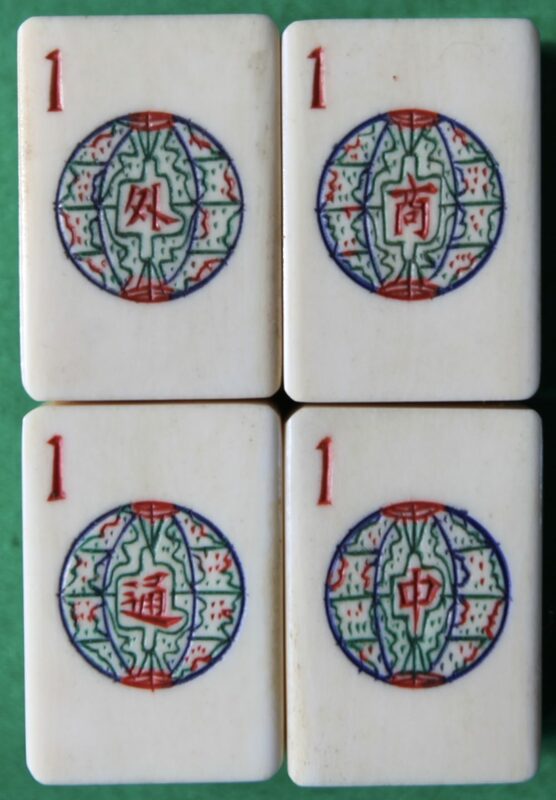 The four tiles with the green sinograms read, from R-L; 風調雨順 fēng tiáo yǔ shùn = "favourable weather", interpreted as a wish for good weather for the crops. 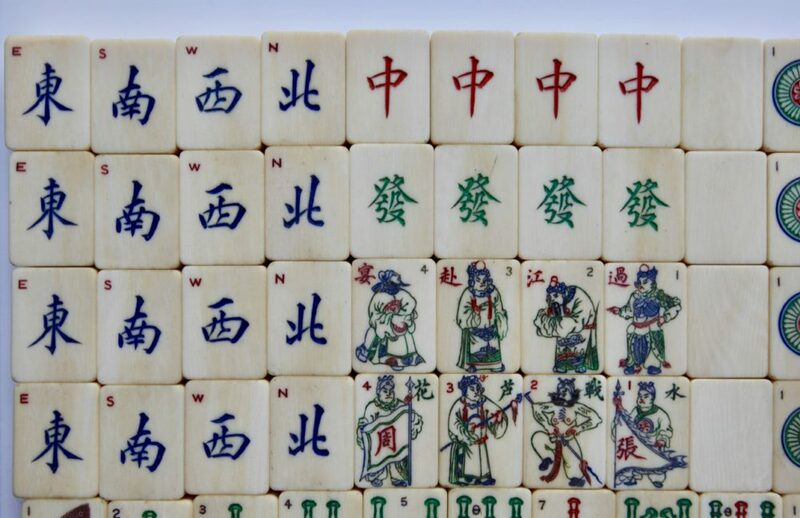 This can also refer to four heavenly kings, see here, https://en.m.wikipedia.org/wiki/Four_Heavenly_Kings. 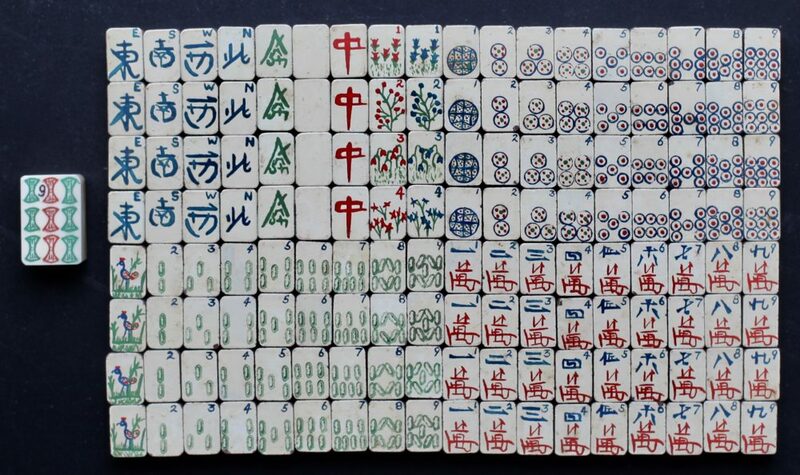 The for tiles with the red sinograms read, from R-L; 農業根本, nóng yè gēn běn = "agriculture is the foundation" which may be understood as "agriculture is fundamental to the economy". Bats also make particularly nice drawer pulls. 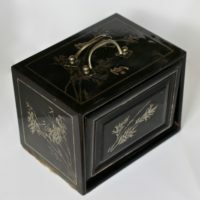 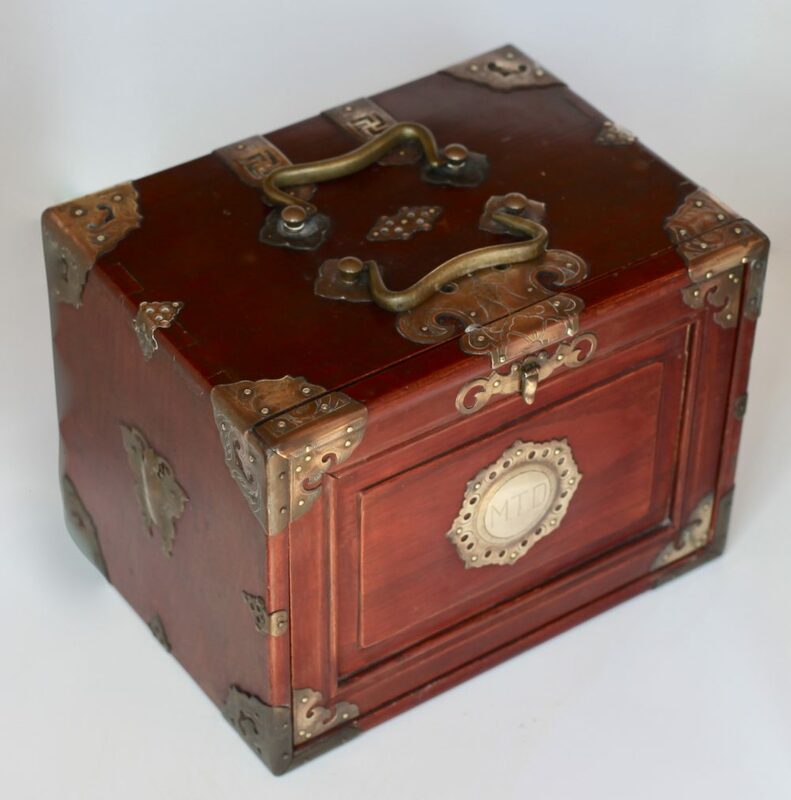 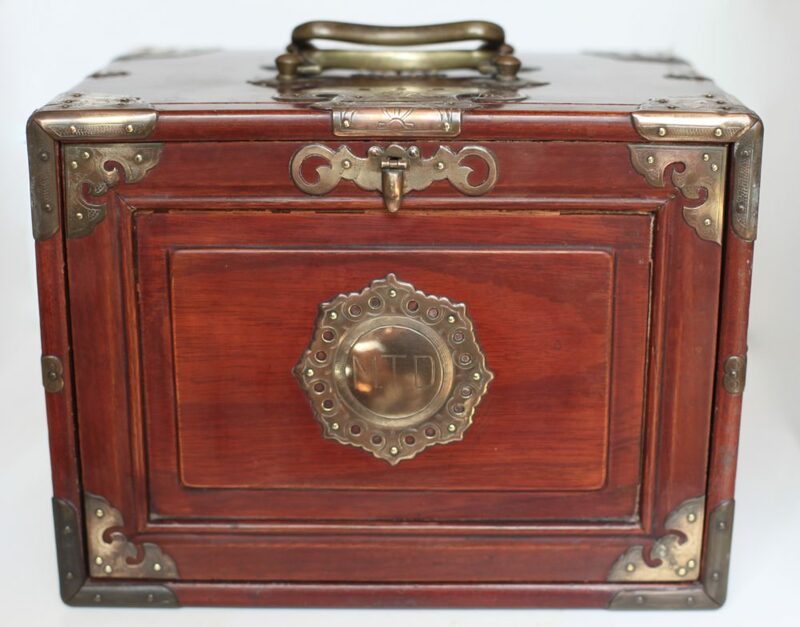 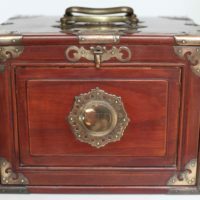 Lacquered box with brass fittings. 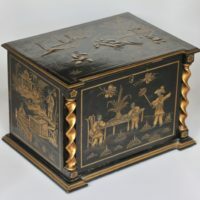 Bats dominate the designs of the brass. 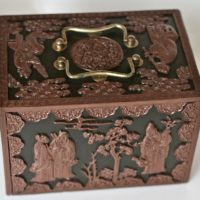 Fully carved set. 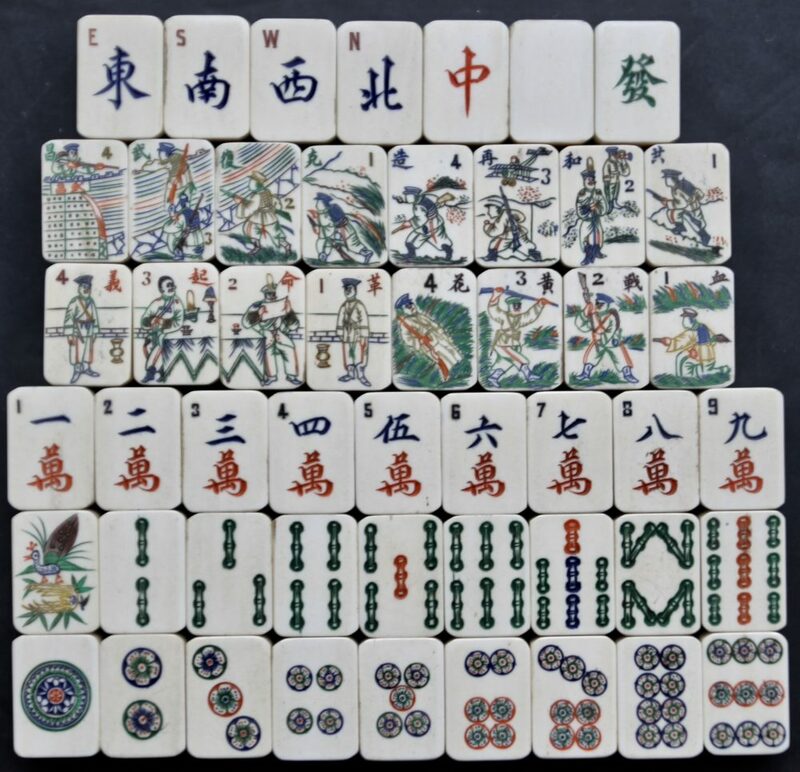 The flower tiles are interpreted as red sinograms -"The three heroes battling Lu Bu". 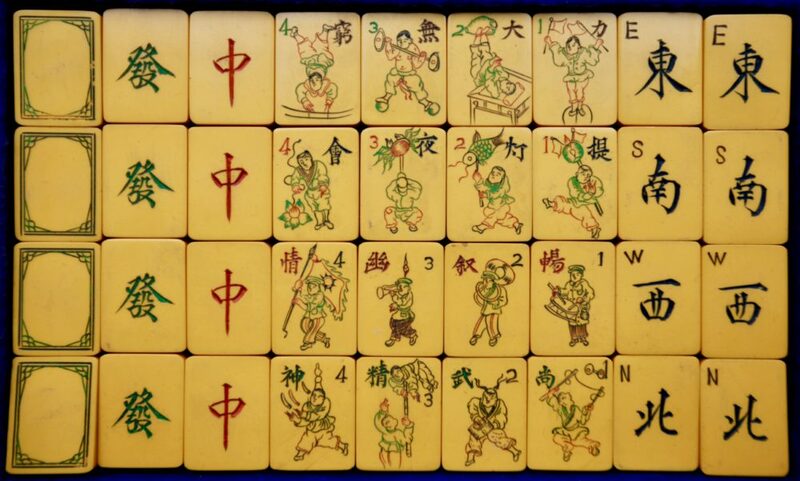 Green sinograms: these relate to the Battle of Hulao Pass, where the three sworn brothers(heroes) fight warrior Lu Bu. 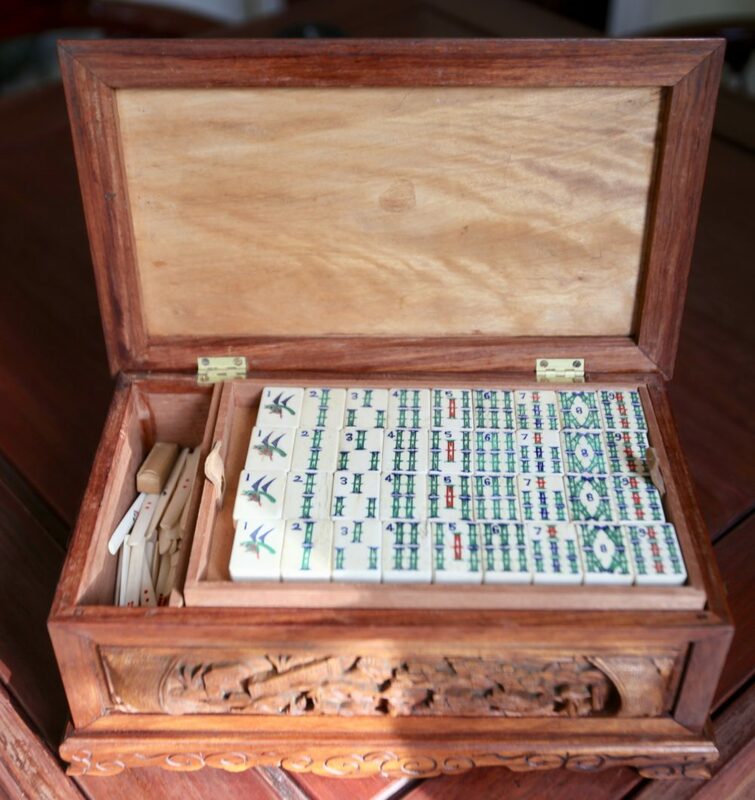 cabinet showing interior layout and drop-down front panel. 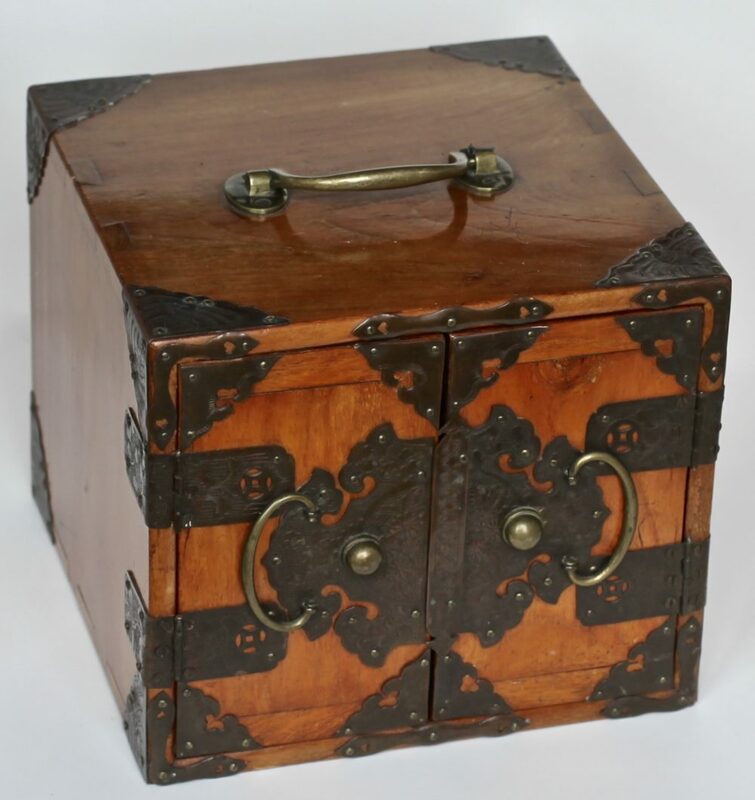 This German made cabinet is most unusual in both the quality of the images and the spiral supporting columns on either side of the front "door". 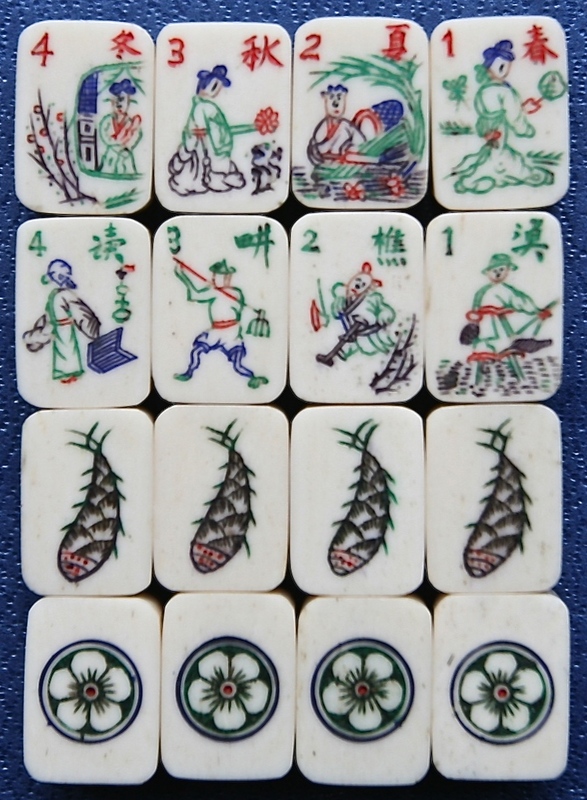 The trees have the Chinese symbols for four types of pine trees...松栢桐椿, song bai tong chun. 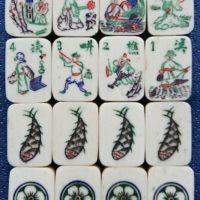 Pine, cypress, paulownia (the Phoenix tree) and the Chinese toon (tree of heaven). 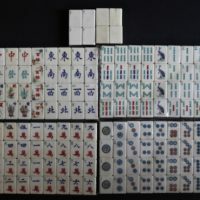 The other tiles are a Chinese idiom meaning to prolong life or to promise longevity, 延年益壽, yan nian yi shou (this is sometimes associated to a tonic or elixir, to show the product will benefit people in old age and gets linked to Shouxing, the God who controls the life span of mortals). 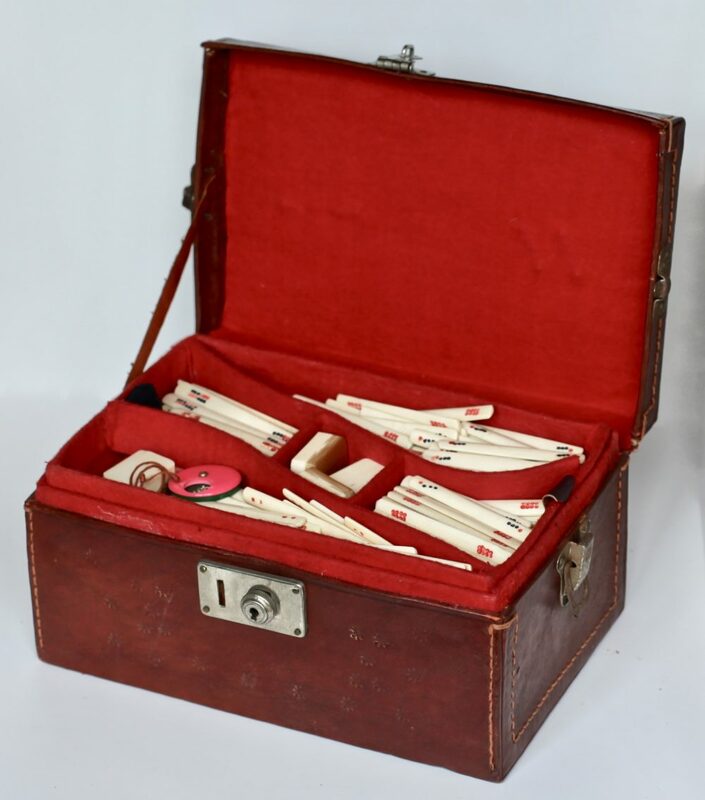 A very nice solid French Ivory set. 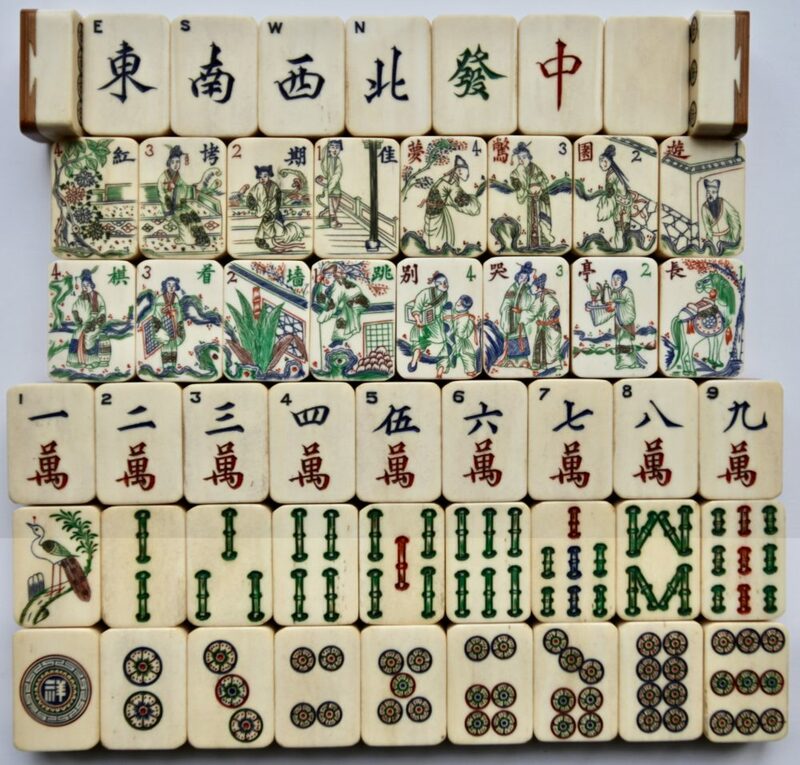 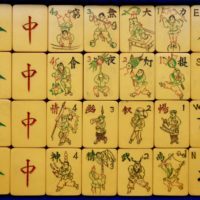 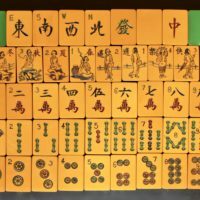 [A] The top row of tiles are from the Romance of the Three Kingdoms: 琴退司馬, Qin, Tui, Si, "Sima Yi retreats (at the sound of) the Qin"
This is better known as the Empty City Ruse and is where Zhuge Liang (great military strategist persuaded to join the cause of the three sworn brothers to return the Empire to its rightful dynastic rule) fools Sima Yi into believing the apparently empty city is a trap. 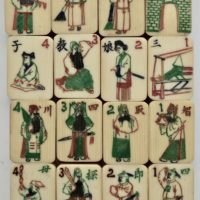 Sima Yi is the military strategist of one of the opposing armies. 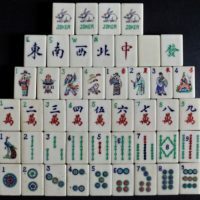 Following the Shu defeat at the Battle of Jieting, Zhuge Liang retreated with a small garrison force to Xicheng but was exposed to being attacked by the much larger overwhelming forces of the Wei army led by Sima Yi. 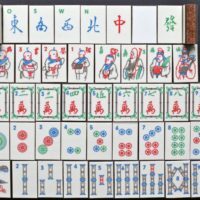 In the face of disaster, Zhuge Liang came up with a ploy to hold off the approaching enemy. 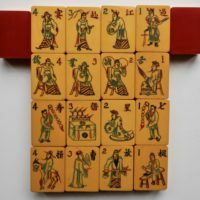 Zhuge Liang ordered all the gates to be opened and instructed soldiers disguised as civilians to sweep the roads while he sat calmly above the city gate playing his Qin. 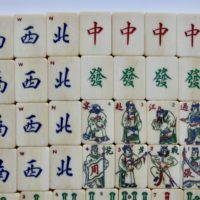 When the Wei army led by Sima Yi arrived, Sima was surprised by the scene before him and he ordered a retreat after suspecting that there was an ambush inside the city. 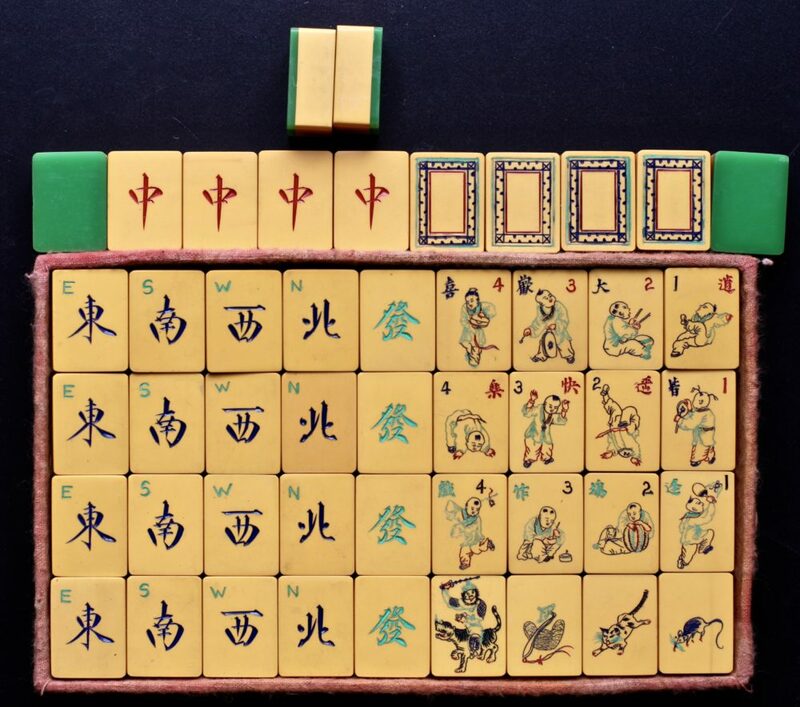 [B] The second row, 三娘教子, San Niang Jiao Zi, San Niang teaches her son (San Niang meaning “third mother”). 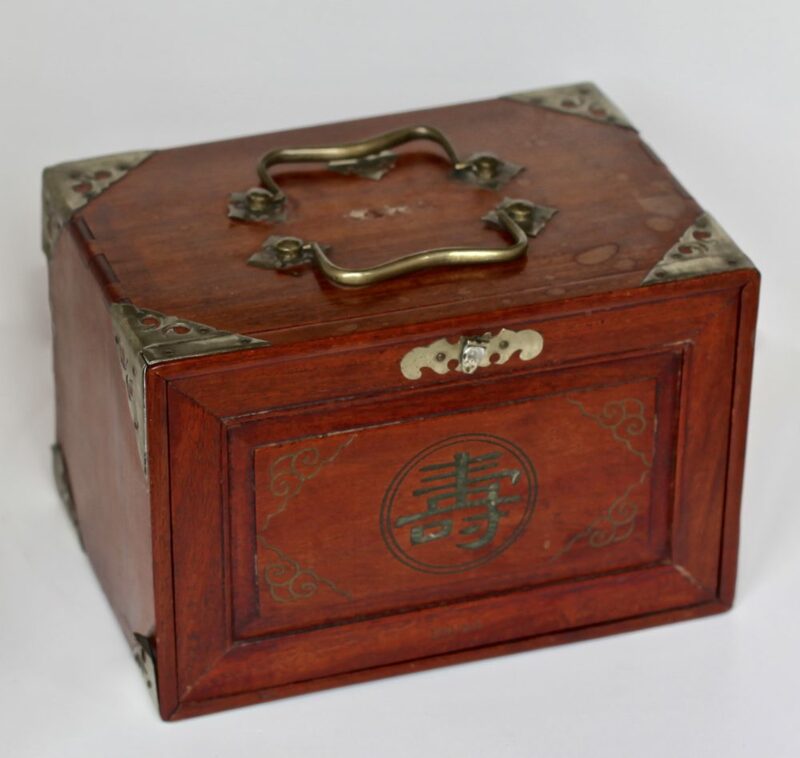 An extract from the ‘Historical Dictionary of Chinese Theatre’ describes this operatic tale …”a play of Beijing Opera, tells about the story of a captive’s return to his home from a distant land. 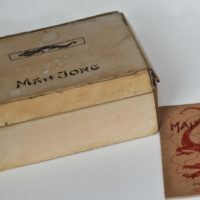 Because of separation by the flames of war, the leading character of the story has lived in a foreign country hostile to his motherland for many years and he even has set up another family there. 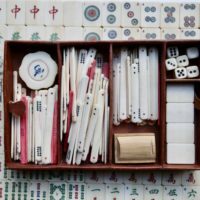 Therefore, when there is a war between the two countries, he is also struggling in his heart between the two families and this has made the road for his return to visit his mother tortuous, sentimental and full of contradictions”. 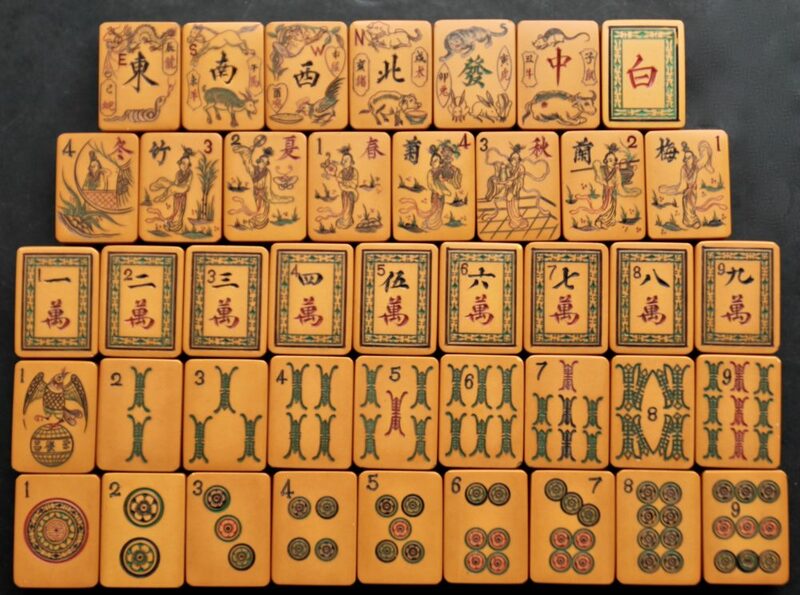 [C] The third row is also from the Romance of the Three Kingdoms, 智取四川, Zhi Qu Si Chuan. 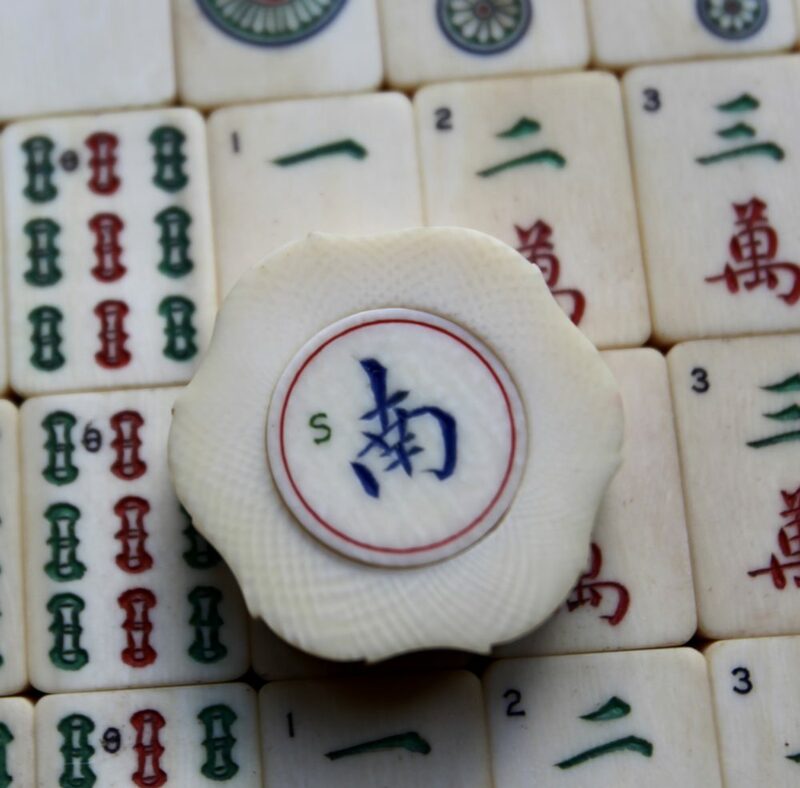 The first two characters mean "to take by strategy" and the second two are "Sichuan" (a southern province in China). 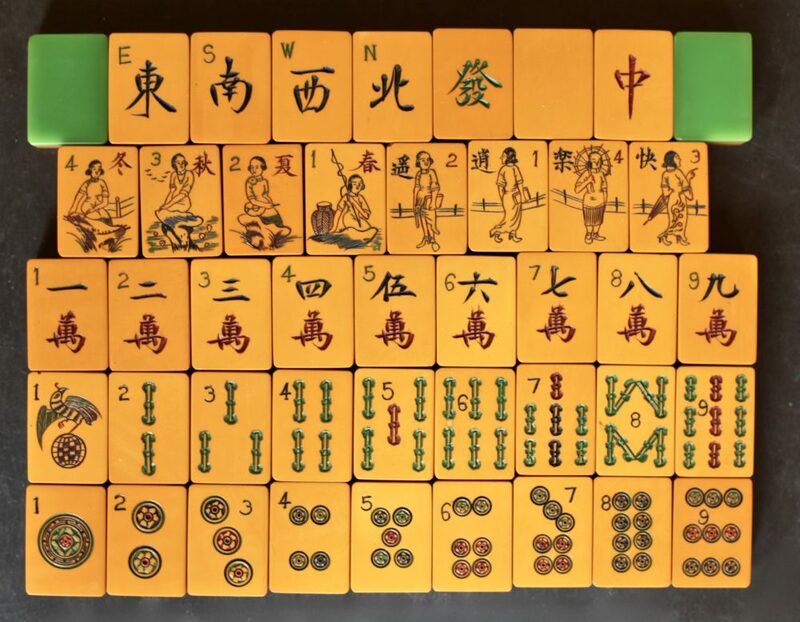 This may mean, in part, that the capital city of the Shu empire, Chengdu (which is now the capital city of Sichuan province) was captured through the strategic advice of Zhuge Liang rather than by force. 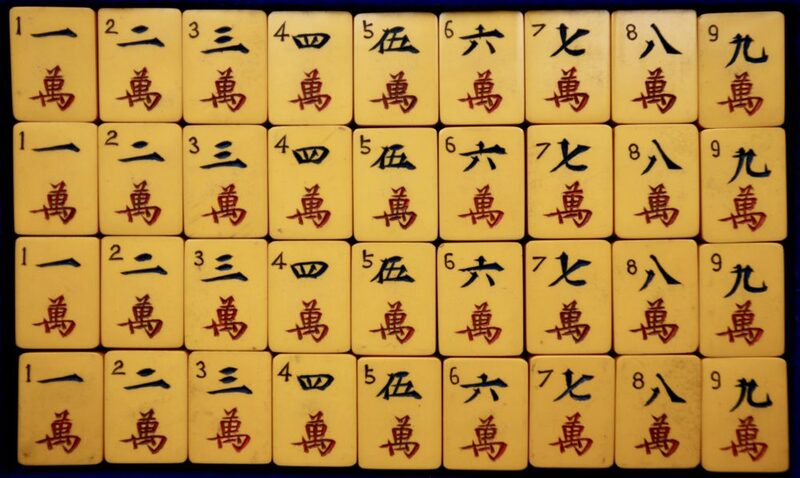 The "strategy" here refers to the ‘Longzhong Plan’, and so the tiles may well be referring to the establishment of the Shu kingdom, rather than specifically to its capital. The ‘Longzhong Plan’ was developed by Zhuge Liang to establish the Shu Kingdom under Liu Bei (the Shu, Wei and Wu are the three Kingdoms within the story) as a precursor to the reunification of China under the Han dynasty. 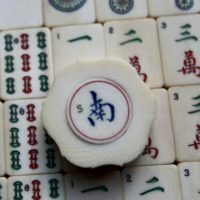 (A plan that eventually failed in the longer term, as the Han was not restored). 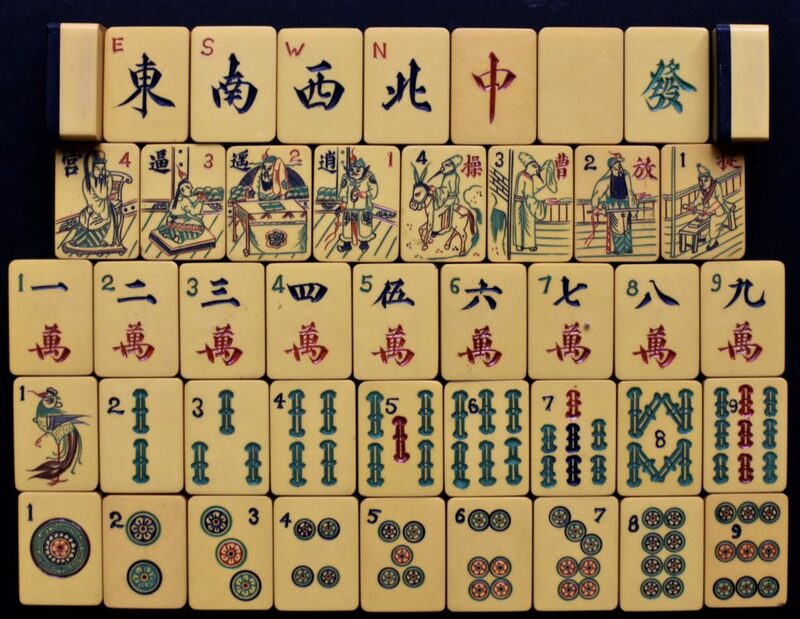 [D] The fourth row is 四郎探母, Si Lang Tan Mu, or The Fourth Son Visits His Mother, a popular Peking Opera. 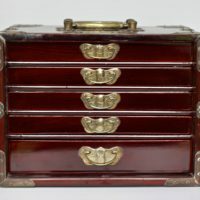 Interior of cabinet showing drawer pulls. 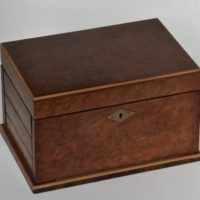 The front panel is released by a button on the top of the cabinet and folds down and slides underneath the bottom drawer. 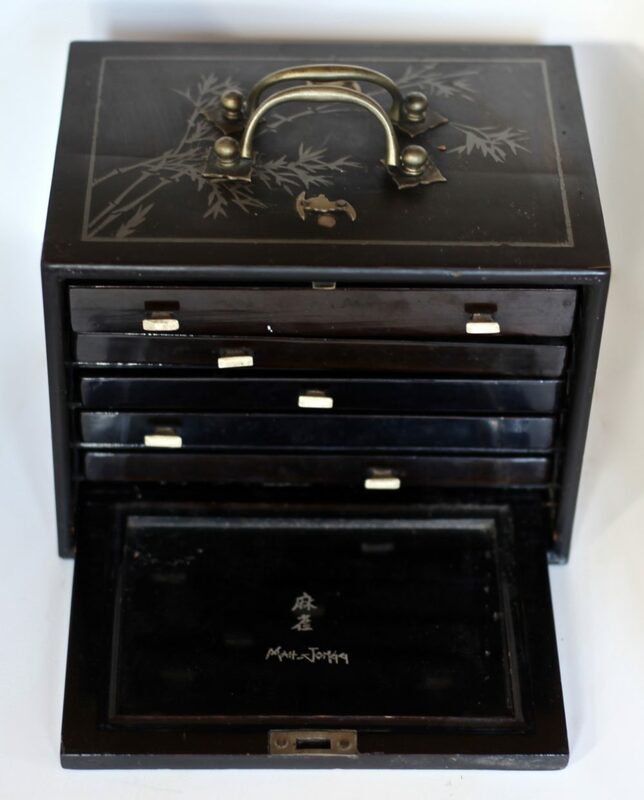 This design was patented after a design by Albert Hager, one of the three founders of the MJ Sales Co.
A MJ Sales Co., of America black lacquered cabinet displaying designs painted in silver. 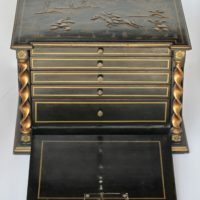 Rear side of cabinet. 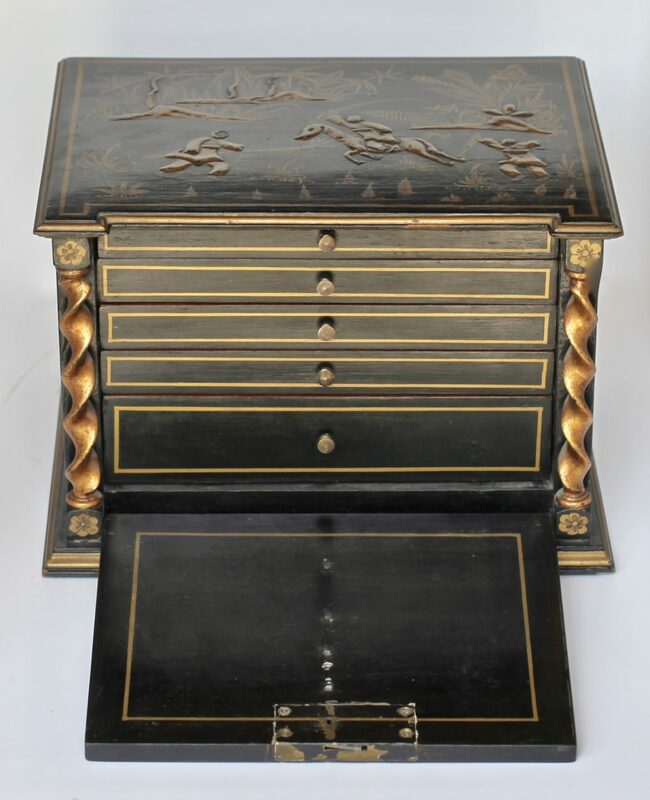 Front and side of cabinet. 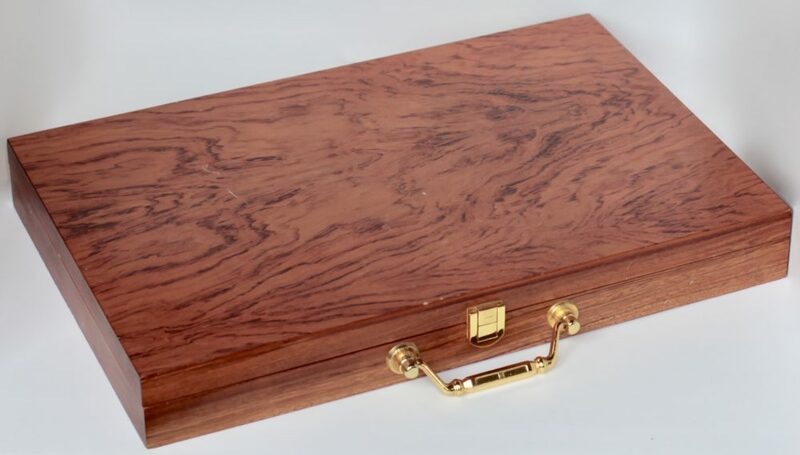 Bone with ebony backs. 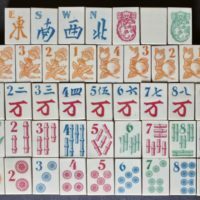 148 tiles. 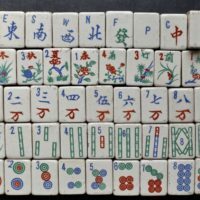 Interesting flower tiles and one bam. 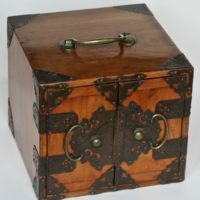 Cabinet displaying intricate bone marquetry. 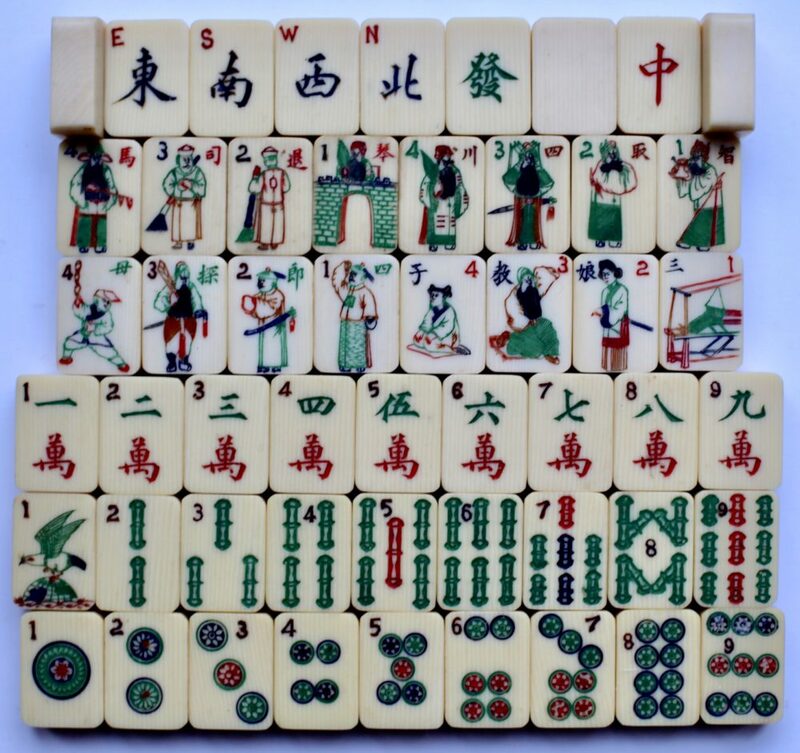 A nice example of a Chinese Bakelite tile set backed with a red wafer. 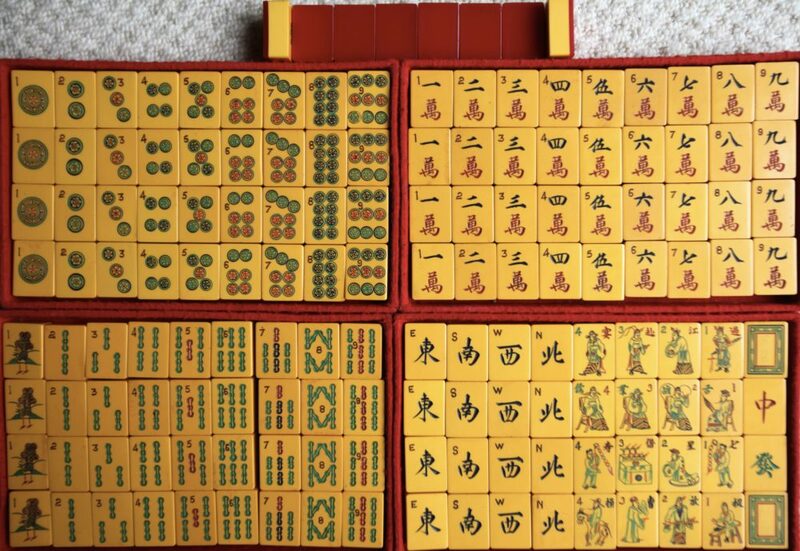 Top row are simply 春夏秋冬, spring, summer, autumn, winter. 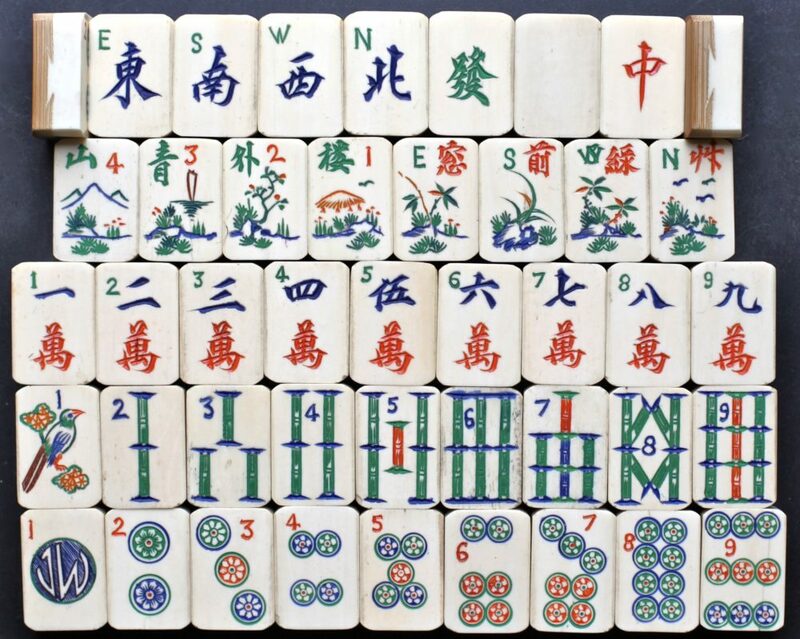 2nd row down are 遊芳艸地, which means something like a stroll in the fragrant meadows. 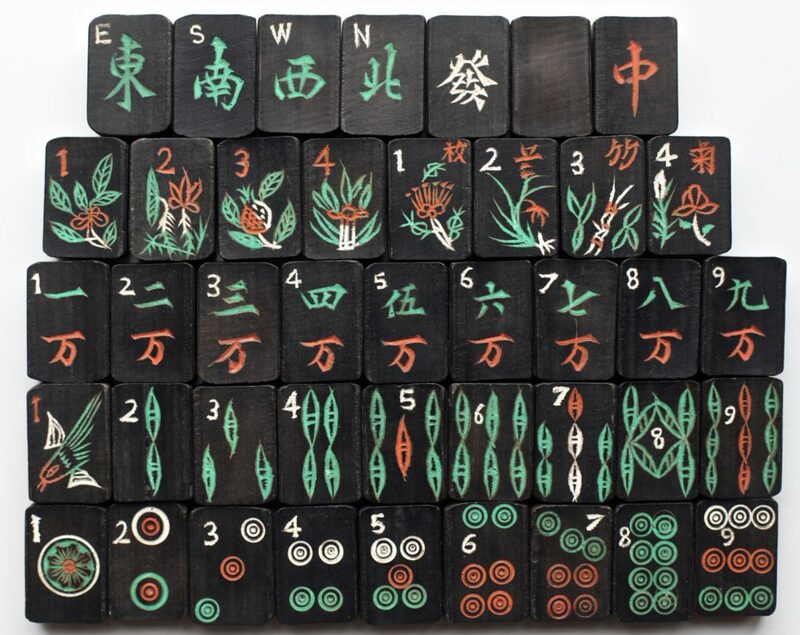 3rd row down are 梅蘭竹菊 , plum, orchid, bamboo, chrysanthemum. 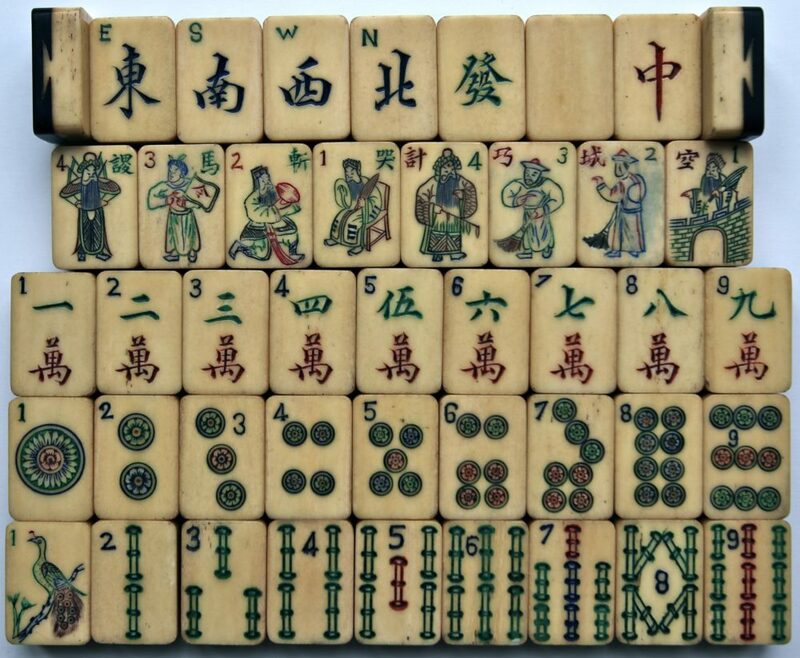 And the bottom row are 世界文明 , civilised (or cultured) world. 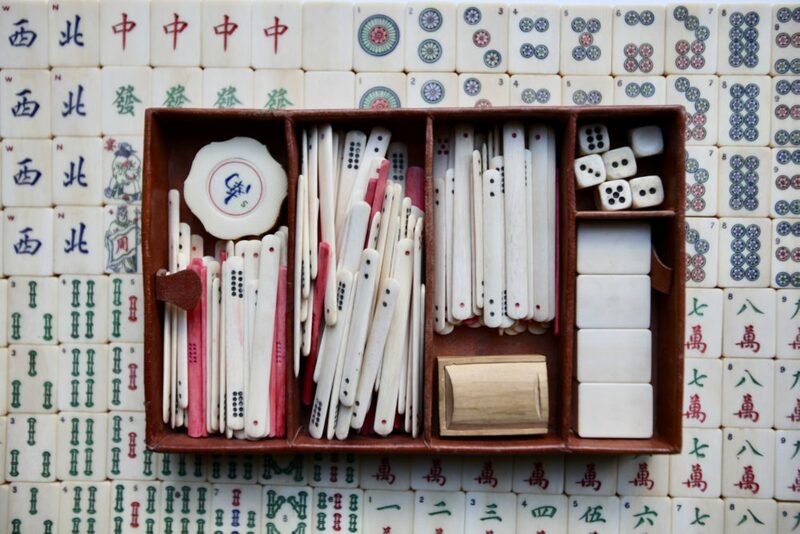 It seems to be like an al fresco photo shoot. 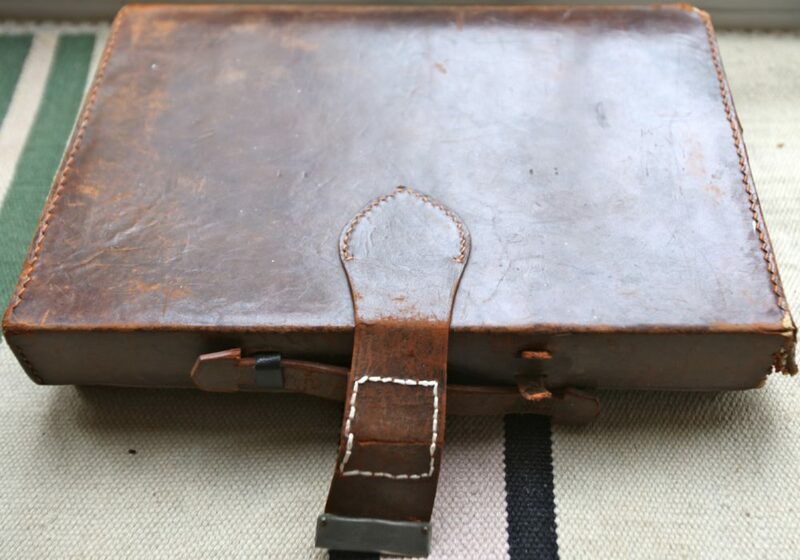 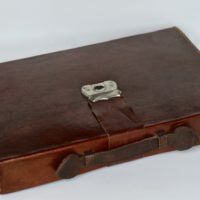 Standard attaché case of leather stitched over a cardboard frame. 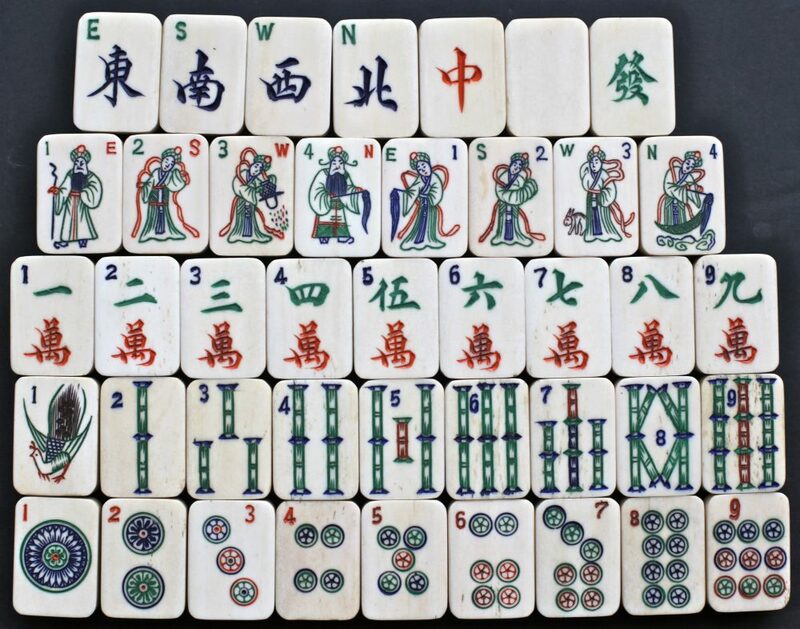 Thick bone and bamboo tile set showing a representation of each of the three suits and Directions and 'Dragons' plus all the 16 Flowers. 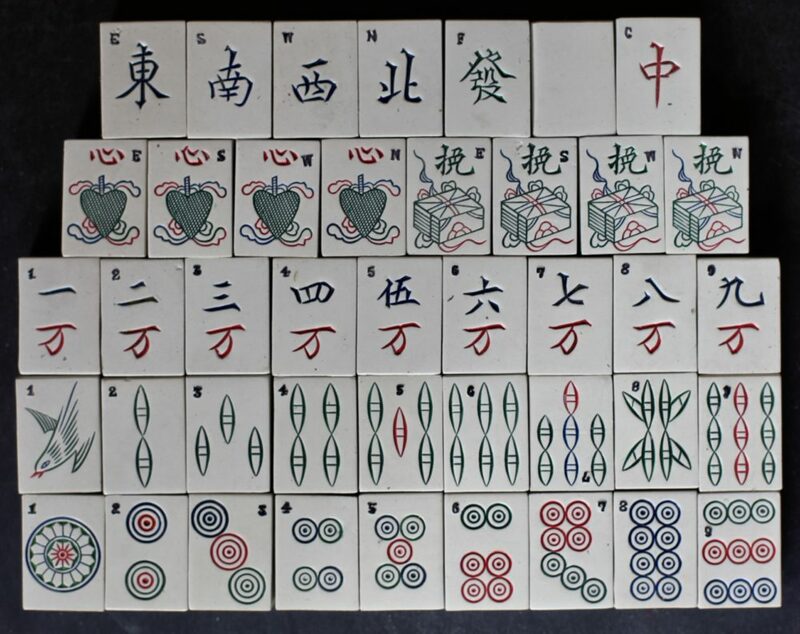 The four #1 Circle or Cash tiles, showing the stylised sinograms in the middle of each tile. 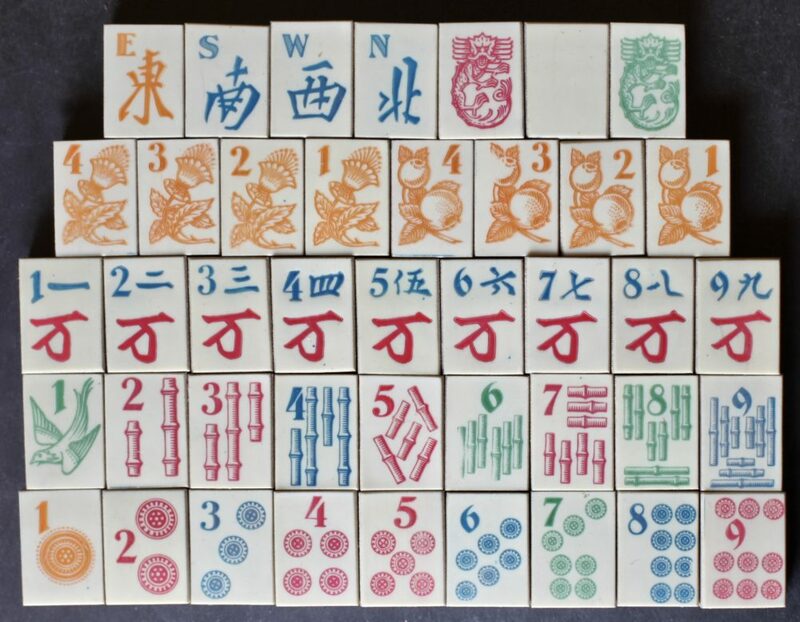 These tiles appear to be 福萬豐造 "made by Fu Wan Feng" probably a manufacturer or engraver's name, though the order could be any combination. 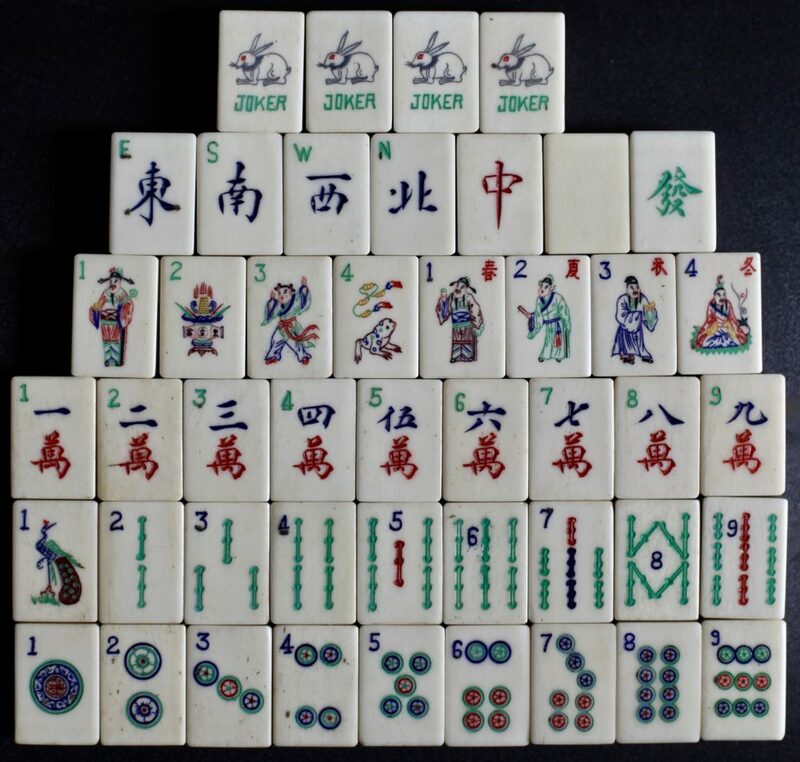 The sinograms are in the order as they appear on the tiles in the picture. 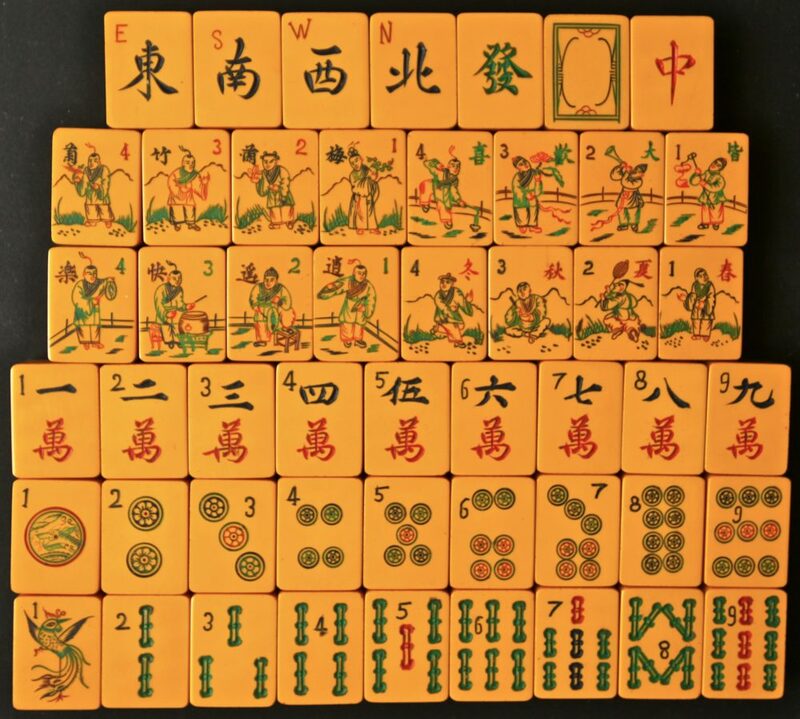 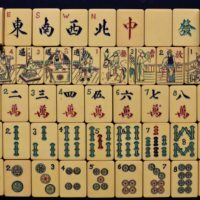 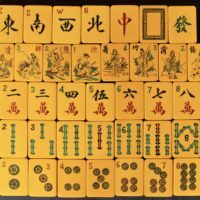 Row 1: 棋著墻跳, "jump a wall to play chess", from Romance of the Western Chamber. 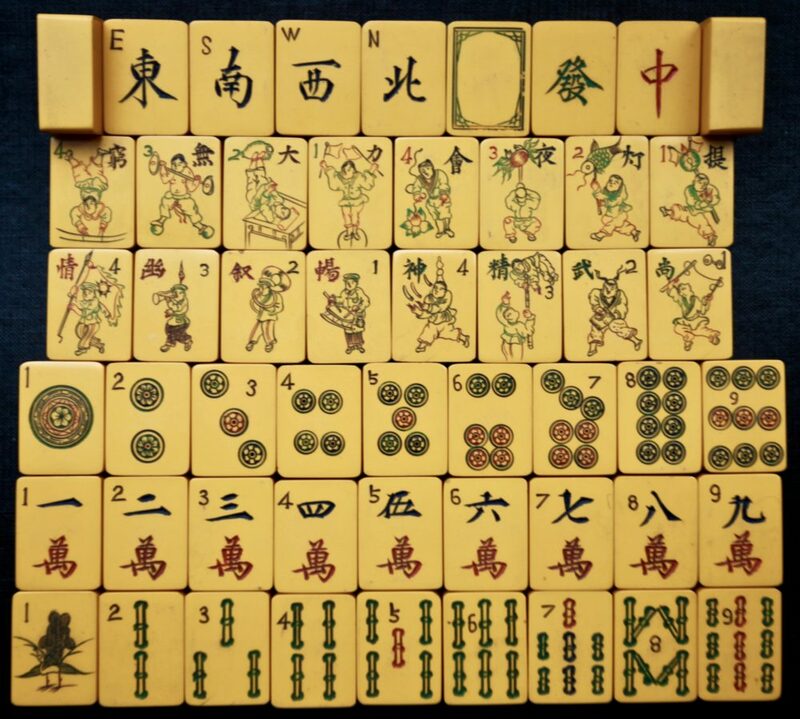 Row 2: 紅拷期佳, "interrogate red about a wedding”, from Romance of the Western Chamber. 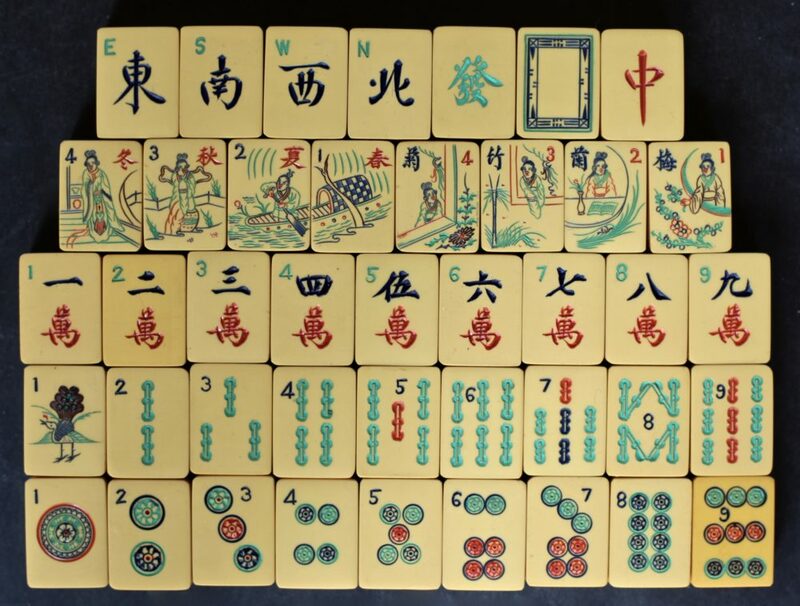 Row 3: 別哭亭長, "weep at the parting in the ten mile pavilion", from Romance of the Western Chamber. 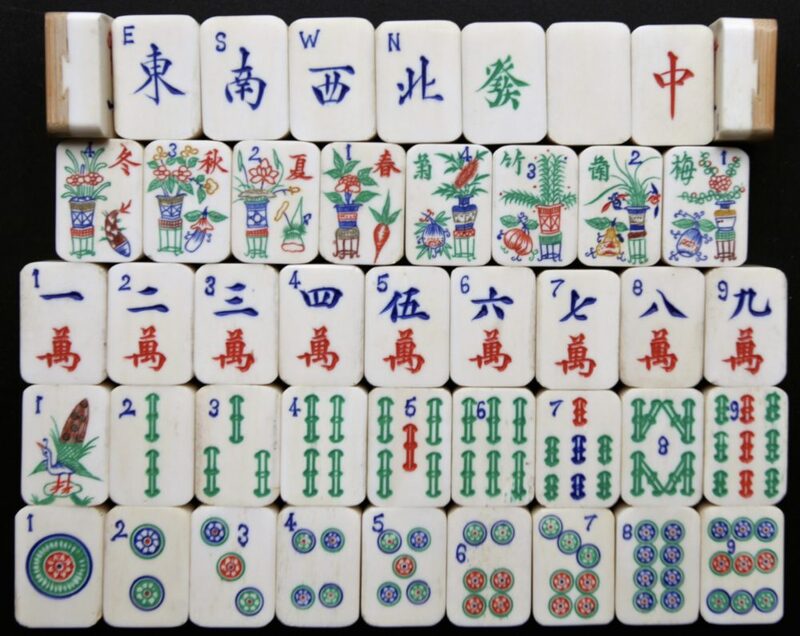 Row 4: 夢驚園游, "to walk in a garden and to be startled from a dream", from The Peony Pavillion. 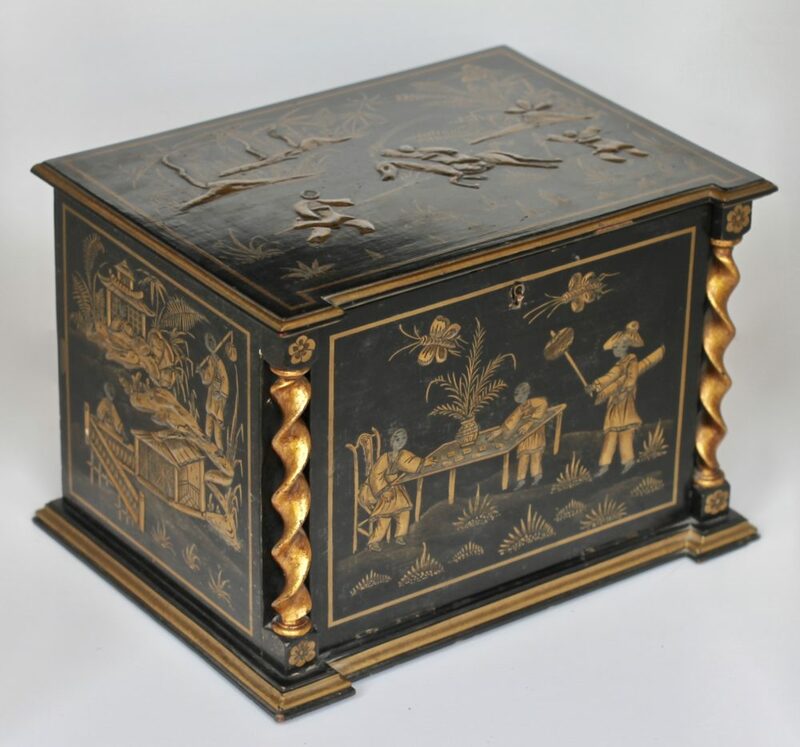 Romance of the Western Chamber. The Romance of the Western Chamber is a truly ancient story: the Wang Shifu story, was written during the Yuan Dynasty (around 1300) and originated directly from an earlier prose romance The Story of Yingying by Yuan Shen of the Tang Dynasty, dated to around the year 800. 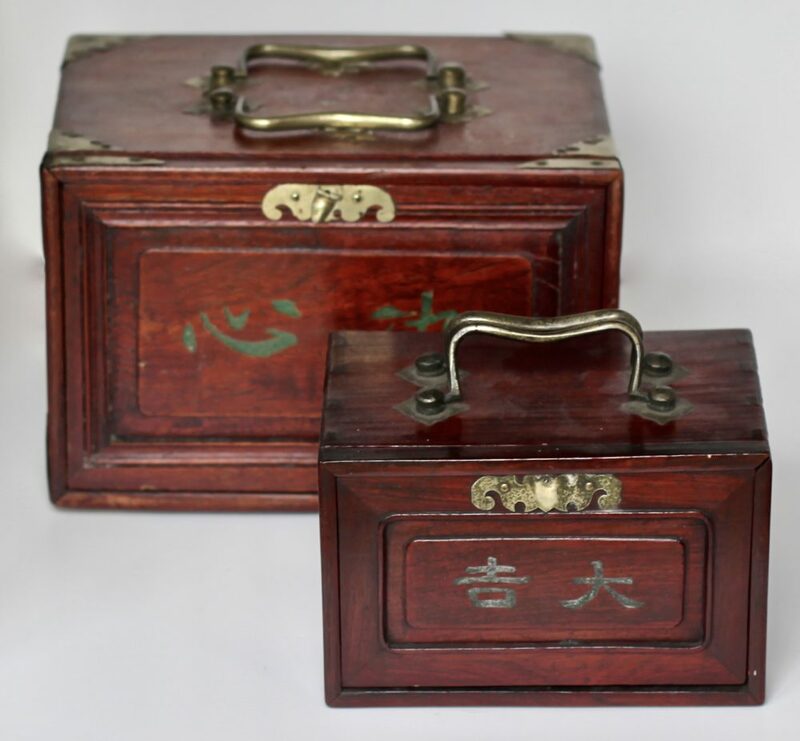 The Story of Yingying is a tragedy about the love, union and separation between Zhang Sheng and Cui Yingying. 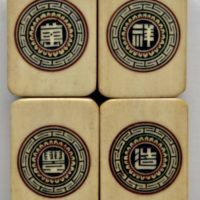 There are two different endings, one happy - where the two lovers are united at the end, and one rather sad where they remain separated. 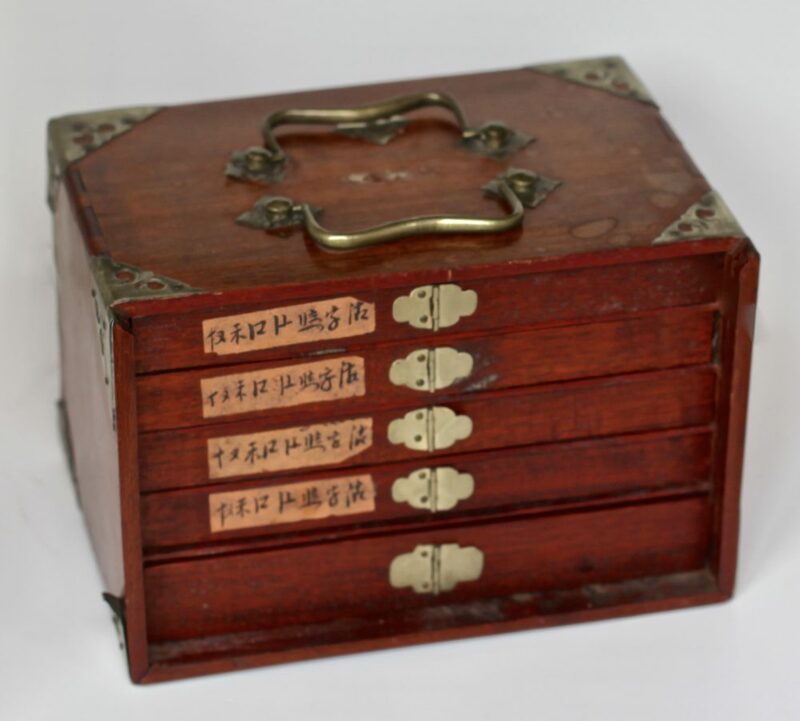 Romance of the Western Chamber tells that a young scholar Zhang Sheng went to the capital city to take the highest imperial examination. 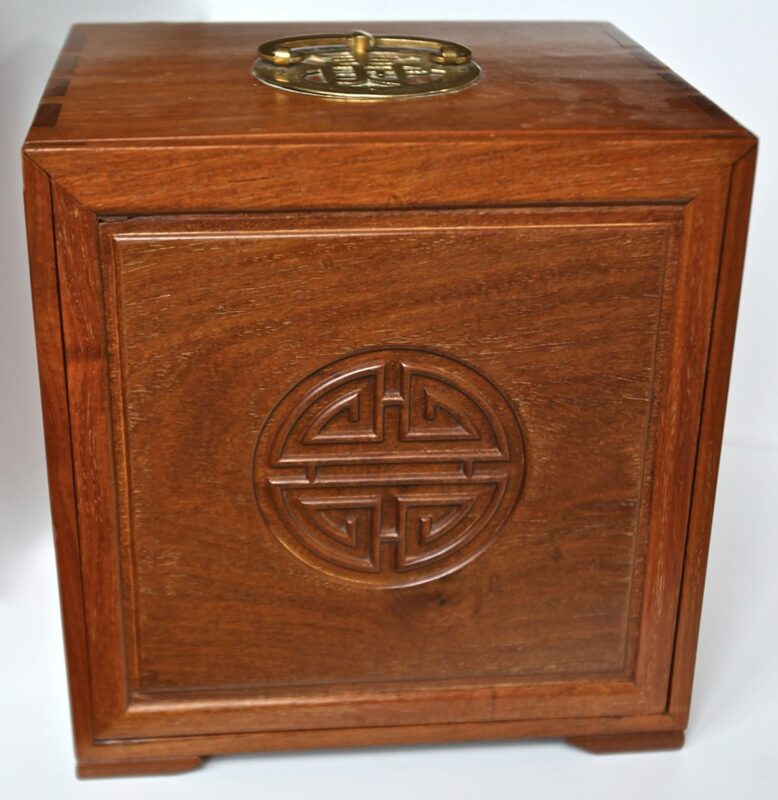 When he stayed in a temple, he met Cui Yingying, daughter of the then Prime Minister and fell in love with her. 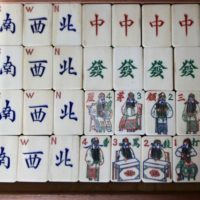 At night and separated by the wall between them, Yingying burnt incense and they recited poems to each other in expression of their love. 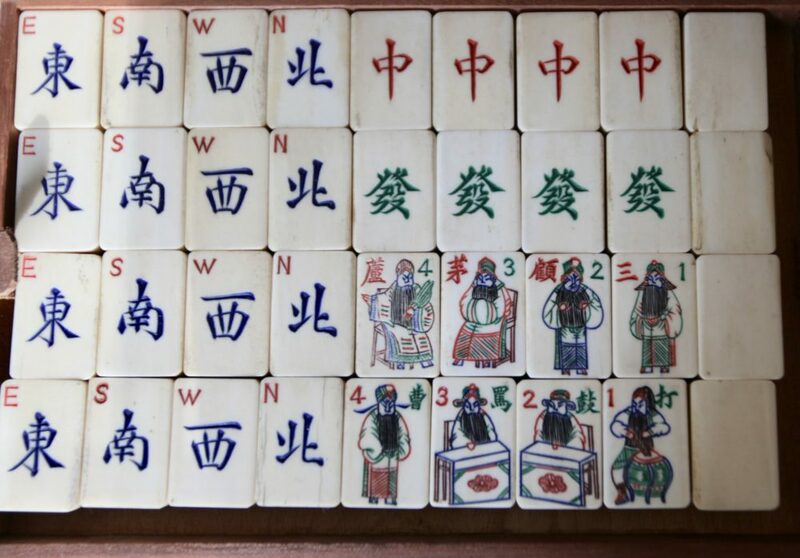 This idyllic scene is overtaken by events, as the temple is besieged by a rebel army, the leader of the rebels demanding to take Yingying as his wife. 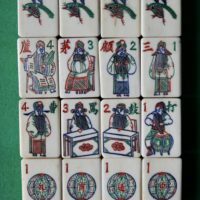 Yingying’s mother, Madam Cui, promised Yingying's hand in marriage to anyone who could force the rebels to lift their siege. 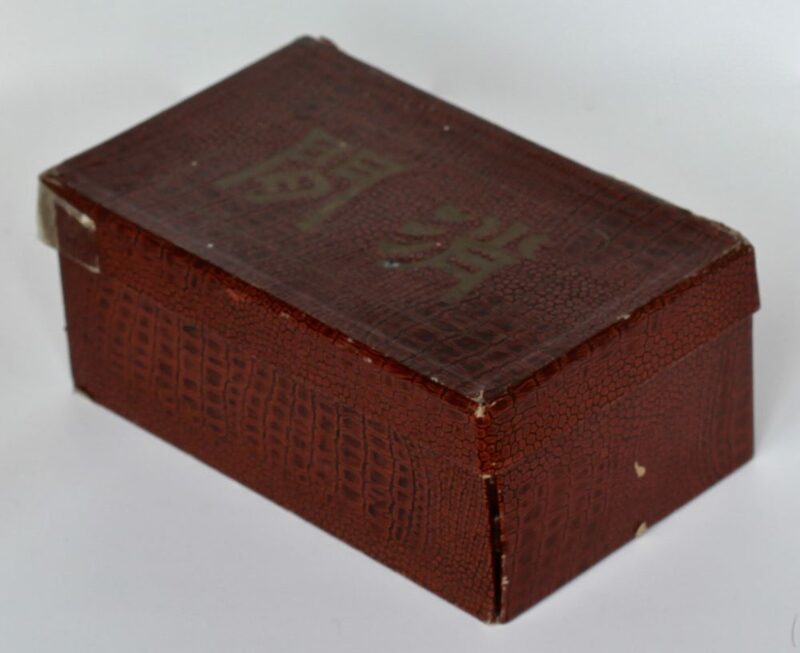 Zhang wrote urgently to his friend General White Horse for help and was able to save the temple. 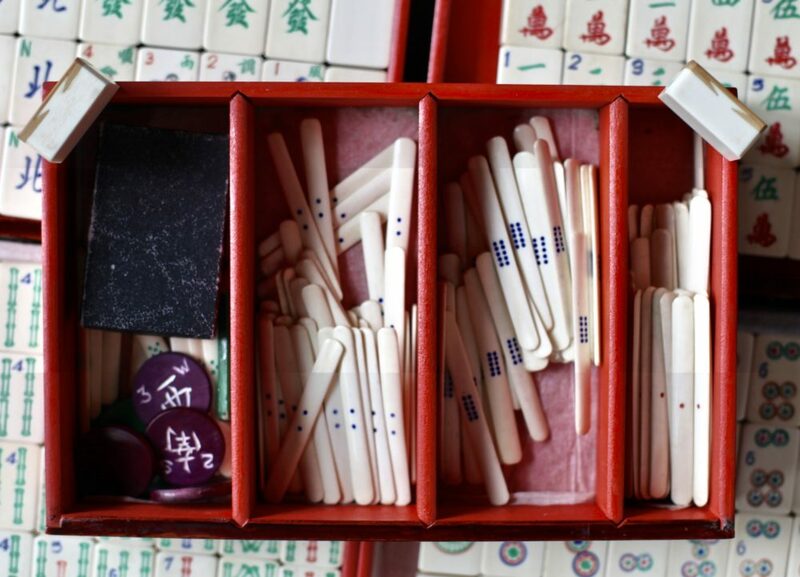 However, the mother refused to allow Yingying to marry Zhang, giving the excuse that her daughter had been promised since childhood to another. 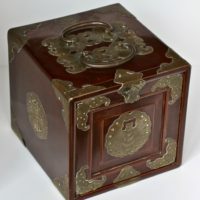 Sorrow-stricken, Zhang fell ill. Yingying's handmaiden Hong Niang (or “Red Maid”) however, helped the lovers to meet secretly in the Western Chamber. 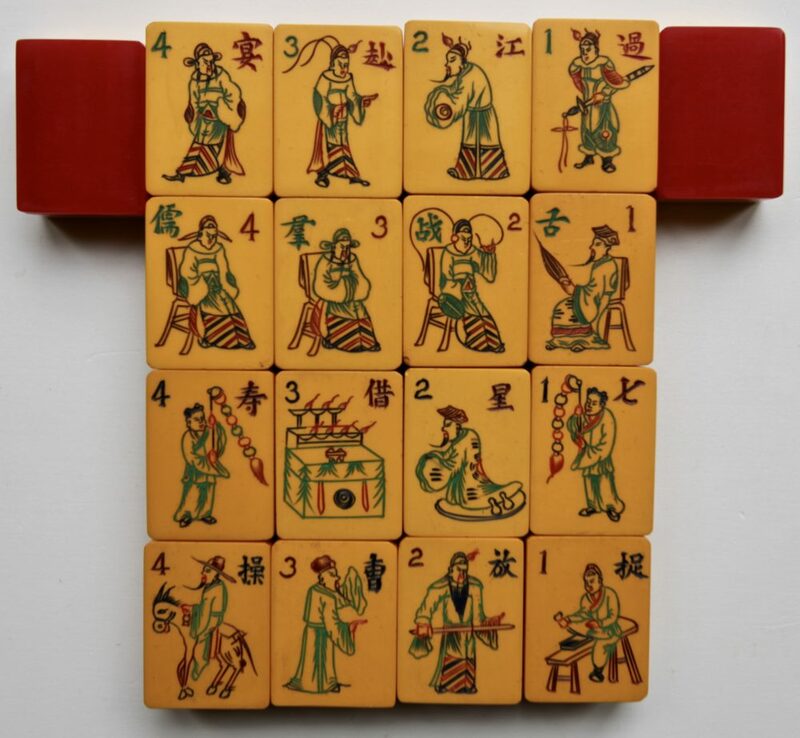 Here in the operatic version, is where Zhang climbs over the wall to play chess with Yingying – the 1st row of tiles, “jump a wall to play chess”. 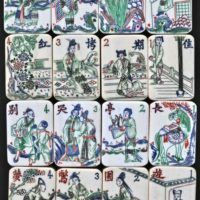 But, the mother discovered the lovers' meeting and interrogated Hong Niang – the 2nd row of tiles, “interrogate Red about a wedding”. 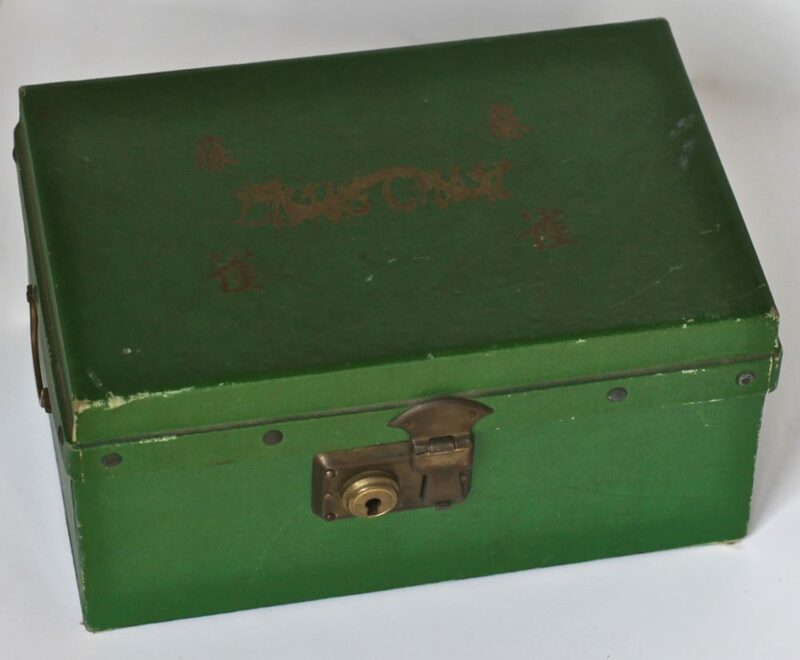 Fortunately, with her eloquence and ingenuity, Hong Niang was able to persuade Madam Cui to consent to the marriage of the two, on the condition that Zhang successfully obtain a high official post. 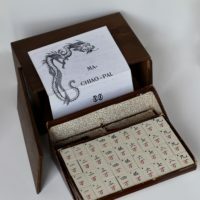 Yingying separated tearfully from Zhang at the Ten Mile Pavilion – the 3rd row of tiles, “weep at parting in the ten mile pavilion” - as Zhang proceeded on horseback to the imperial capital to take the examinations. 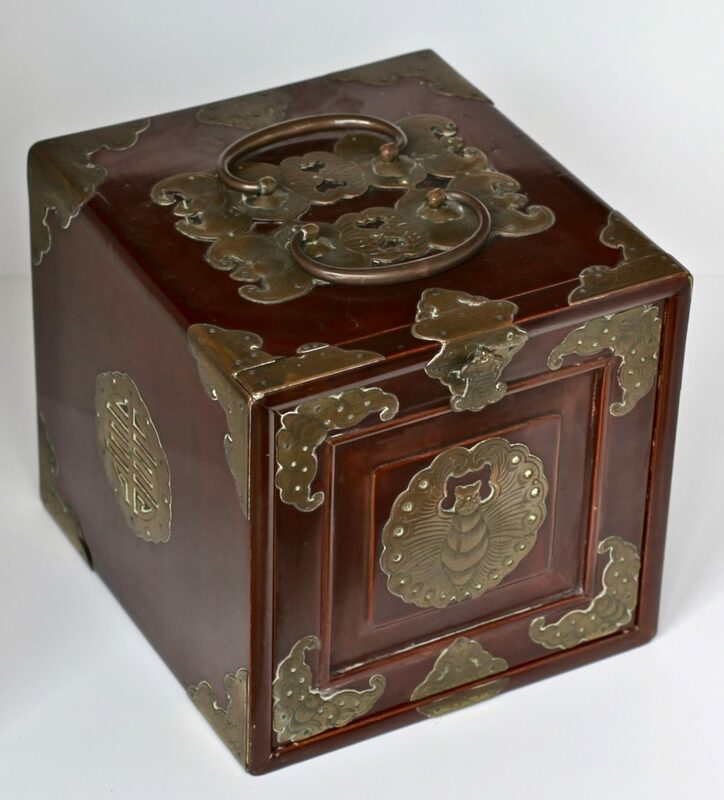 Zhang eventually returned, having topped the imperial examinations, and the lovers were united in marriage at last. 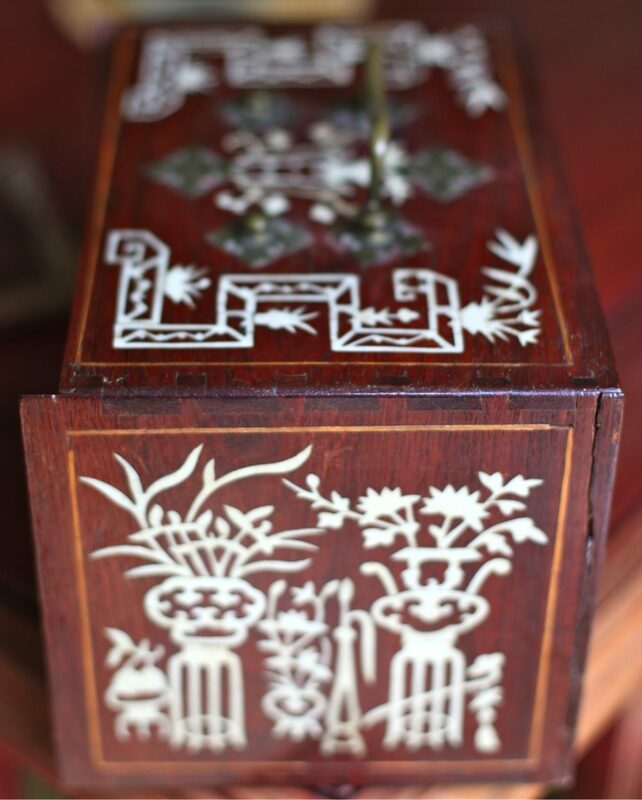 The Peony Pavilion is a story of how true love conquers all! The original drama dates back to the very late 1500s and in its original written form consists of fifty-five scenes that would have been performed over several days. 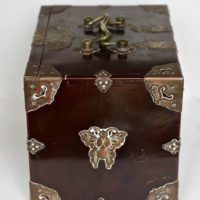 Very briefly, most retellings of the story focus on the love story between Du Liniang and Liu Mengmei, depicted over just a few of those scenes. 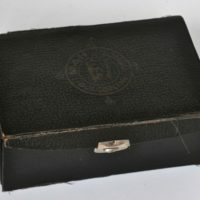 Du is the daughter of a high official. 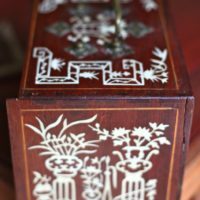 She falls asleep in the Peony Pavilion while enjoying a walk on a beautiful spring day in her family’s garden – the first part of row 4, "to walk in a garden". 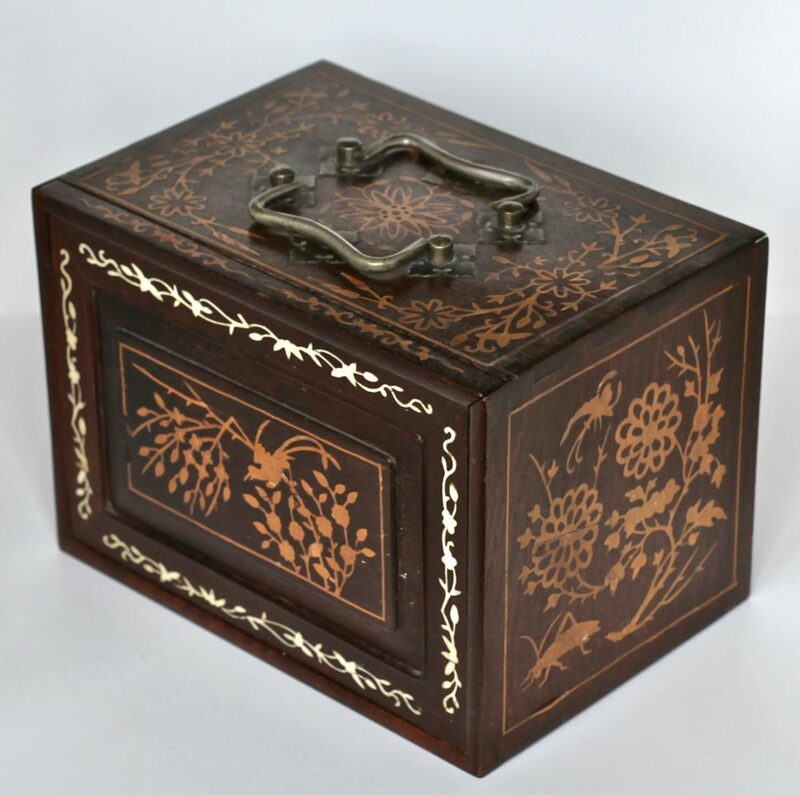 She dreams of a romantic encounter in the garden with a promising young scholar whom she has never met. 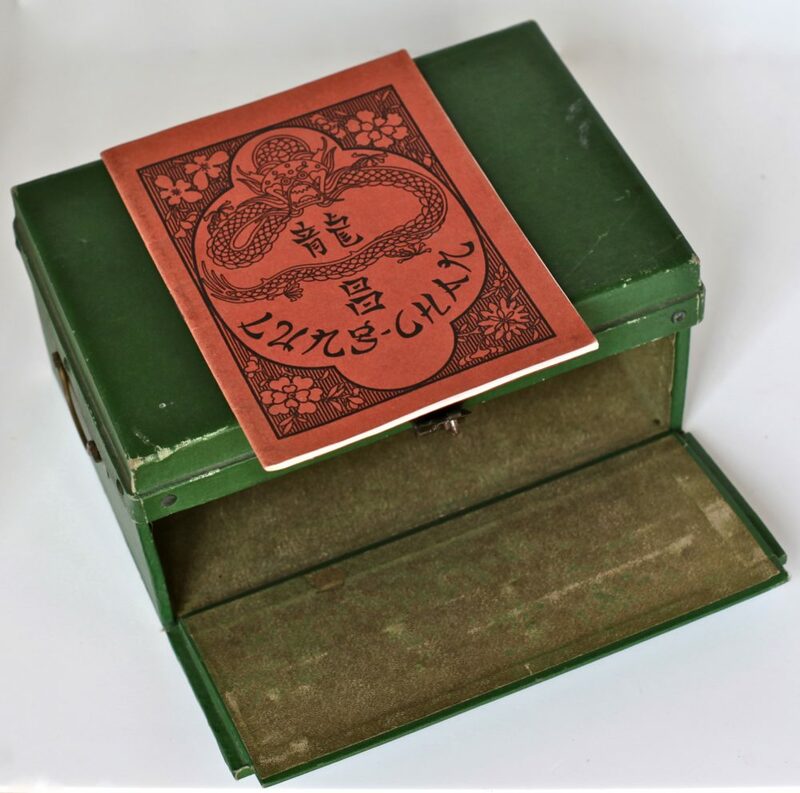 Startled awake by petals falling on her – the second part of row 4, "to be startled from a dream", she pines for her dream lover. 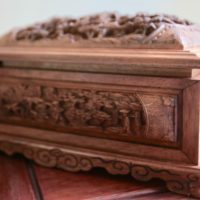 Du is so love-struck that she dies of longing. 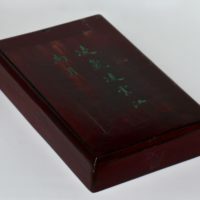 However, before she dies, Du paints a portrait of herself, which is concealed by the pavilion near her grave beneath a plum tree. 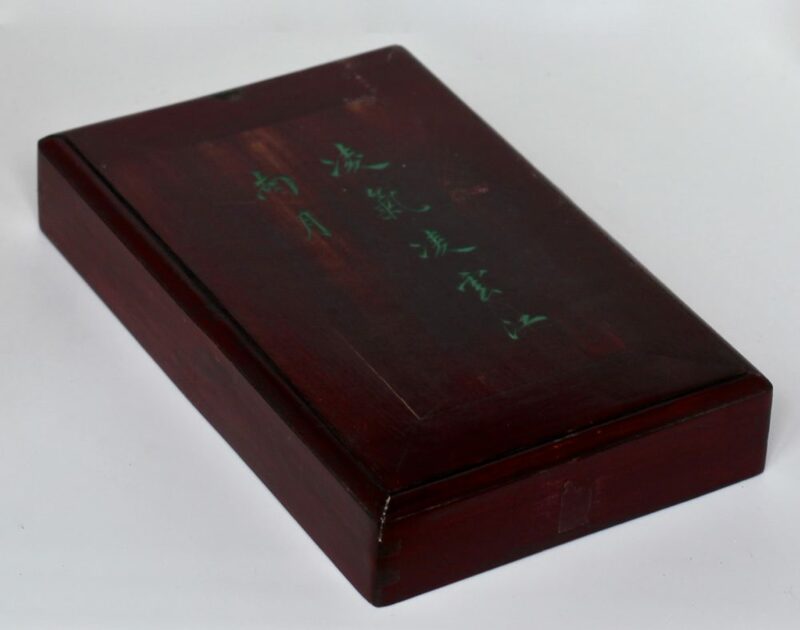 Later, Liu Mengmei, on his way to the capital to take the imperial civil service examination, spends a night in the garden. 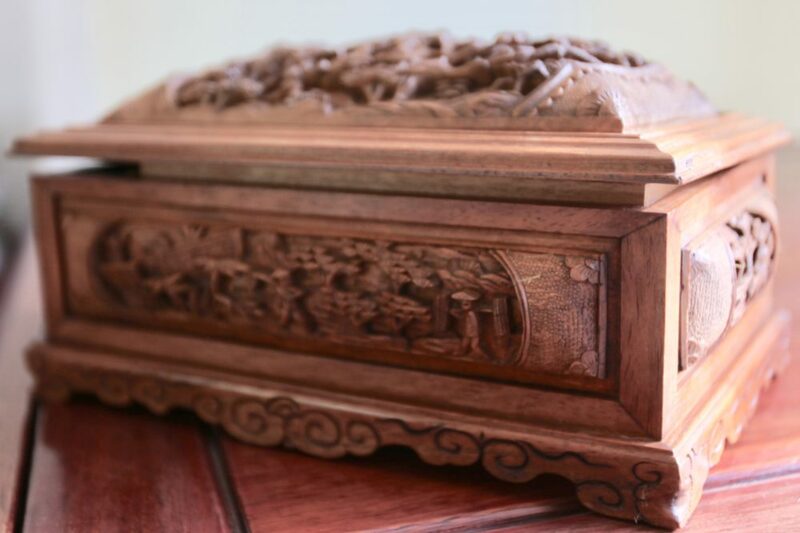 There, he discovers the portrait, falls in love with Du Liniang’s likeness, and has a rendezvous with her ghost. 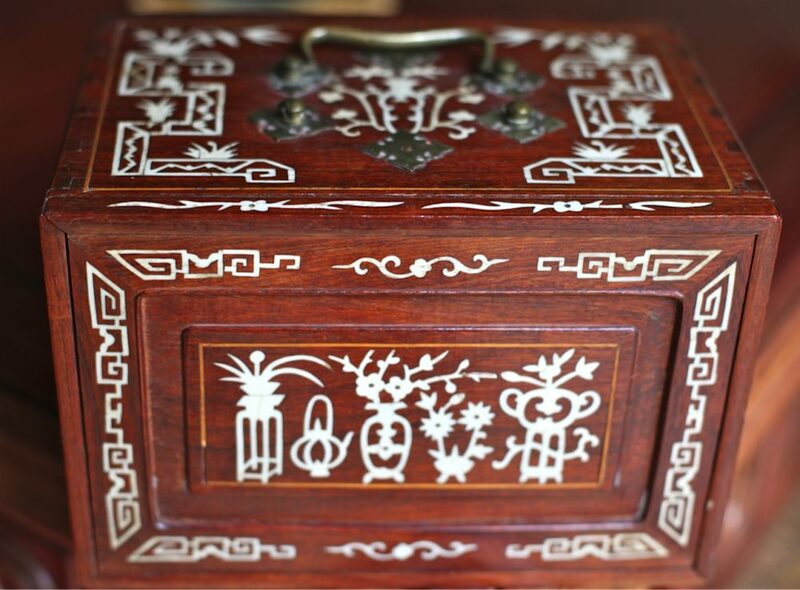 Recognizing that Du and Liu are fated to be wed, the Judge of Hell, Lord of the Underworld, restores Du to life. 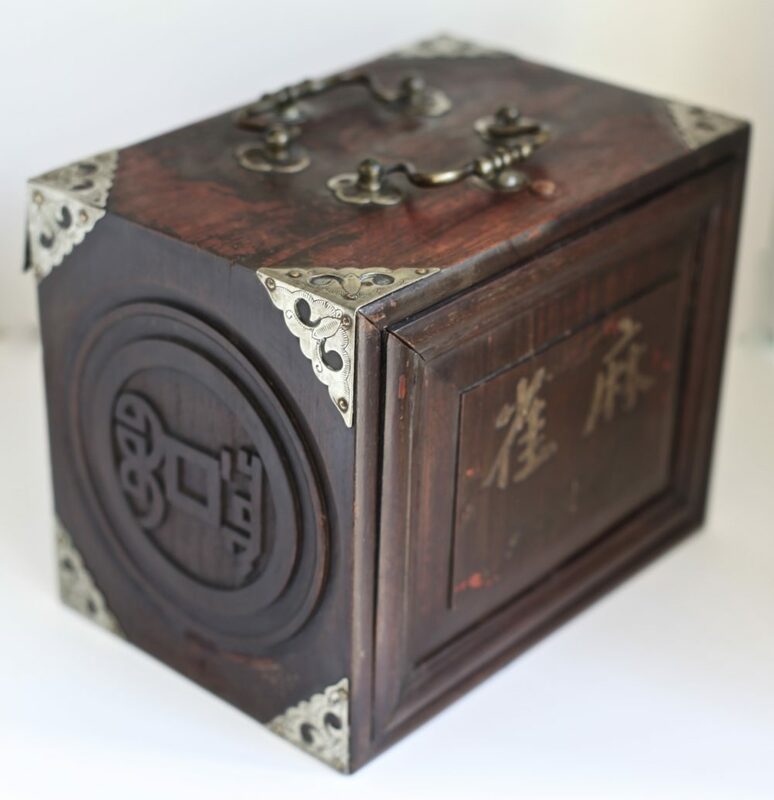 Du then appears to Liu in a dream and directs him to disinter her body. 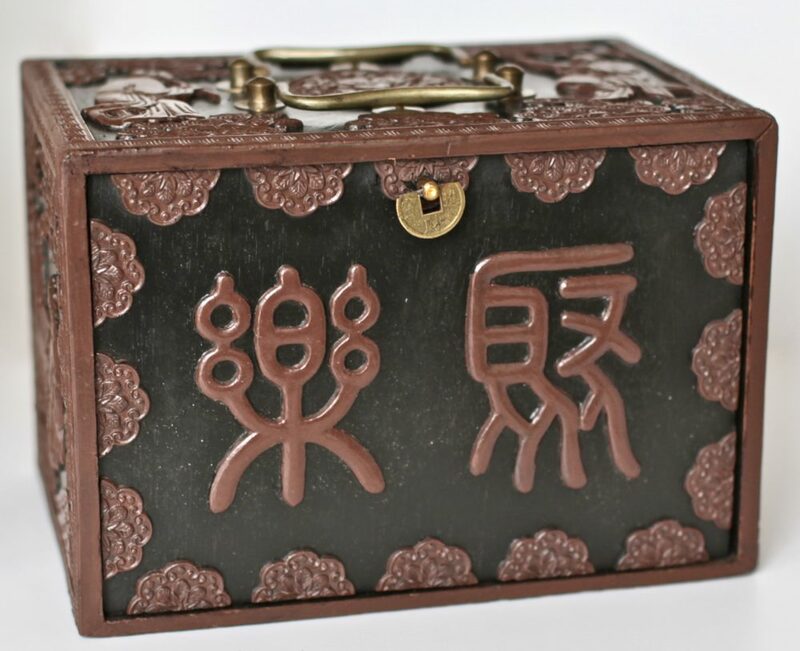 Trusting in his own love, Liu does as she instructs, whereupon the lovers are united. 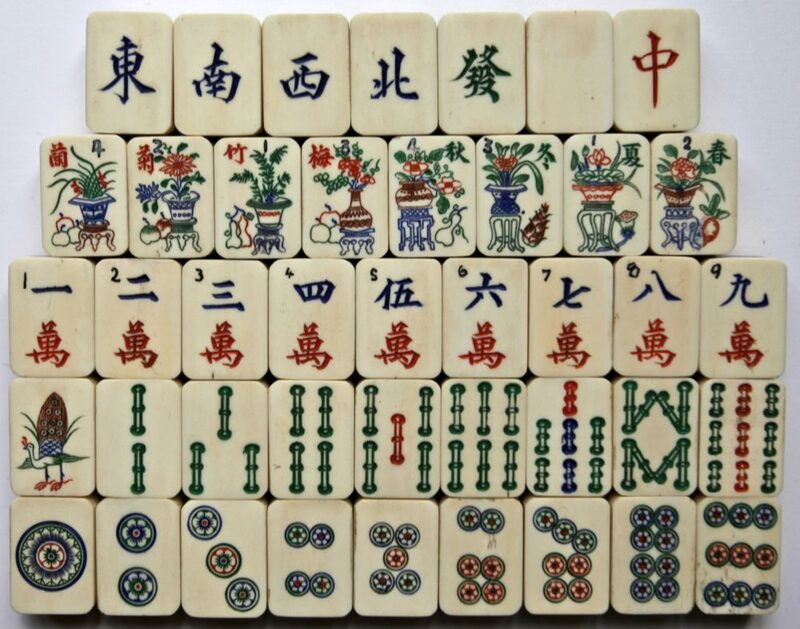 The same Flowers showing the rows concerned with the Romance of the Western Chamber (1-3) separated from row 4 which refers to The Peony Pavillion. 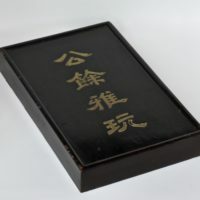 For reference, the translations are repeated. 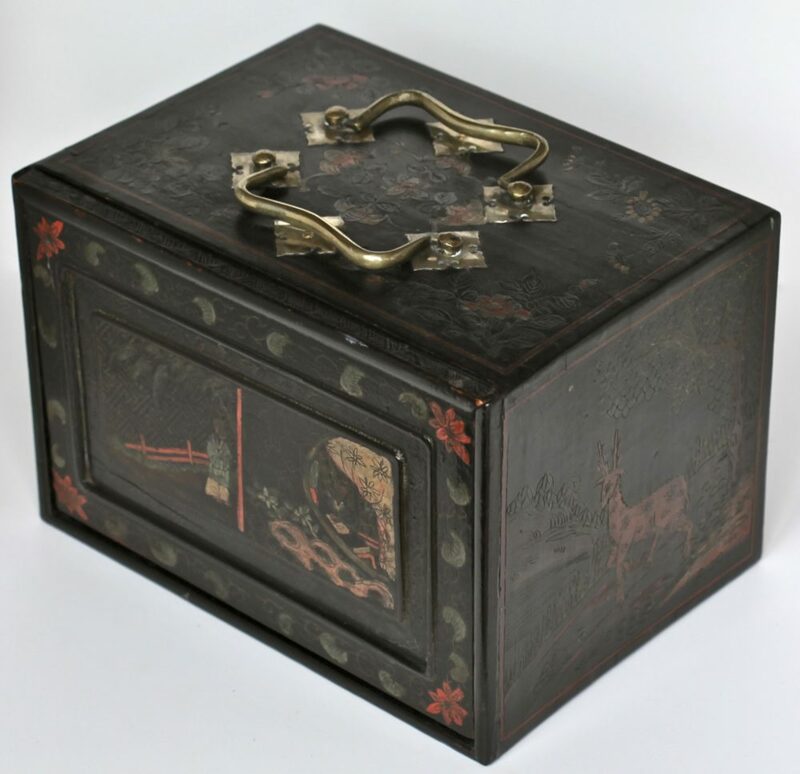 The decorations on the box are of a cinnabar coating on wood. 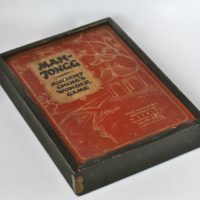 This image shows the front of the box. 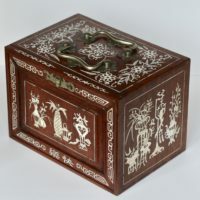 Image showing the back of the box with the fine decorations. 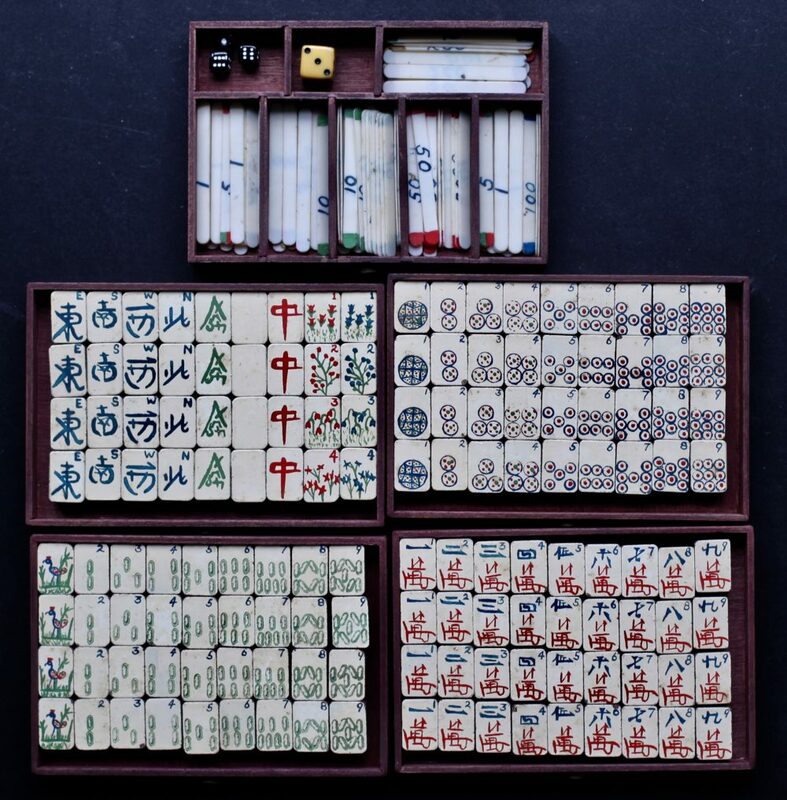 This is a bone and bamboo tile set called Marr John. 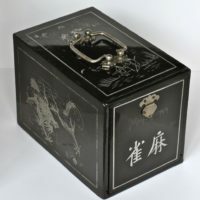 It was sold in the UK and possibly may have been engraved in China as special commission. 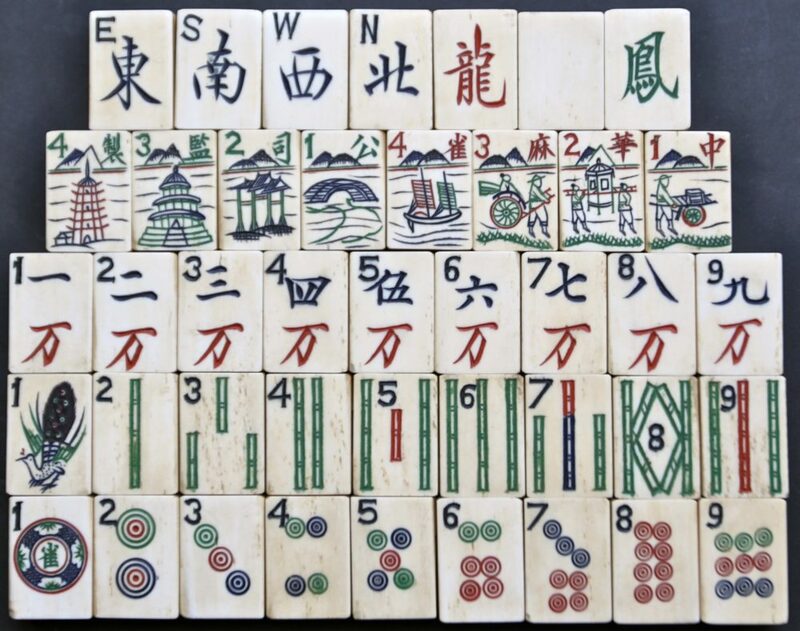 Two sets are known with slightly different motifs. 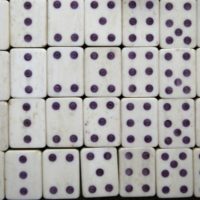 Close up of the 'Circles' suit. 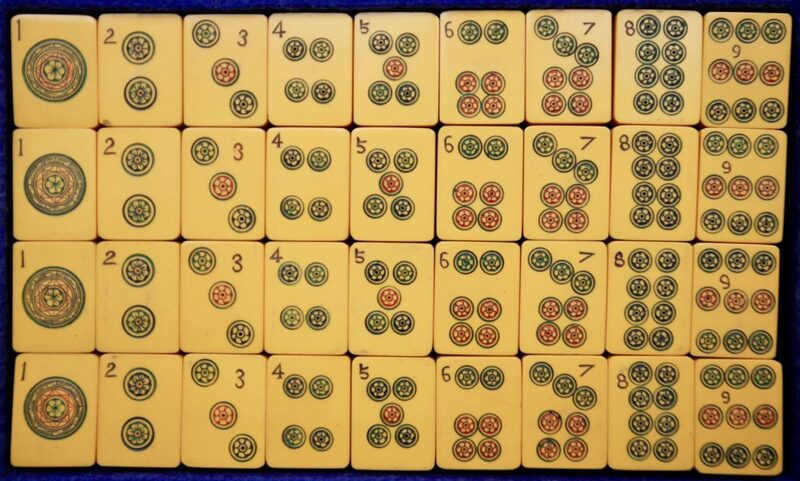 Note the domino-like appearance of the layout of the Circles on each tile. 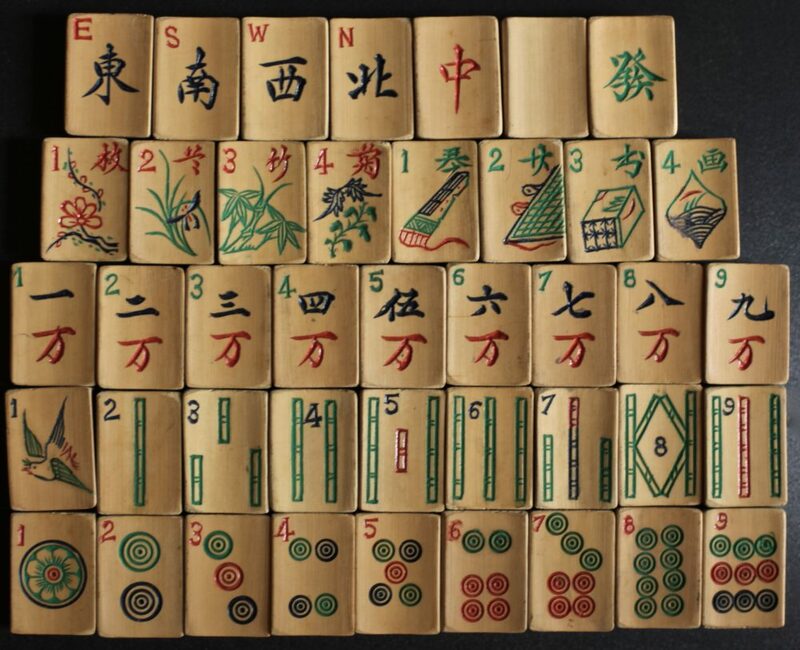 The 'Bamboos' suit. 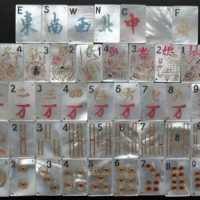 The bamboo rods are very short. 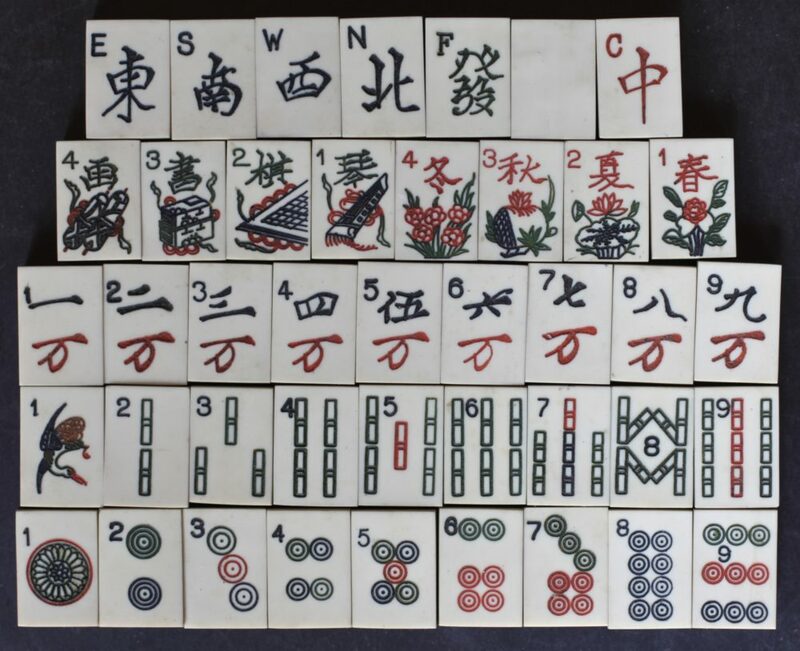 View of tiles on their sides showing the small dovetail joints. 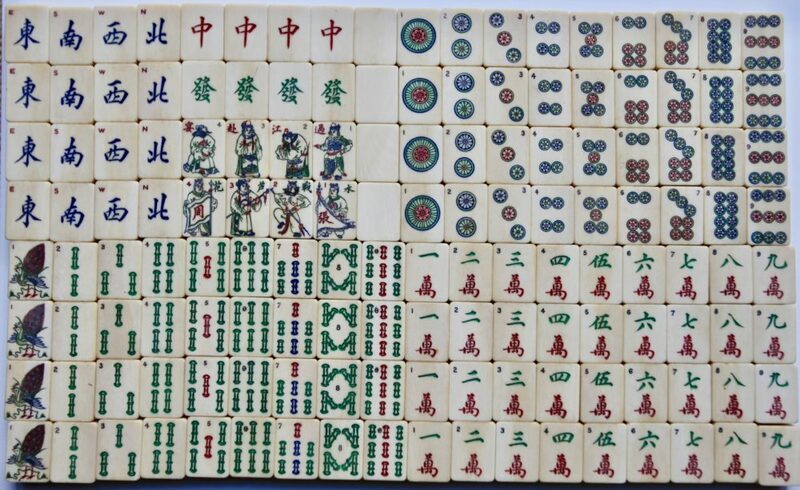 These tiles are positioned on what would be the 'Character' suit. 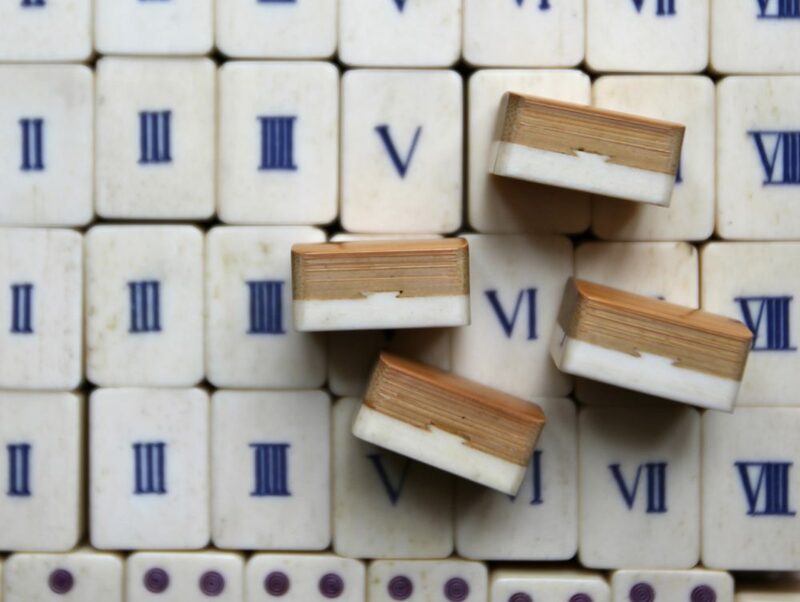 In this case all Chinese notation has disappeared and instead we have Roman numerals. 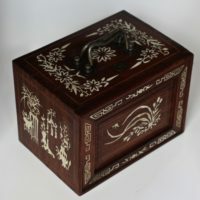 The Winds and 'Dragons' together with the 'Flowers'. 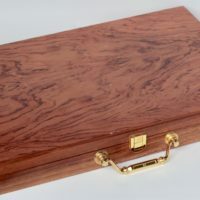 Slide top box. 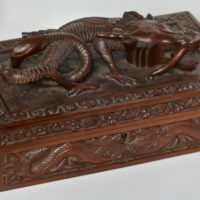 Possible;y made of Padouk or some other Asian hardwood. 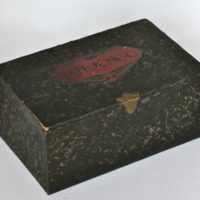 Picture of the end of the box, showing where it was originally purchased. 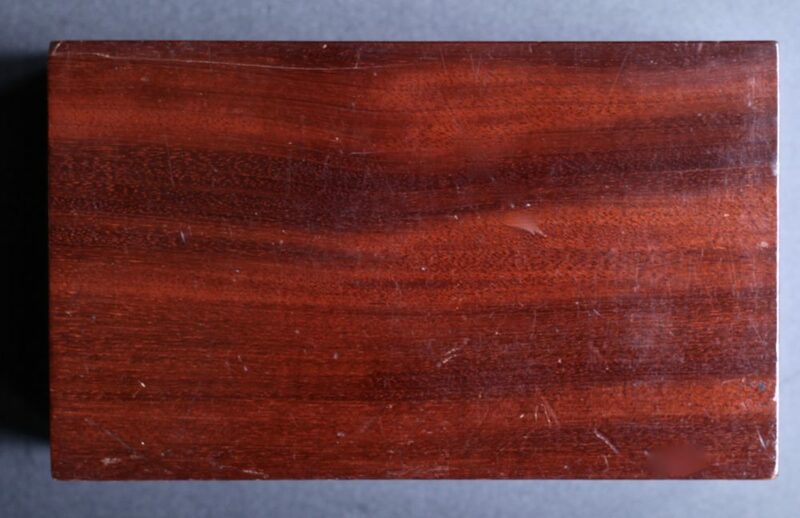 Note the strong dark banding to the wood. 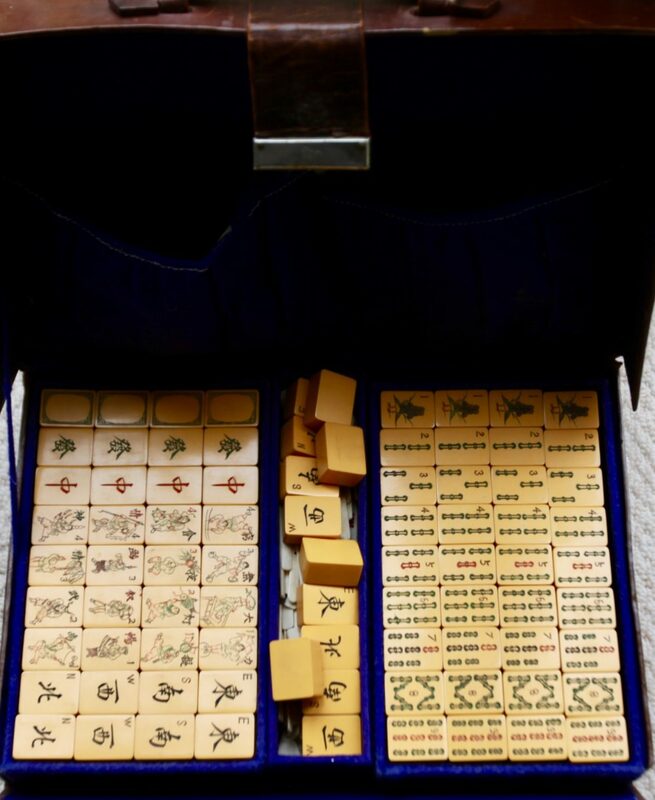 Ivory and bamboo set without box. 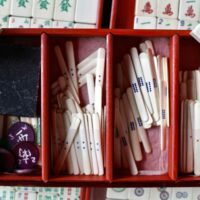 Thick bone and bamboo tiles. 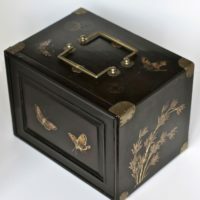 Custom box not original to the set. 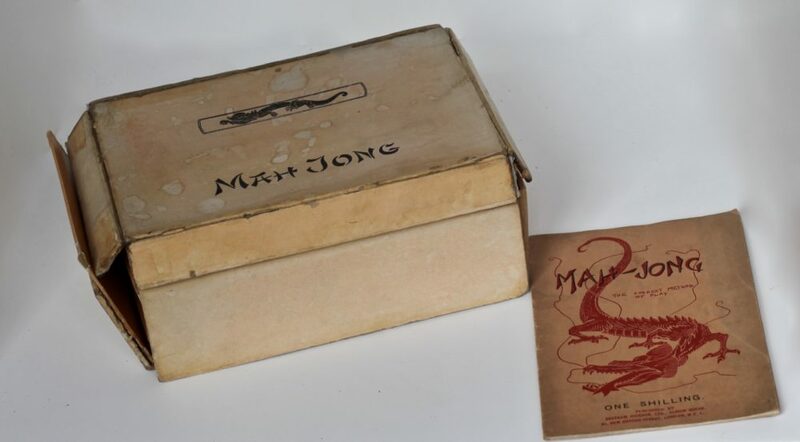 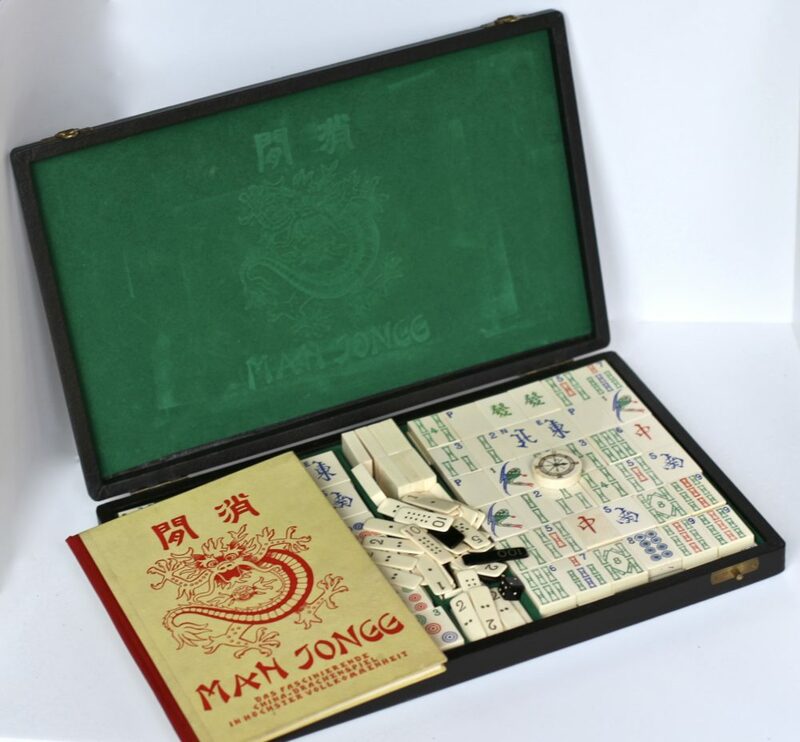 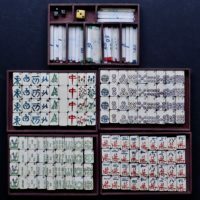 Mah-Jongg Sales Co of America bone and bamboo set. 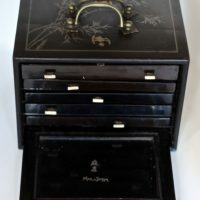 MJ Sales cabinet side view. 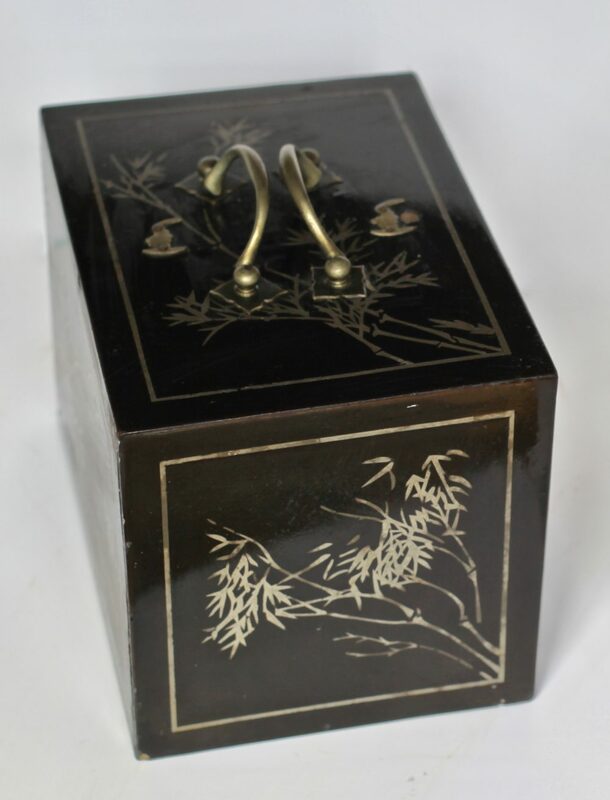 A 16 Flowers Chinese Bakelite set. 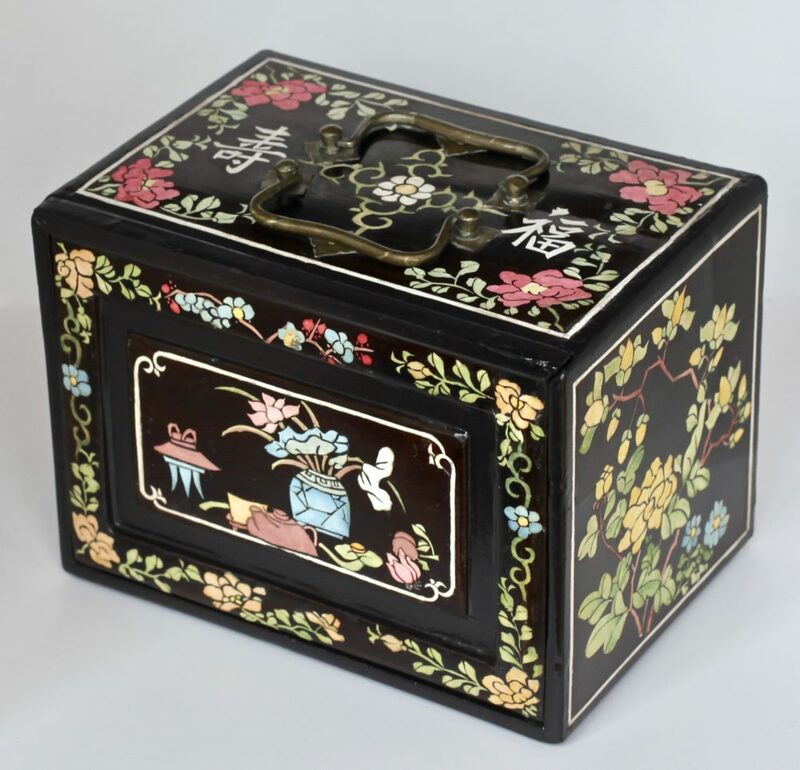 Flowers appear to show some form of entertainment. 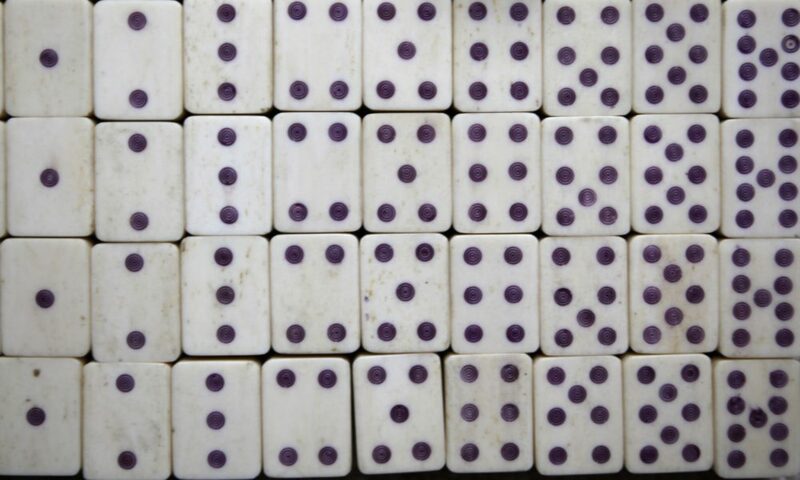 Close-up of the Circles/DotsCash suit. 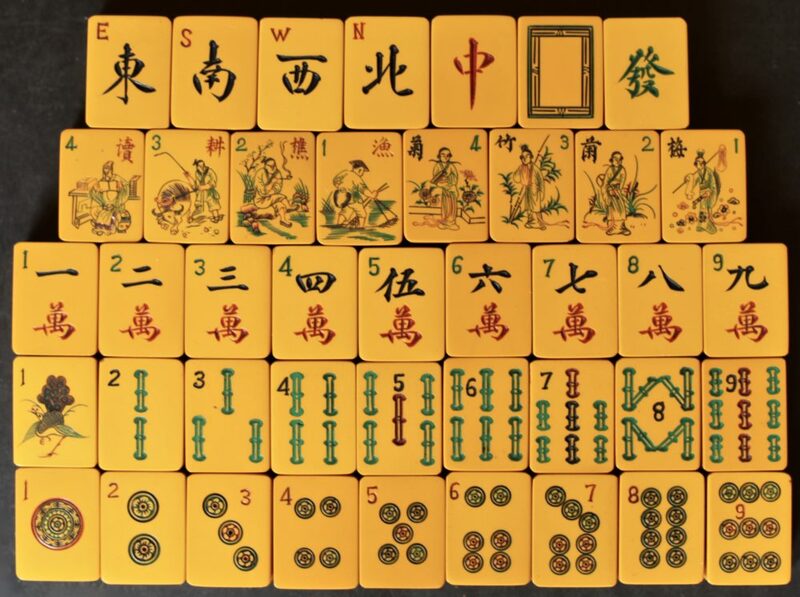 Note the heavily decorated medallion on the #1 tile. 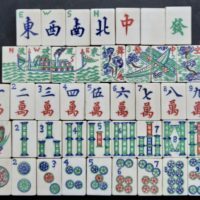 Honours tiles showing close-up of the 16 Flowers tiles. 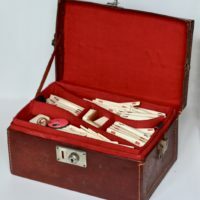 Interior of case showing arrangement,ent of trays. 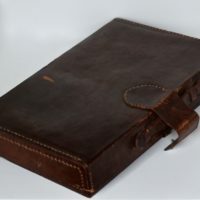 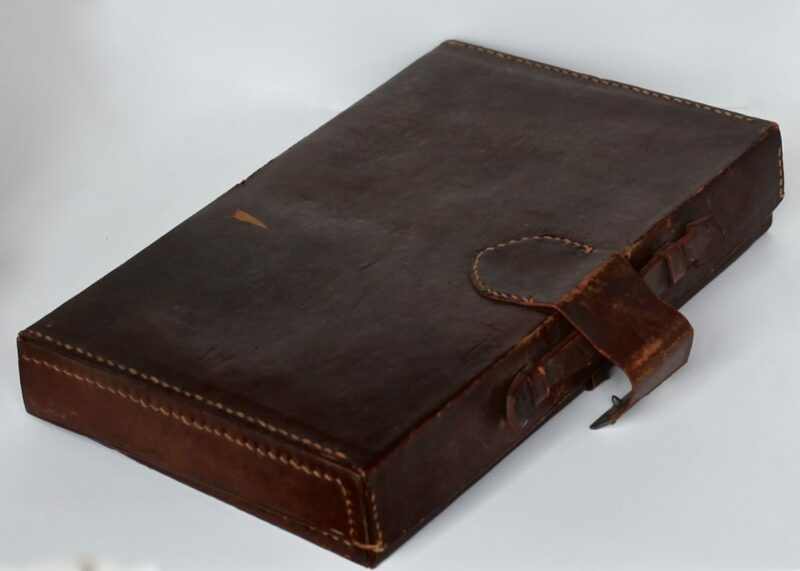 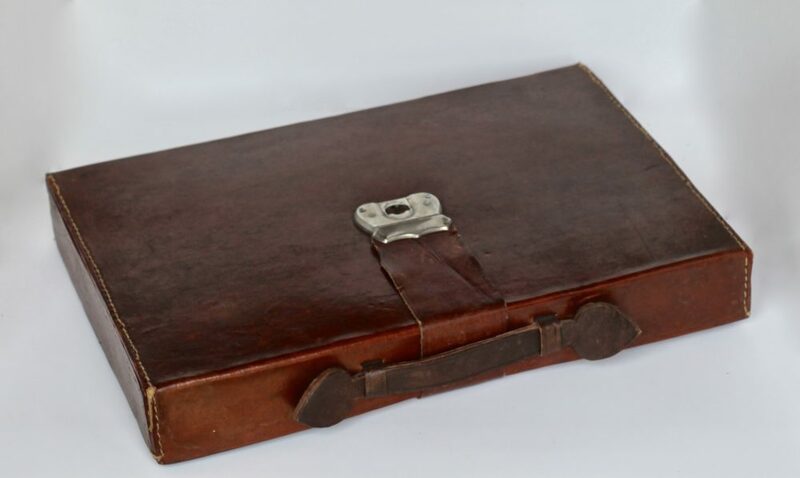 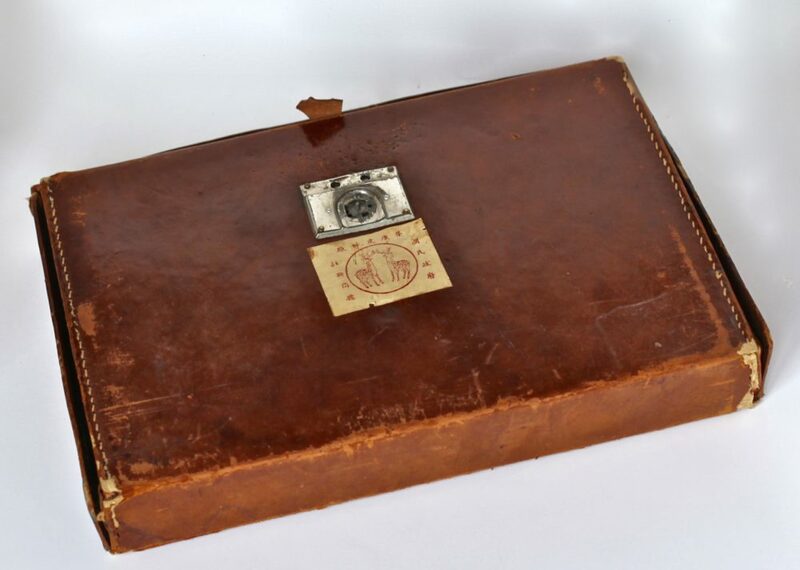 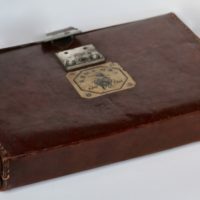 Attaché-style leather case, hand-stitched leather over a cardboard frame.